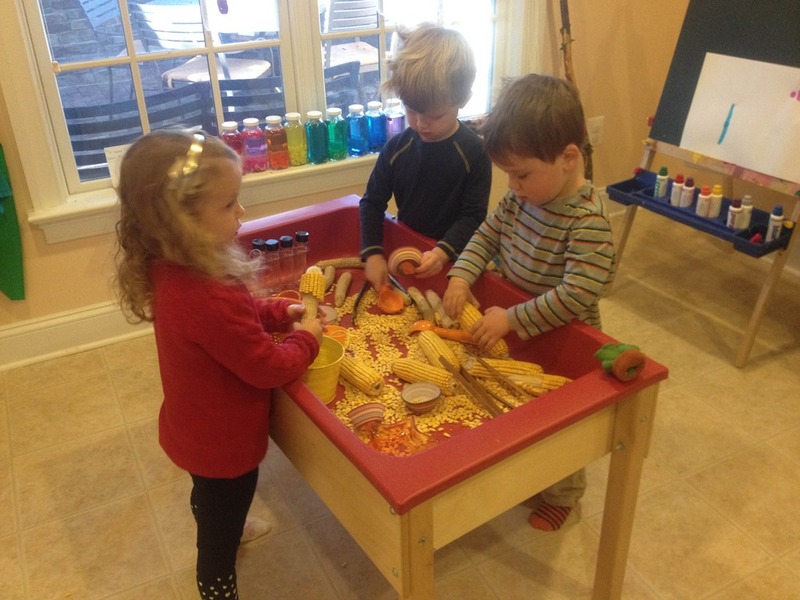 We kicked off November with lots of new learning trays. 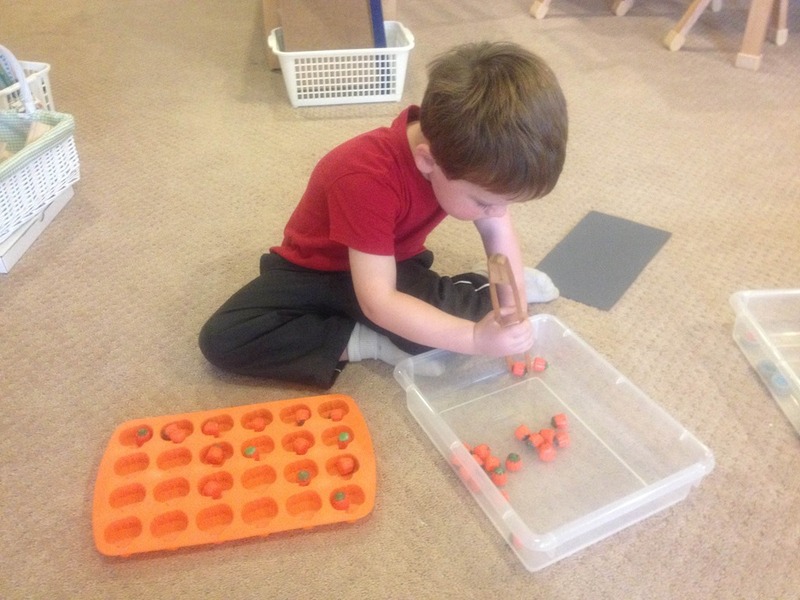 One favorite learning trays was moving mini pumpkin candies from the large tray to a pumpkin muffin tray. 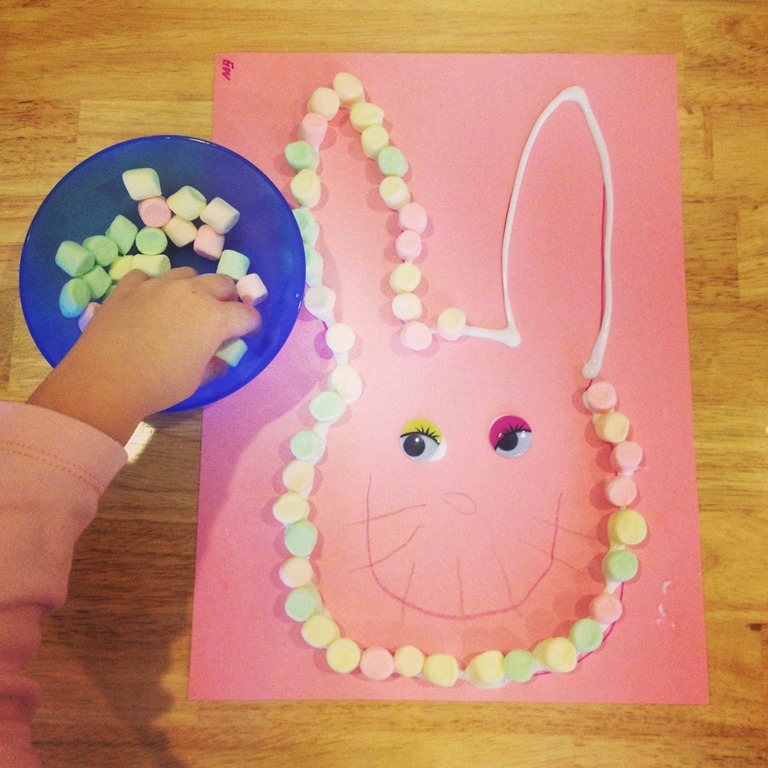 There is something about manipulating candy that is exciting! 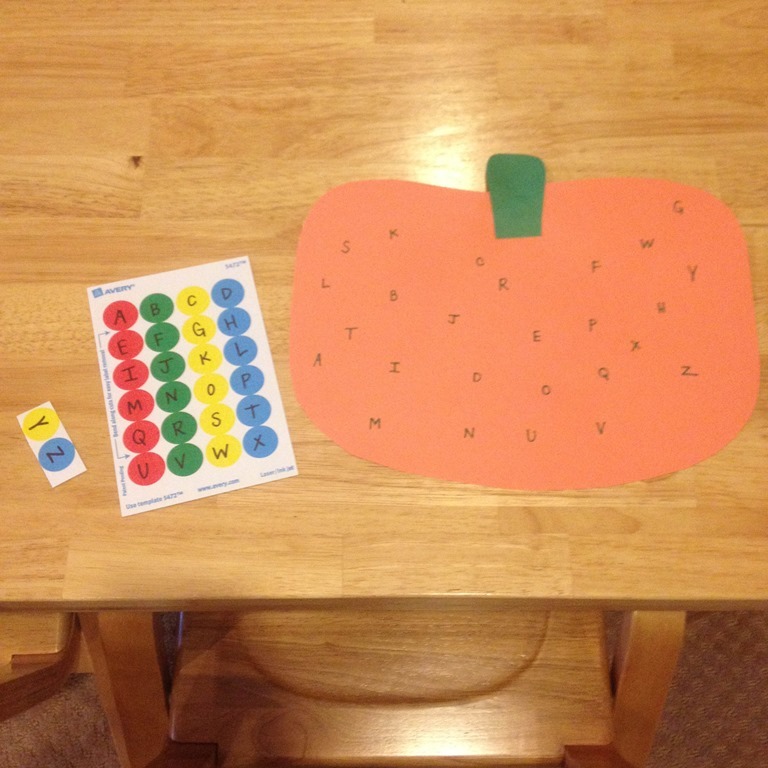 We also matched our letters on pumpkins using stickers. 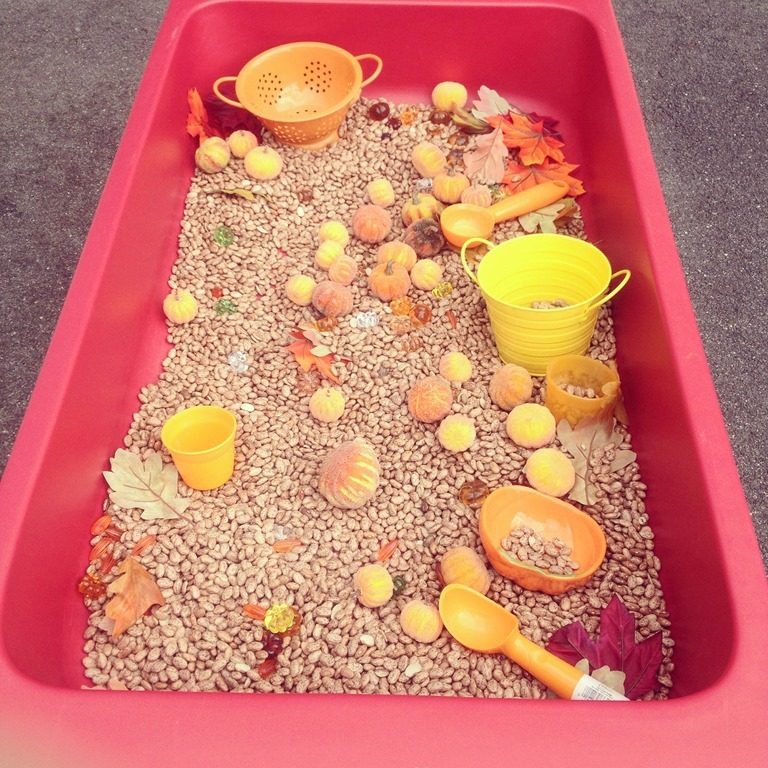 One of the fall sensory tables I set up was full of pinto beans, pumpkins, and silk leaves. 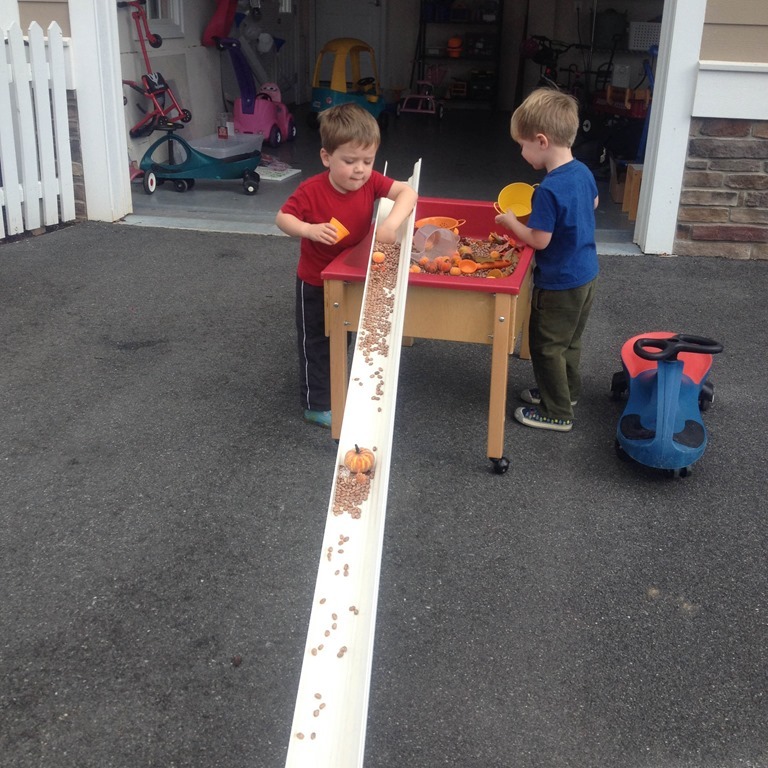 To add some excitement to the sensory bin I put the gutter on the side of the table for the children to explore. They got right to it! It became a “pumpkin factory” among other things. 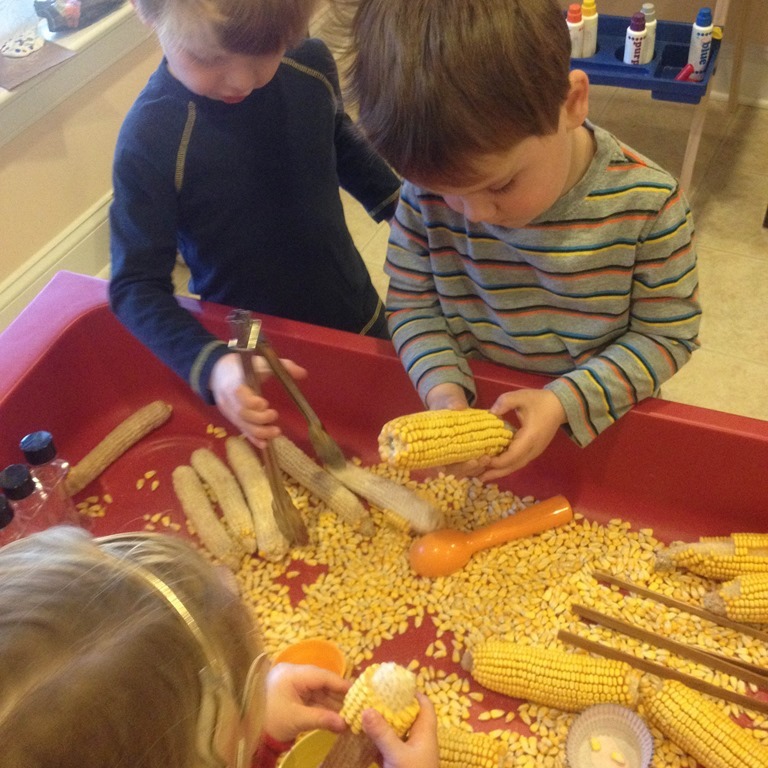 Inside of the classroom I filled up the other sensory tub with dried corn on the cob. 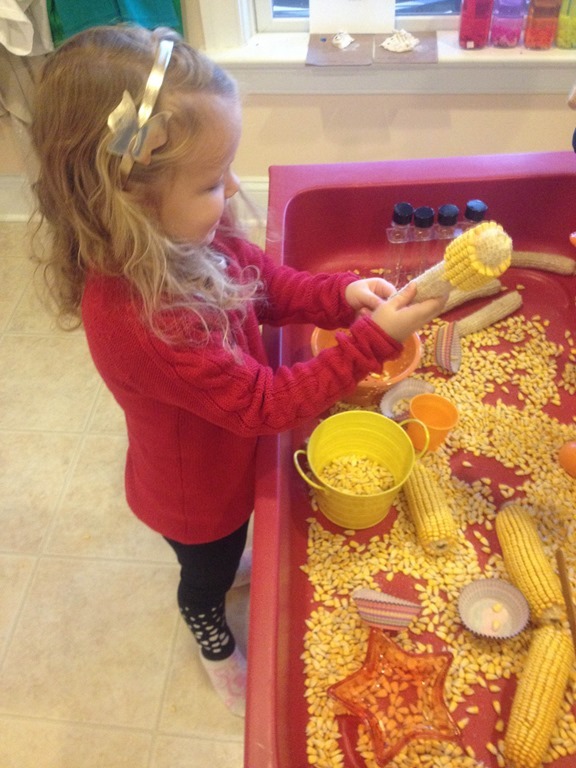 To the corn I added scoops, buckets, jars, cupcake liners, and tweezers. 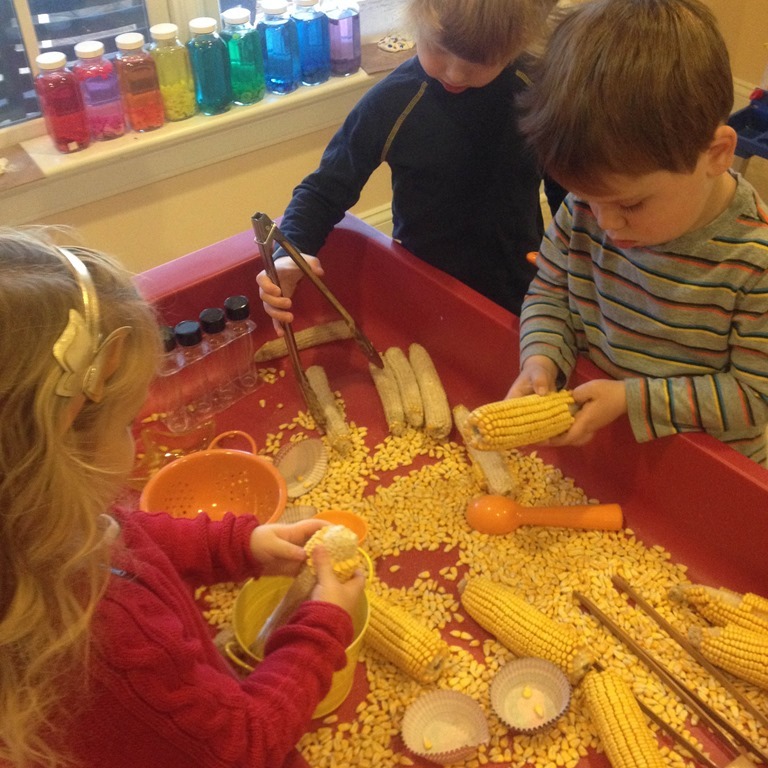 The children spent a lot of the morning picking these corn cobs apart. 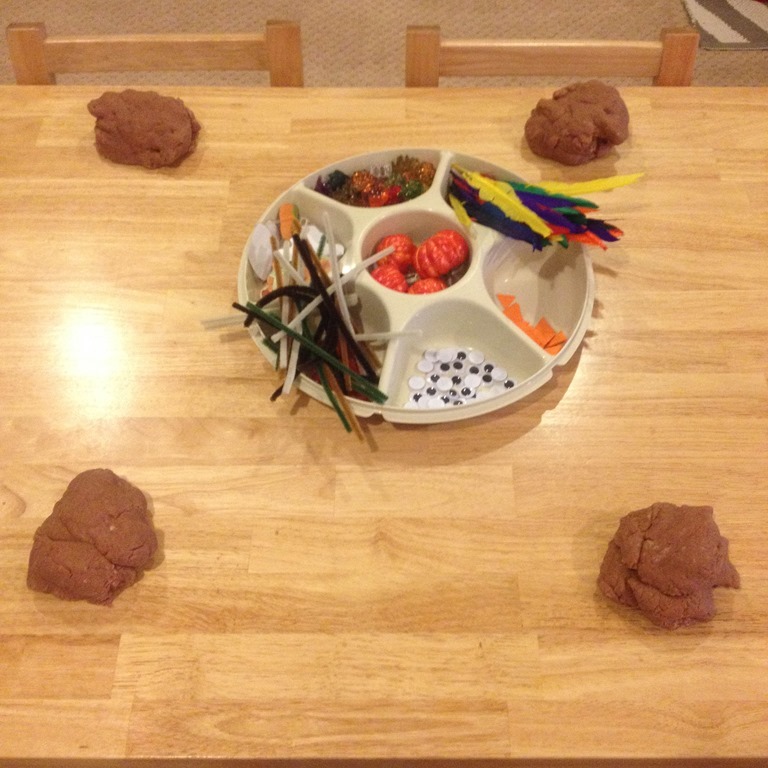 We also spent a lot of time making turkeys from our wonderful smelling fall play dough. They knew just what to do! 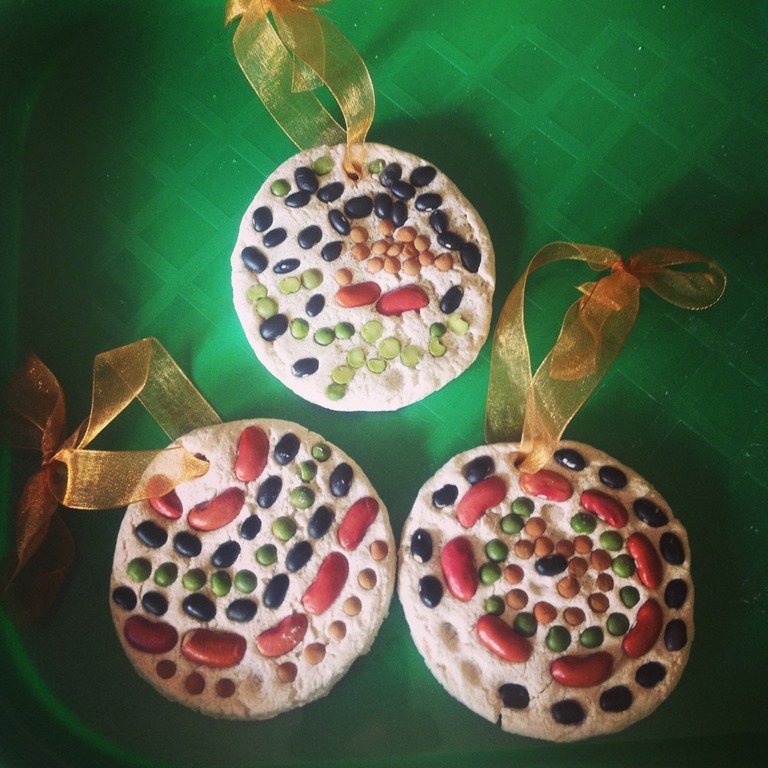 We made some beautiful Thanksgiving themed salt dough ornaments. 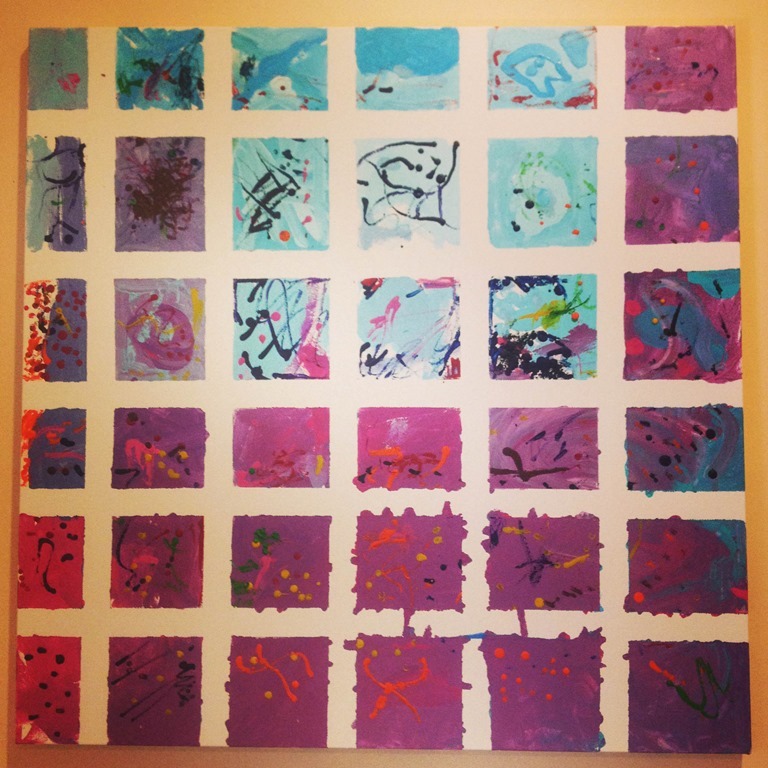 We worked on this canvas over a series of days in the classroom. 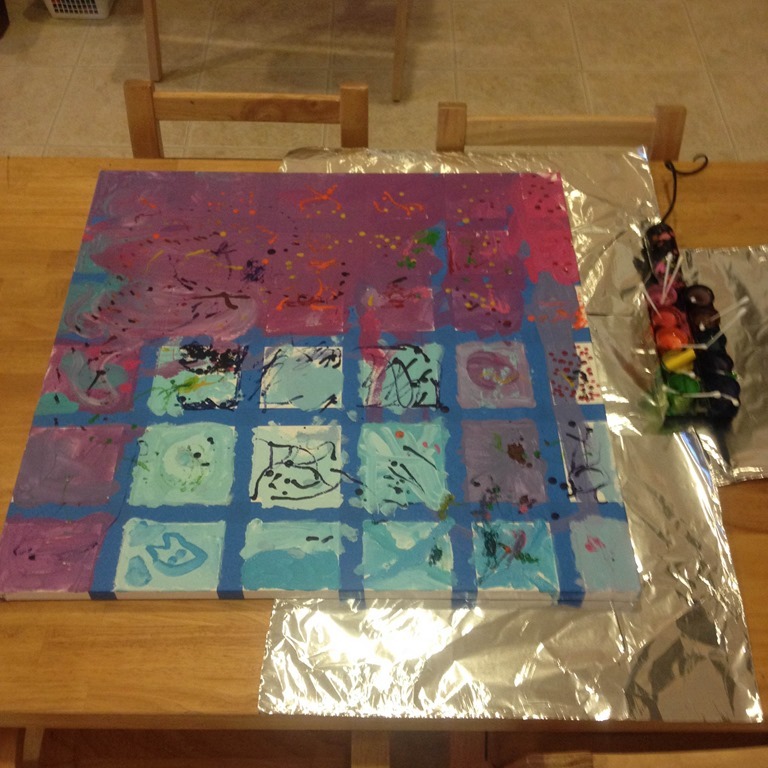 The first day I sectioned off the canvas into squares, and offered a number of paint choices. 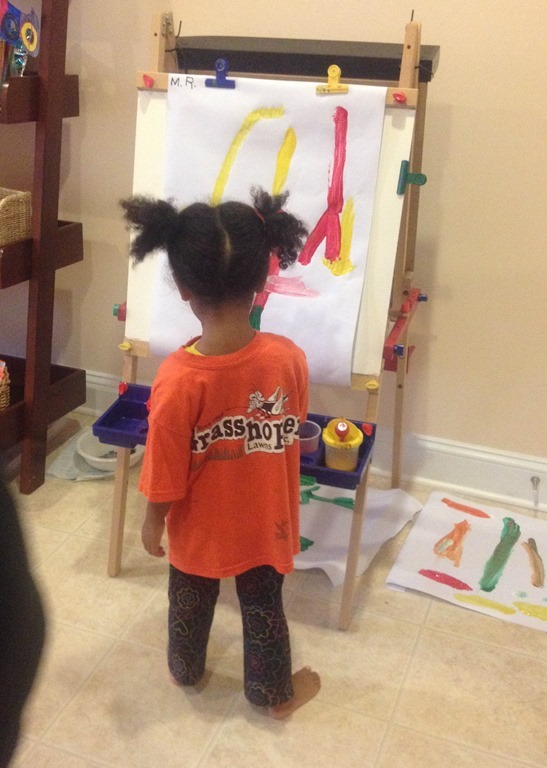 After giving the kids a few days to pain the canvas, then I offered them the crayon melting machine next to the canvas. 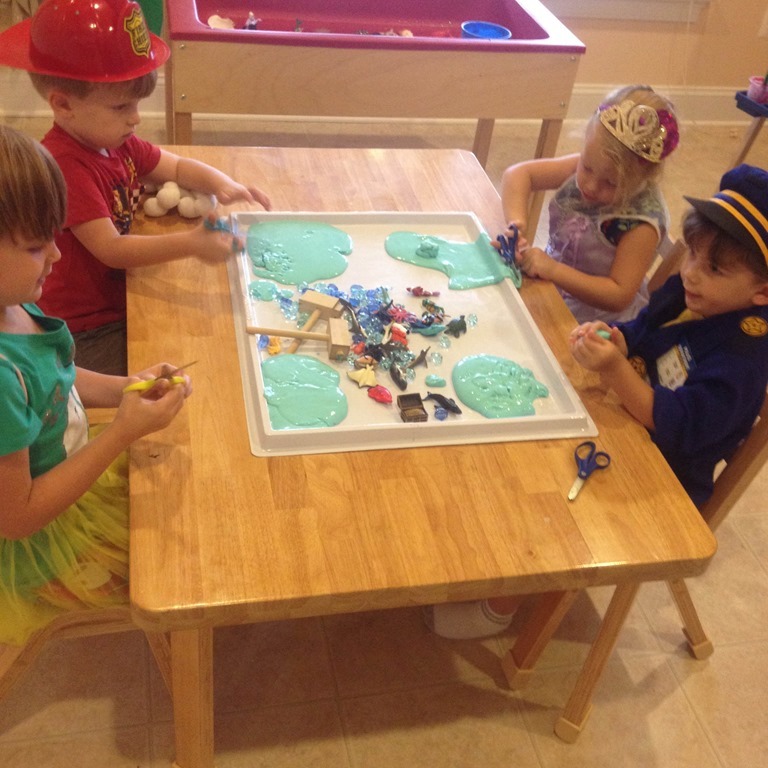 They dripped and dropped melted crayon all over the canvas. The final product was lovely and it is hanging in our art room now! 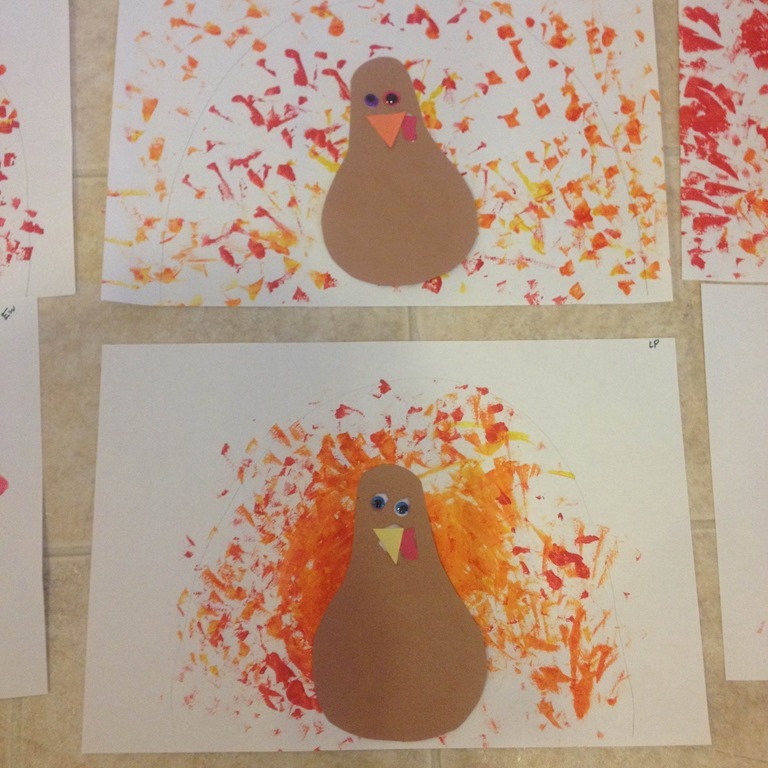 We used the paint blotters to make some really wild turkeys! 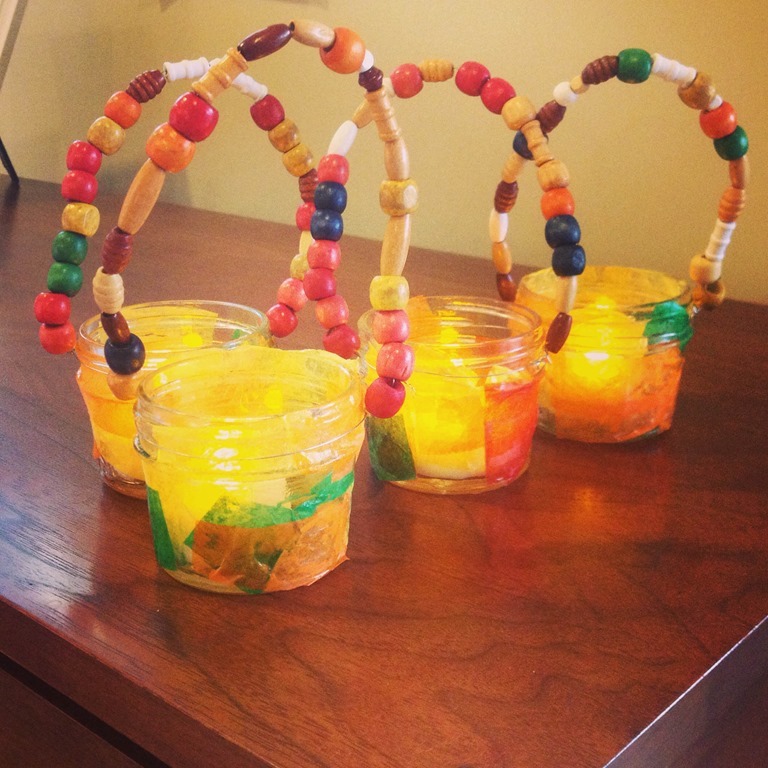 They also made some beautiful Thanksgiving tea lights with handles this year for their Thanksgiving dinner! 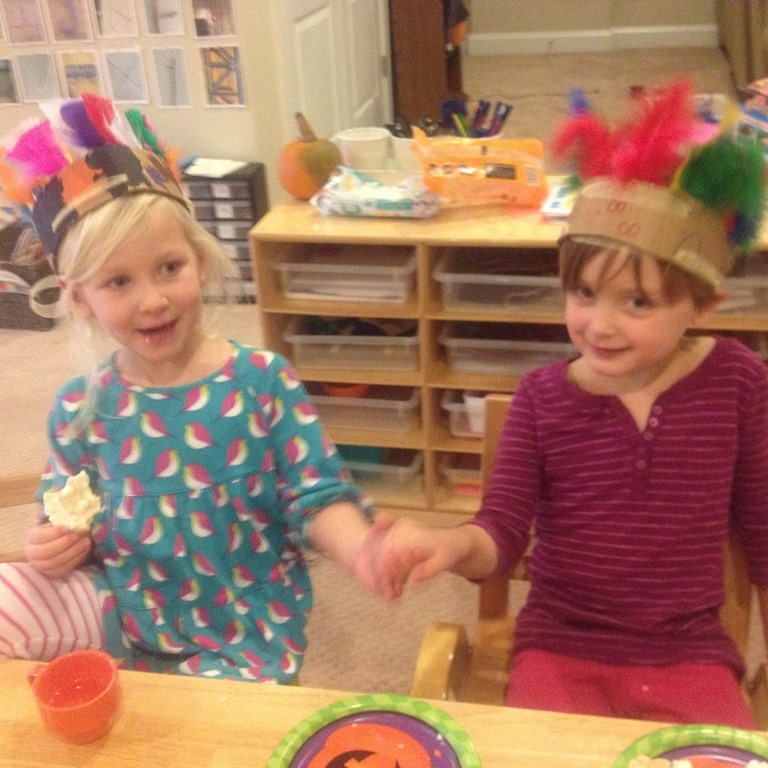 After reading a number of books about the Pilgrims and the Indians and the First Thanksgiving we also made some gorgeous Indian headbands for our mini Thanksgiving Feast! 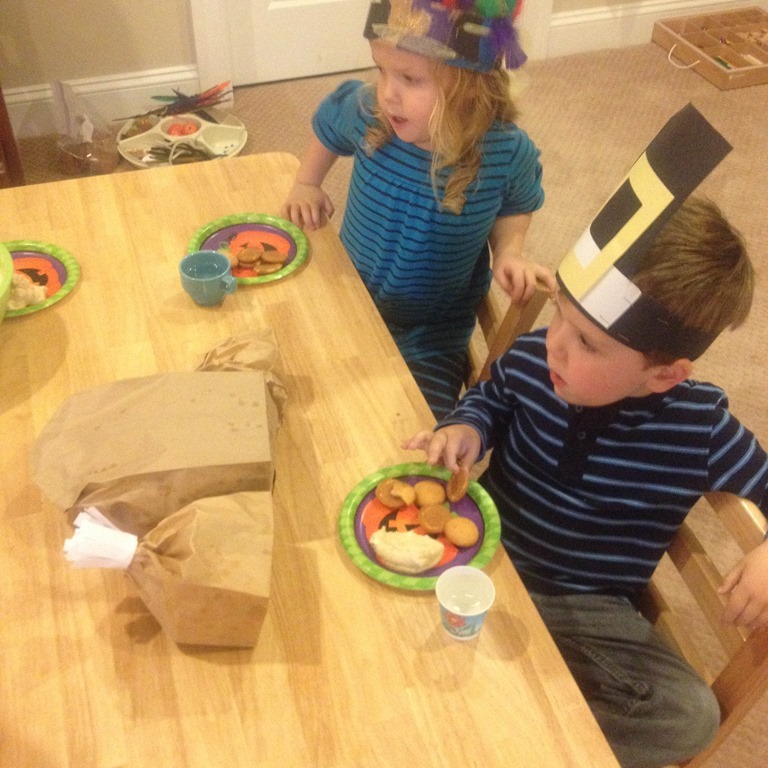 The children chose to wear their Thanksgiving headbands or their Pilgrim hats to our feast. 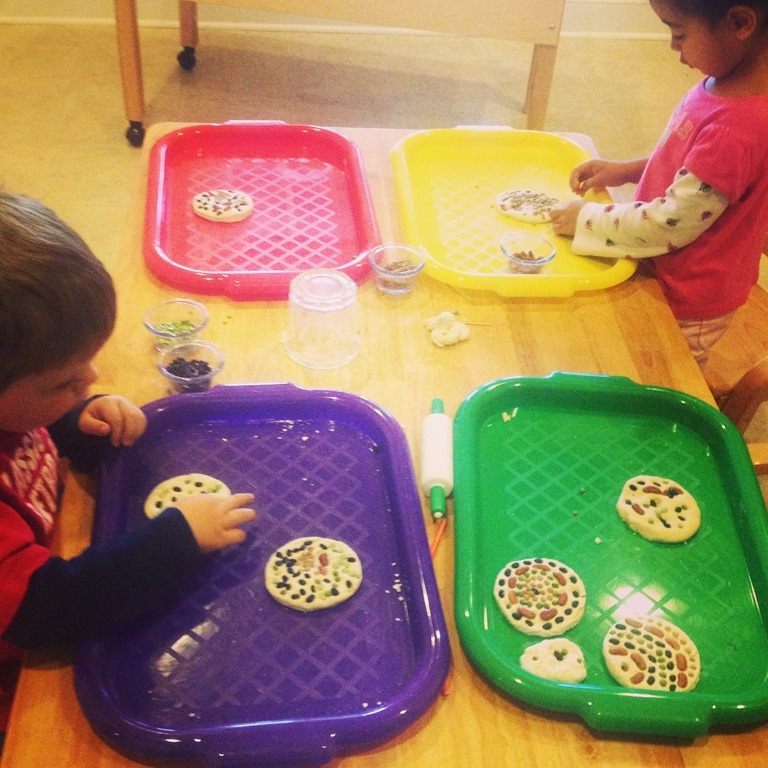 We ate pretend popcorn turkeys, made our own pumpkin fluff (which only D ate), and decorated some Thanksgiving cookies. Love this little group to pieces! 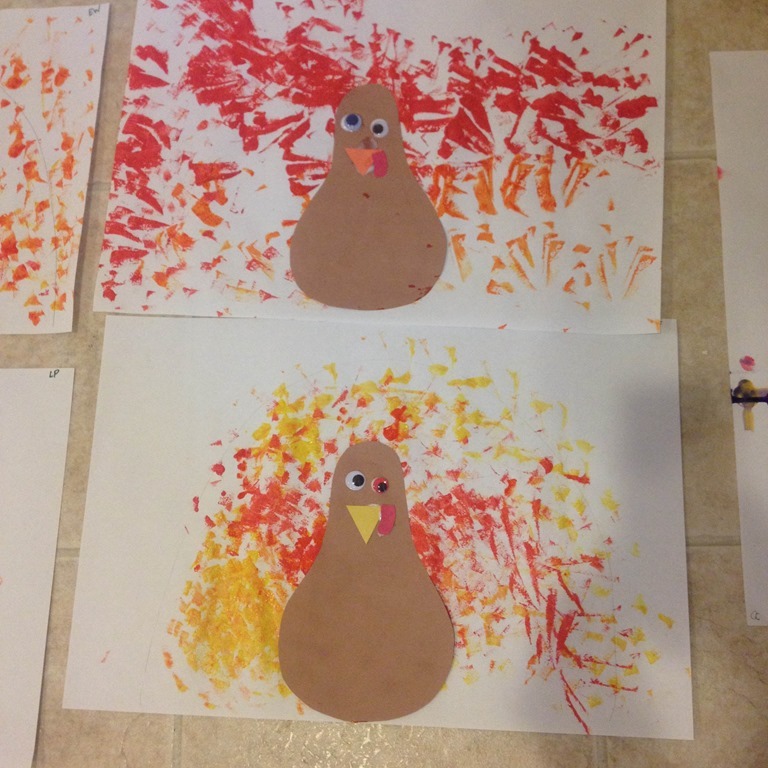 Categories: process art, thanksgiving | Tags: first thanksgiving, holidays, process art, sensory bins, sensory play, thanksgiving, thanksgiving crafts, turkeys | Permalink. 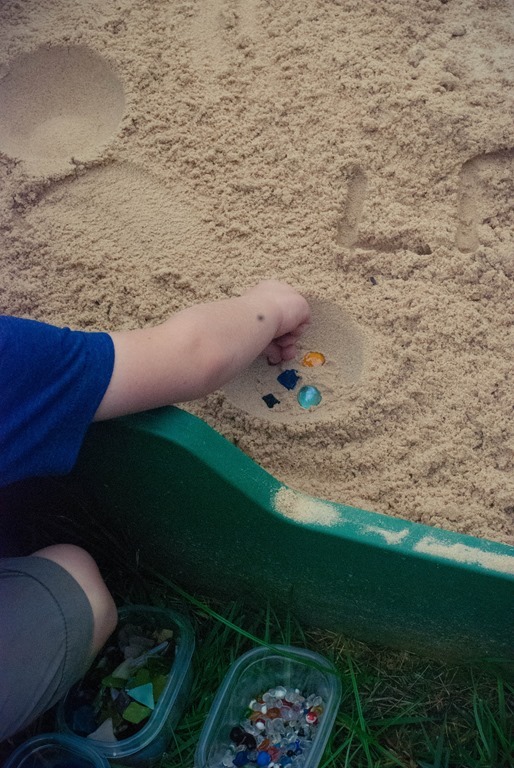 My children and I spent two weeks at the beach this summer, and I really wanted to kick off the school year with all things “beachy.” Most of the children in the classroom have some relationship to the beach, memories from the beach, or have played in the sand. 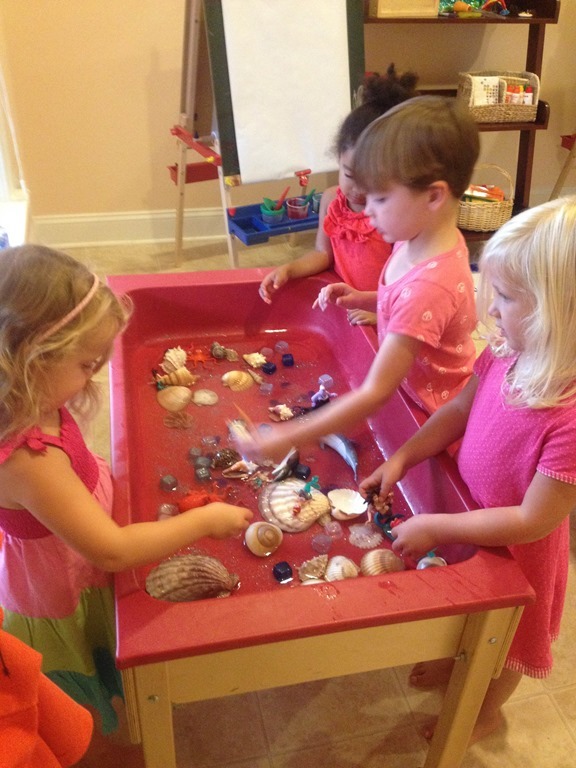 All children seem to be fascinated with ocean animals as well! They are so vastly different from us, I can see why! 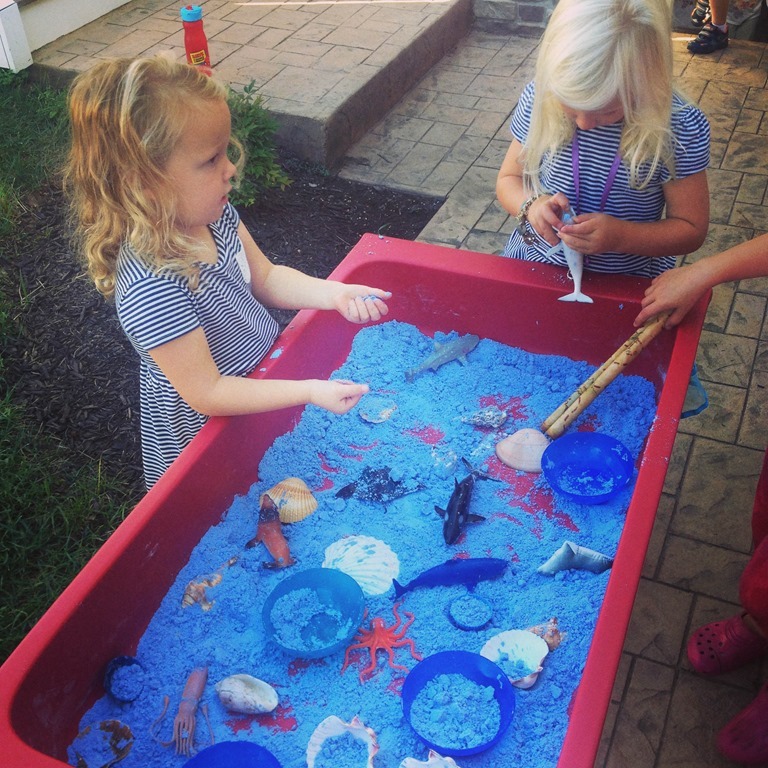 This post is packed full of some of the activities we did about the ocean the first two weeks of school. 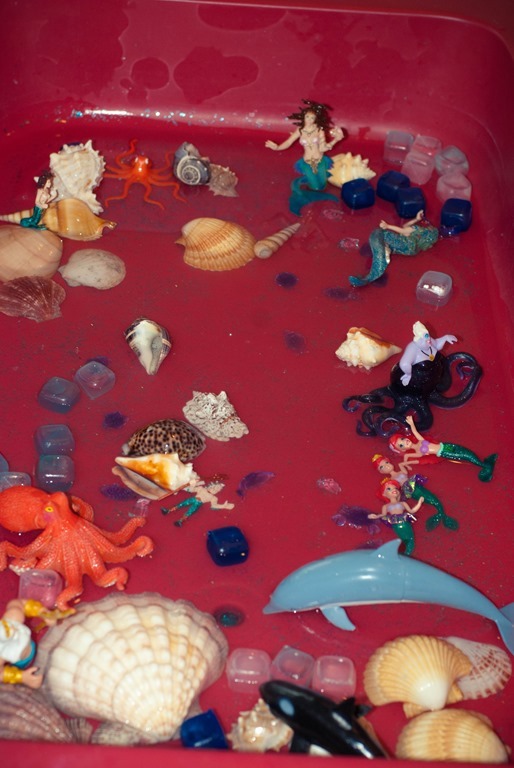 One of the sensory tubs, that is actually still open this week because it was so popular is the mermaid lagoon. 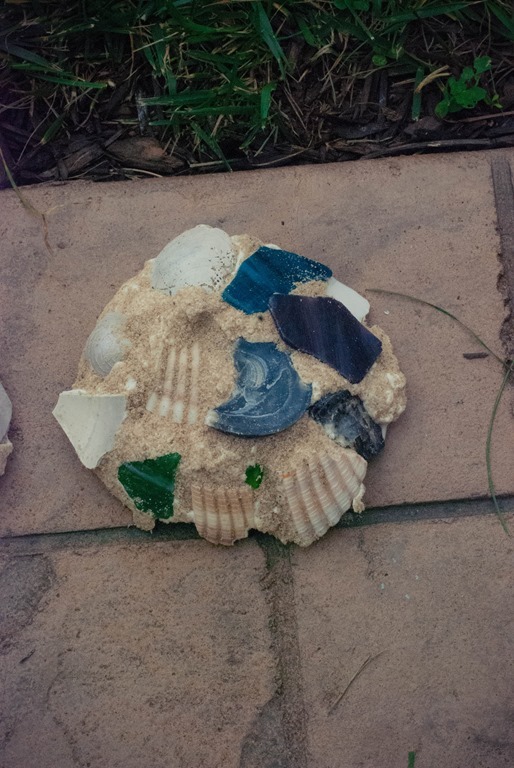 The addition of Ariel and lots and lots of seashells has made this a popular place. Cloud dough is a wonderful silky smooth sensory material. It is a combination of flour and oil that makes a substance that will hold its shape, but can be manipulated easily. 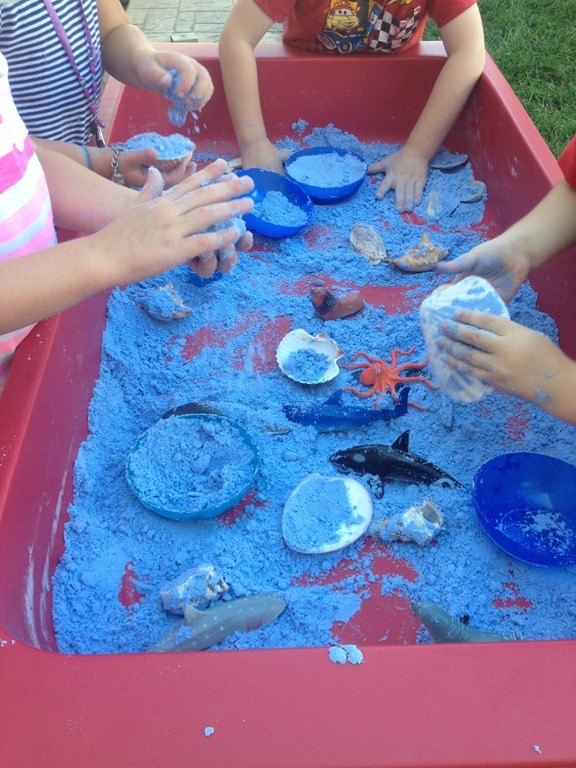 I added blue powdered paint to our cloud dough to make it more ocean-like! 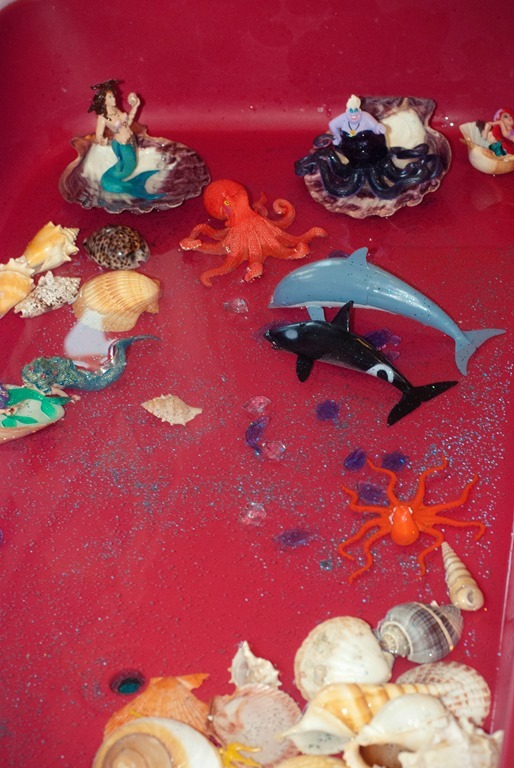 I added large sea shells and larger ocean animals to the cloud dough. 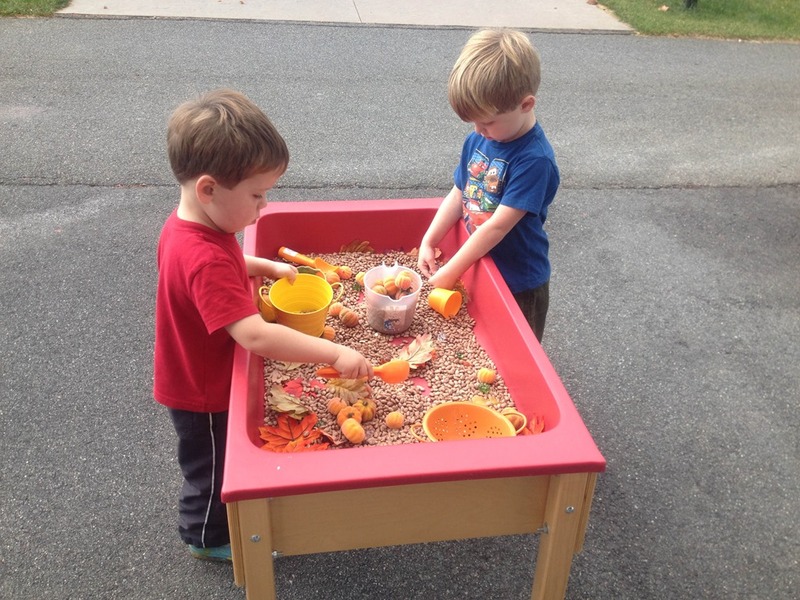 Bringing the sensory tubs outside has really allowed the children to enjoy them in the beautiful weather. 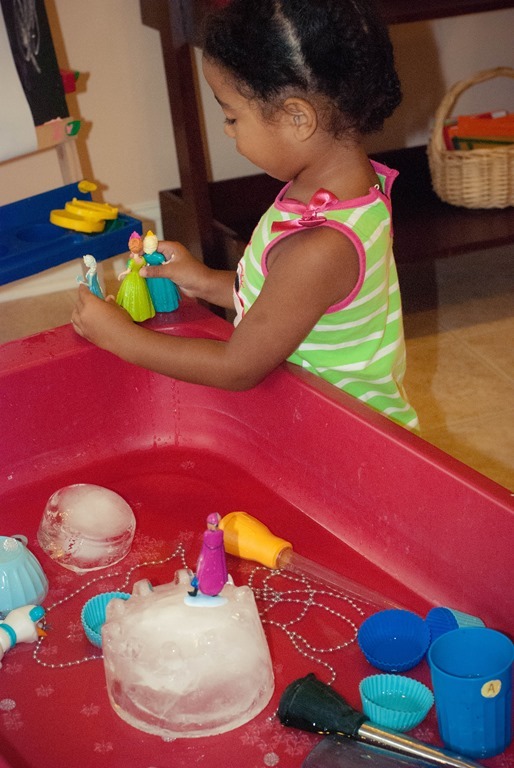 The first week of school Ms. Lori and I had a lot of fun watching the children interact with this Frozen themed sensory tub. I froze different sized blocks of ice in the deep freezer each night. 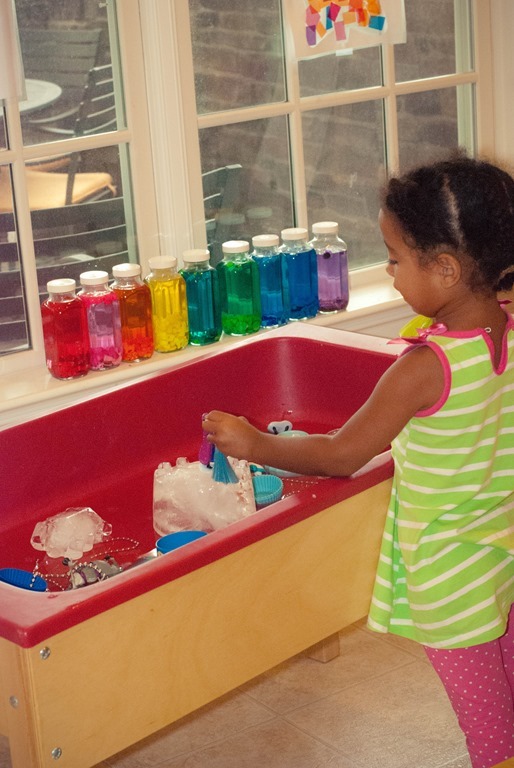 Once choice time started Ms. Lori would pop all of the ice blocks out and let the children play with the Frozen movie characters in the sensory tub. 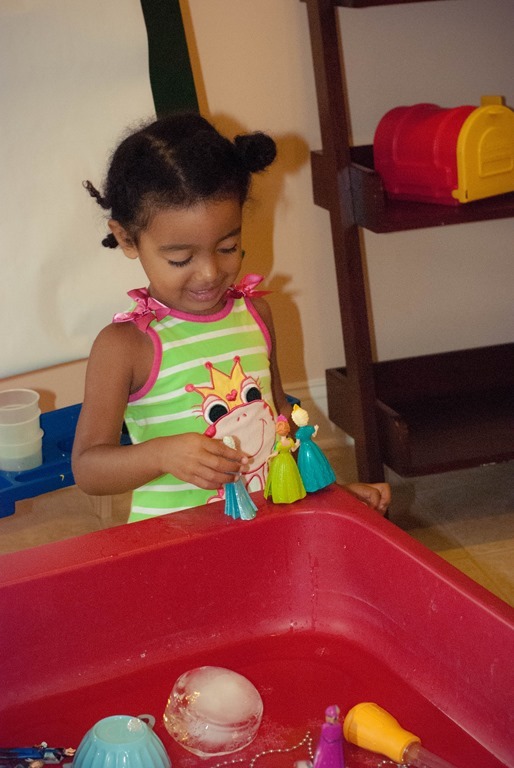 I added silver beads, charms, and snowflake beads to the water to add to their imaginative play. 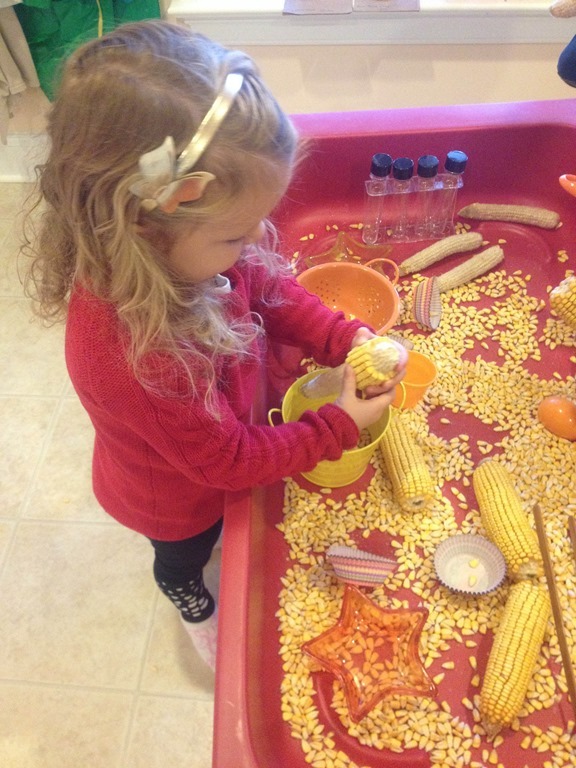 M probably spent two full mornings at this tub, and it was so sweet to see her playing pretend on her own for such long periods of time! That is the exact purpose of these tubs! 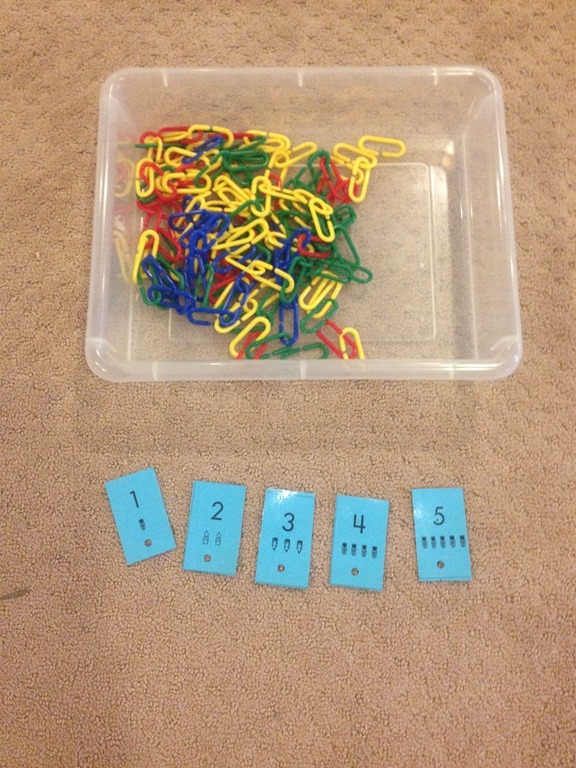 Last week I called over children one at a time to work on their number sense. 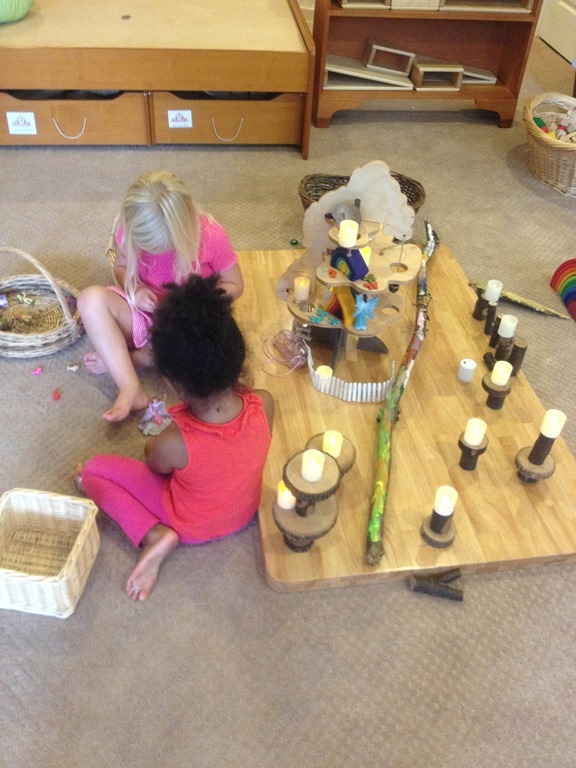 This is the first time they had a chance to use the “links” which was a learning process in itself to get them linked up. 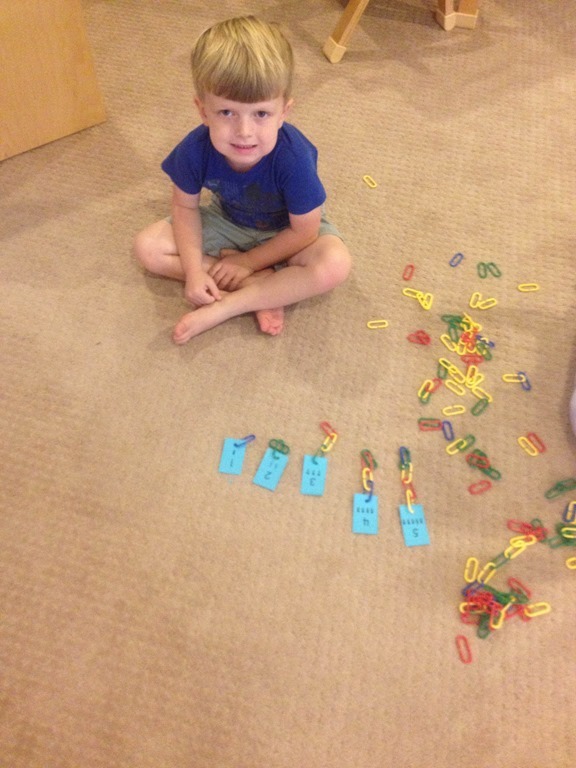 Here is a picture of L with his linked up number lines. I had number cards with a hole punched in them. They have to create the correct length chain and attach it to the number card. 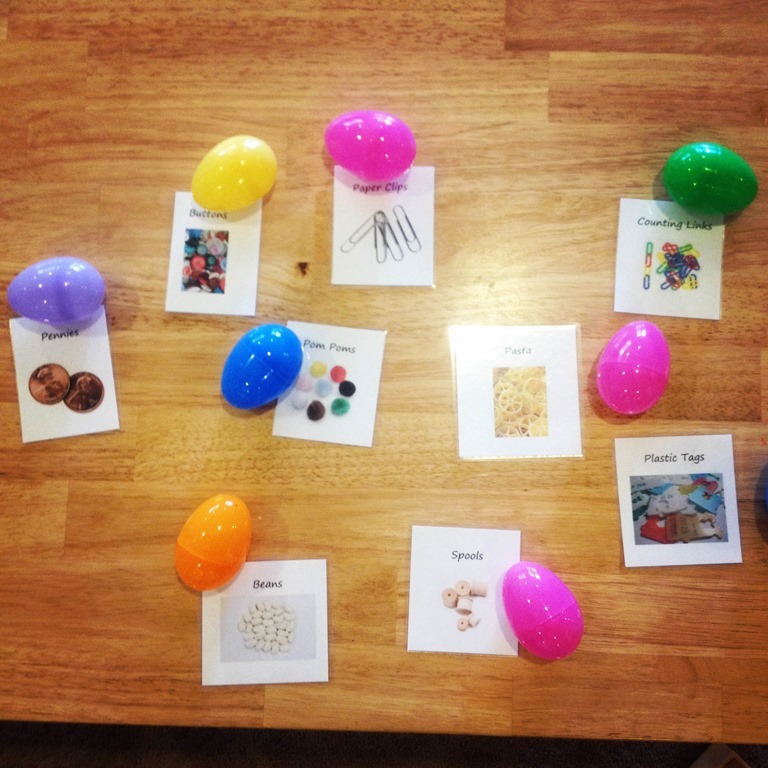 Each child had a chance to work on this activity with me last week. 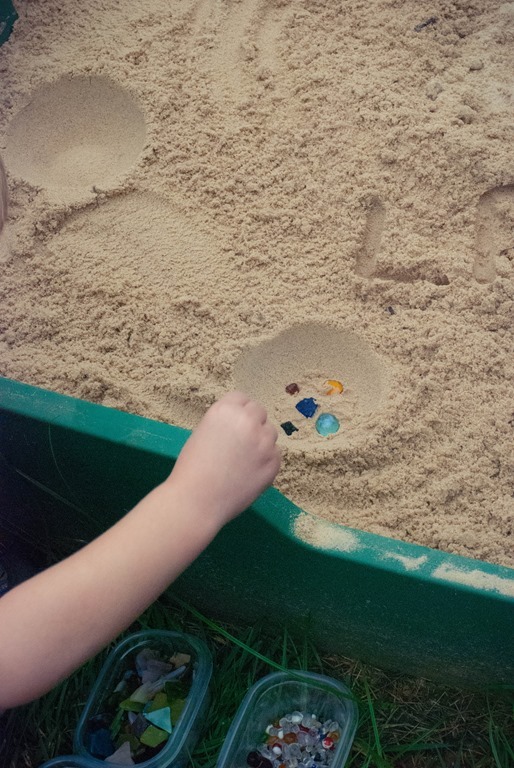 I have enjoyed watched the children really interact with the materials so far this year. 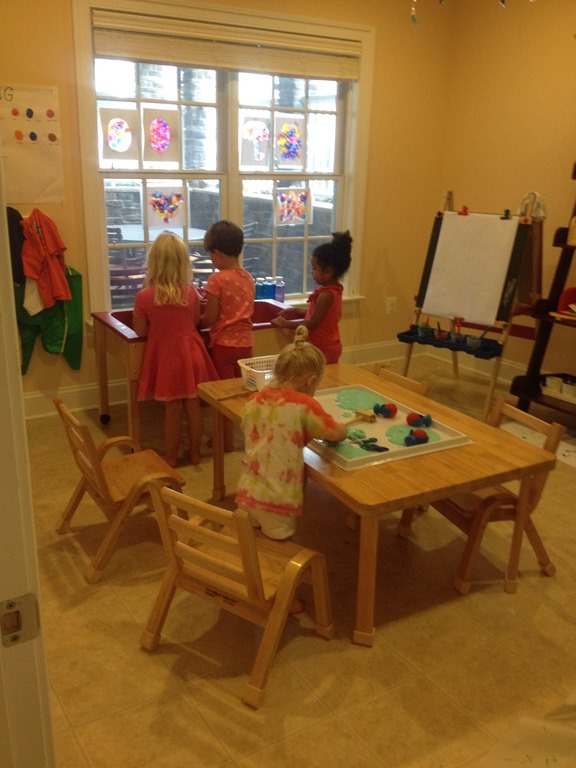 They have gotten out more of the blocks and manipulatives in the block area then ever before. 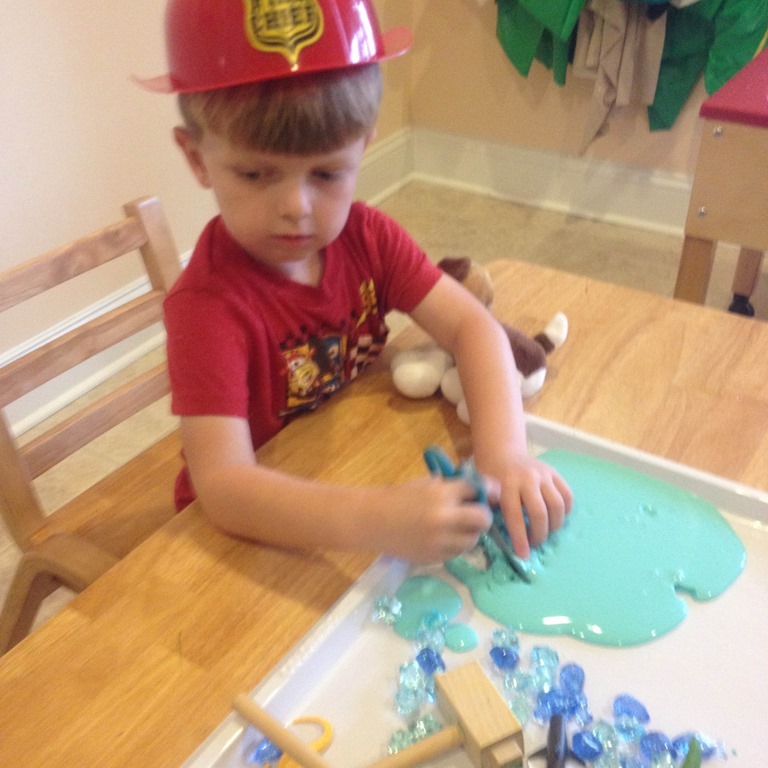 It may be their growth and development from last year, but the easy access to the materials is helping aid this interest. 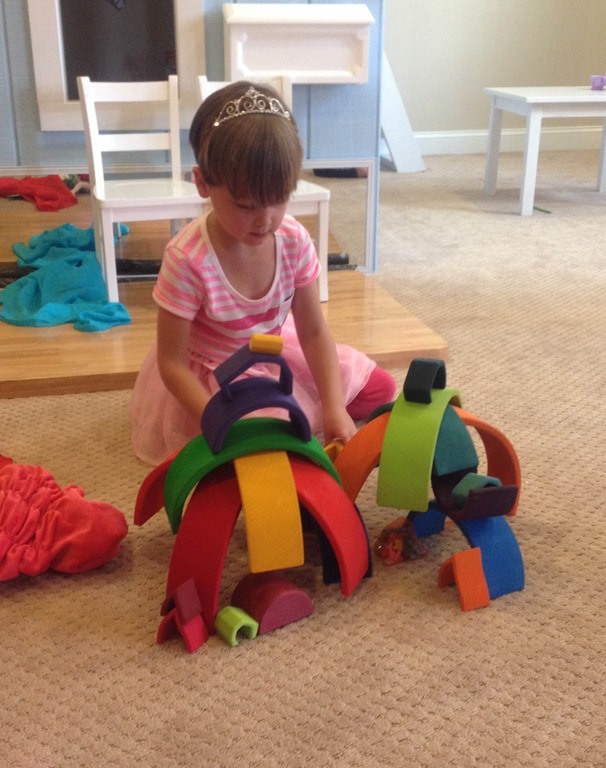 M spent a lot of time last week working with the rainbow blocks. Here is one of his master creations. I love seeing the younger students watching in awe at his building skills! 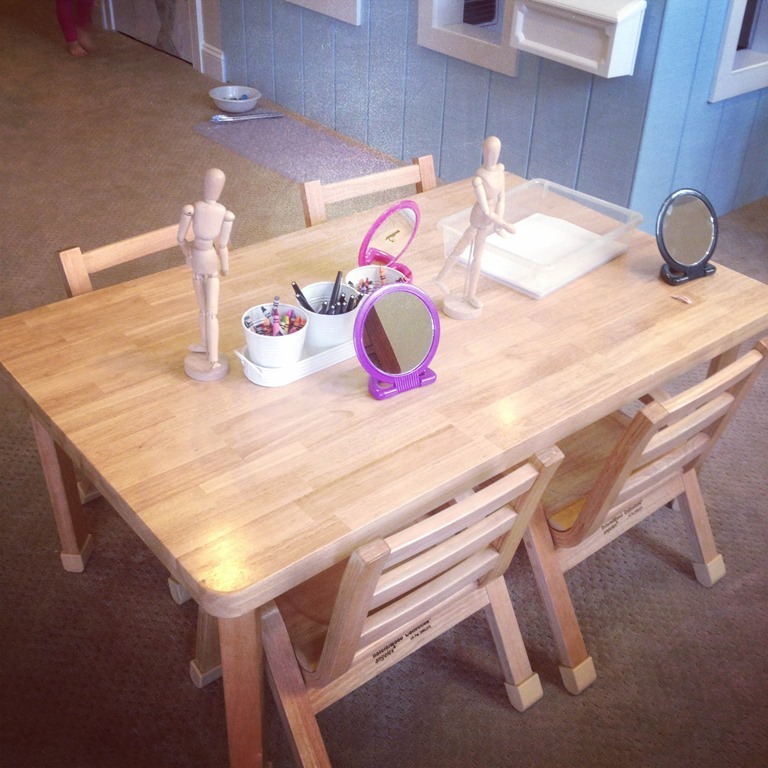 We added some new materials to the light and shadow area this summer as well. I also added a book shelf to store the array of materials I had accrued last year for this part of the classroom. 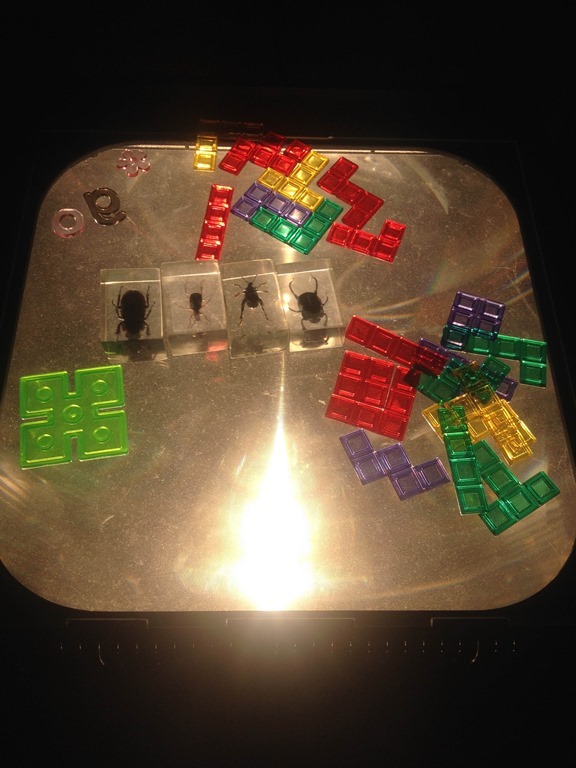 The shelf holds Widgets, Blockus blocks, ABC see through pieces, flashlights, magnitiles, X-rays, and these new insect blocks. They are quite creepy, but the kids have enjoyed examining them! 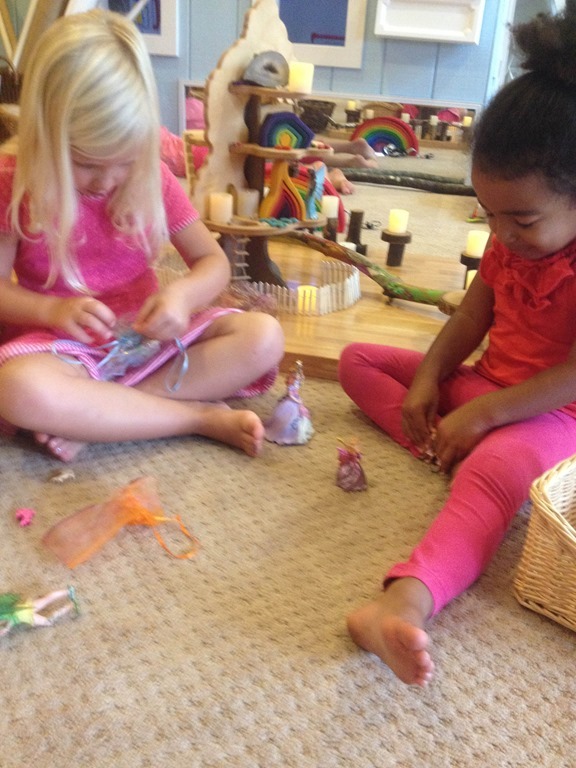 The fairies and their friends have also been an exciting new discovery the past two weeks. 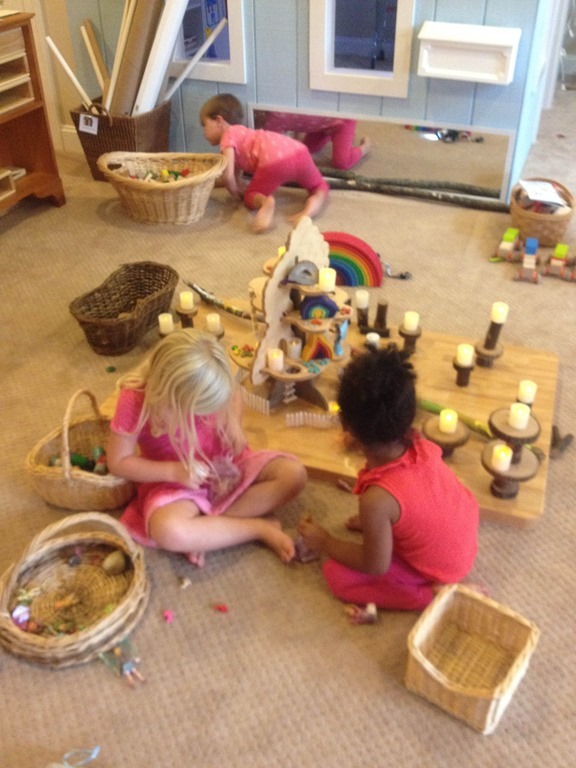 M had lined up all of the peg people on the fairy house, and was arranging the blocks underneath. Unfortunately I didn’t get a photo of the process that went into creating this fairy world. M and E spent a good part of the morning creating this land. Everything had a purpose. The line of trees to the bottom were the “dark forest.” And the bark painted yellow was the bridge to the rainbow to get through the dark forest. It all had a part in their play. 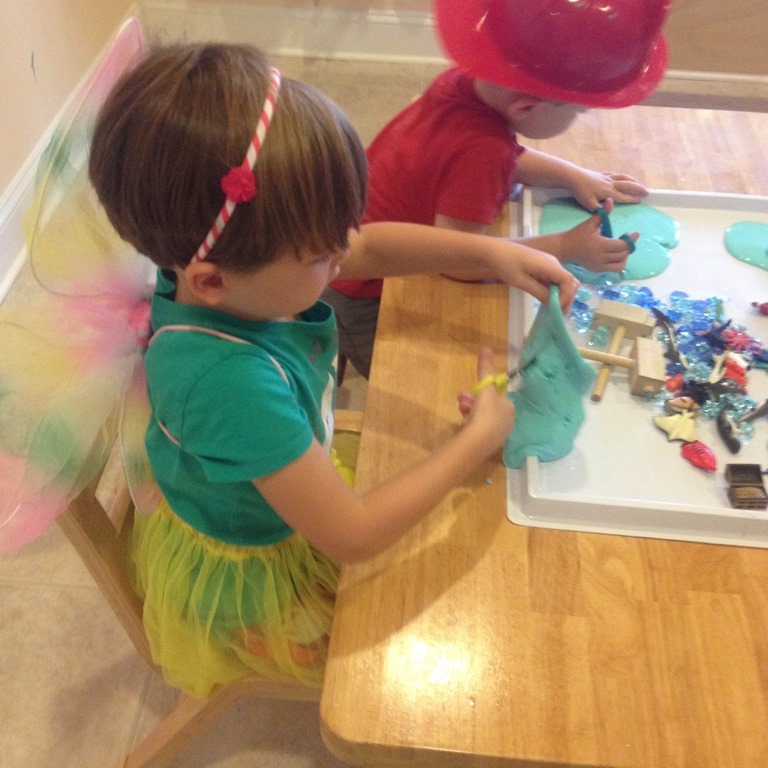 After they were finished creating, MH had another story line going with snails and them disrupting the fairies. 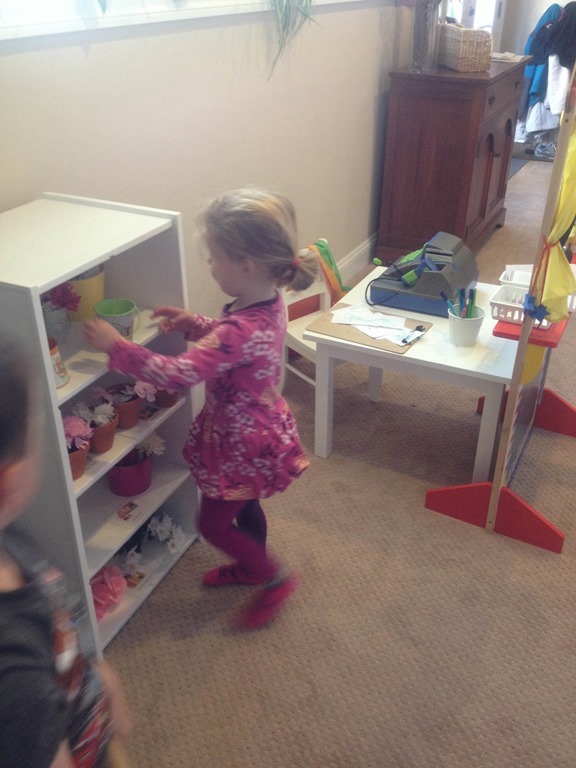 Not long after C and MR were intrigued by their set up and came to play. They joined right in, and I loved seeing their work. We actually left it out to be played with again this week. 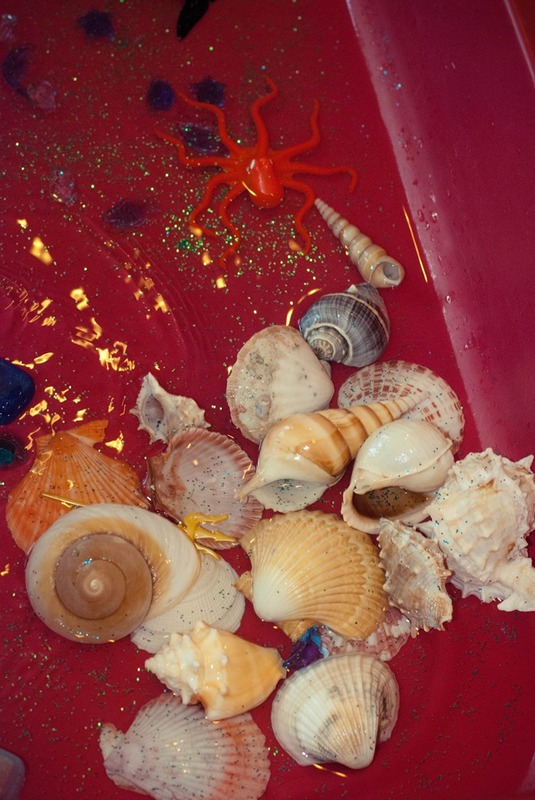 Last week we did one ocean themed art project, but for the most part I provided open ended art activities in the classroom. One of the MOST popular ones was this bottle cap canvas. 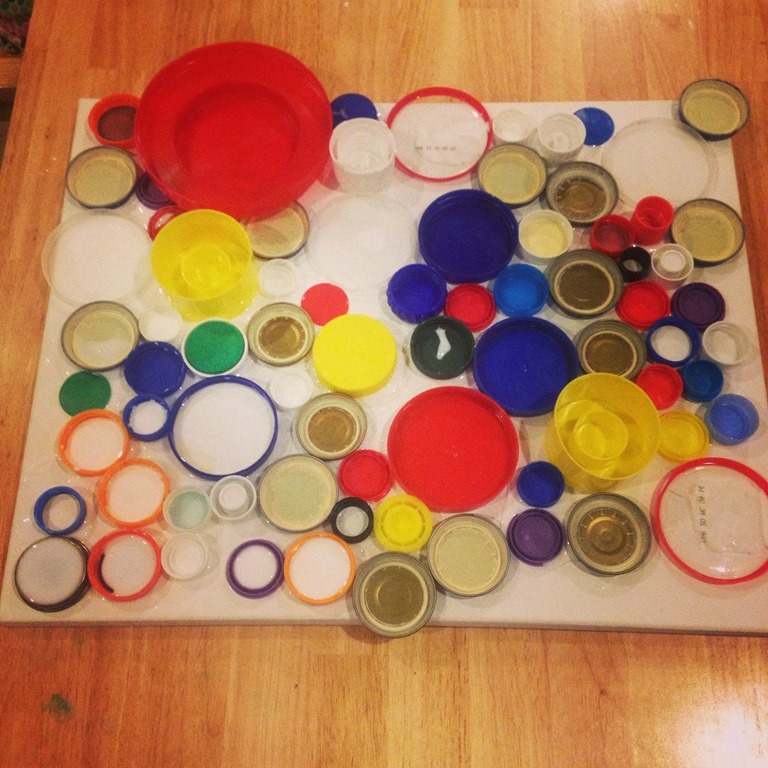 I had three large bowls of bottle caps, a blank canvas, and two glue bottles. They really enjoyed squeezing the glue and flipping over the caps to find a perfect space on the canvas. They used up all of my bottle cap stash, so if you have bottle caps send them in! 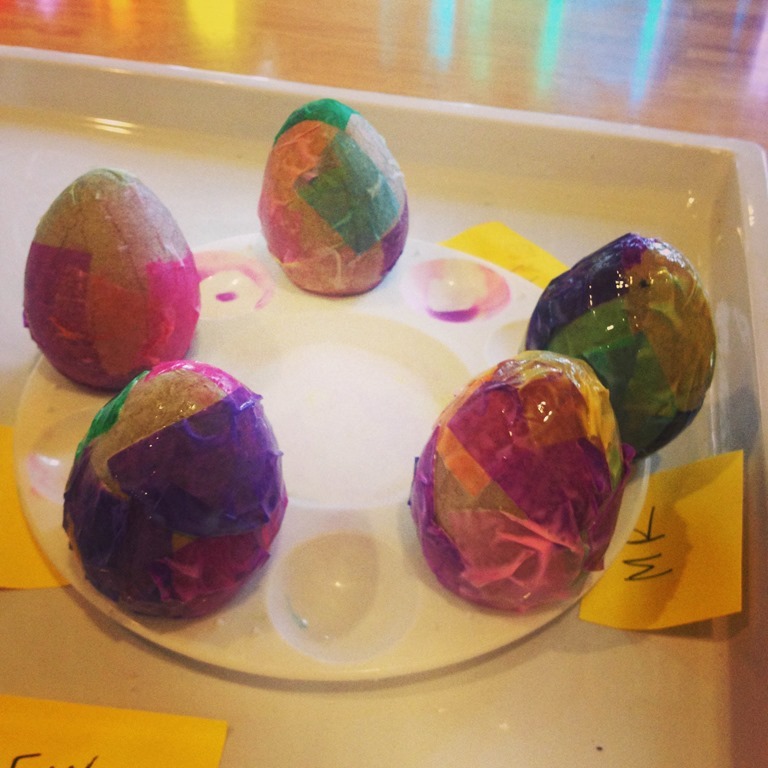 I know the children would enjoy doing this activity again! 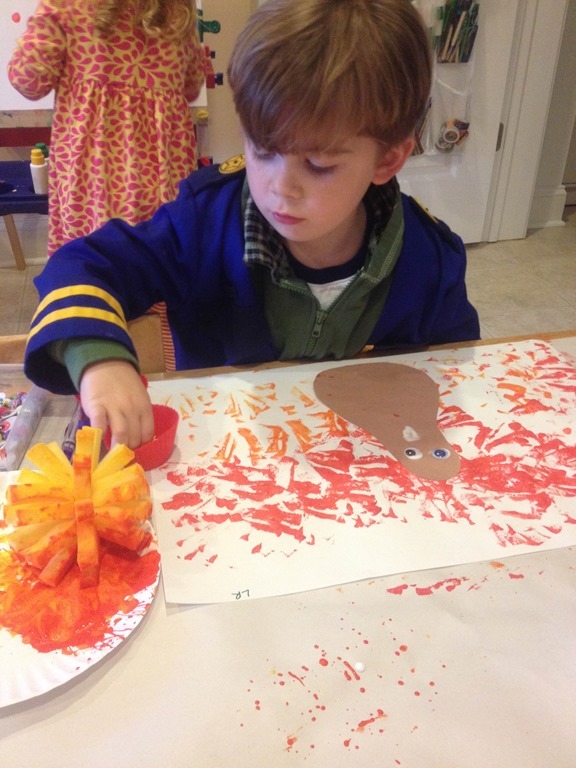 The art room was back in a big way last week too! 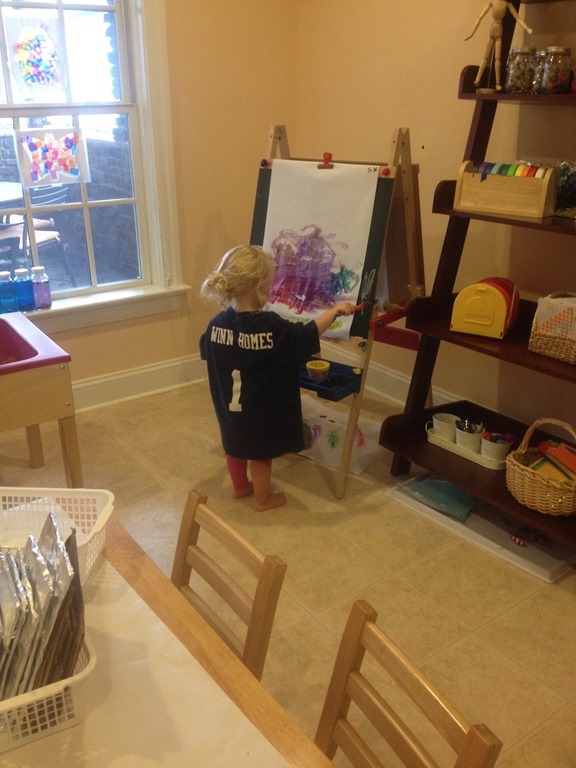 Both easels were opened again, and the painting, painting, and more painting has begun! 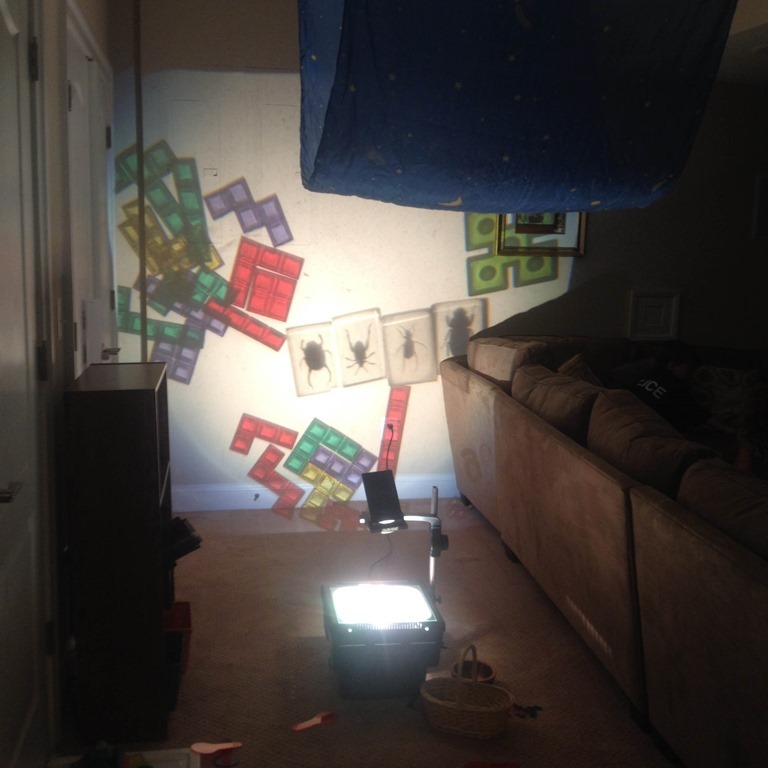 For a new art process that we didn’t explore last year I covered cardboard boxes with aluminum foil. Then I purchases Sharpie paint pens. 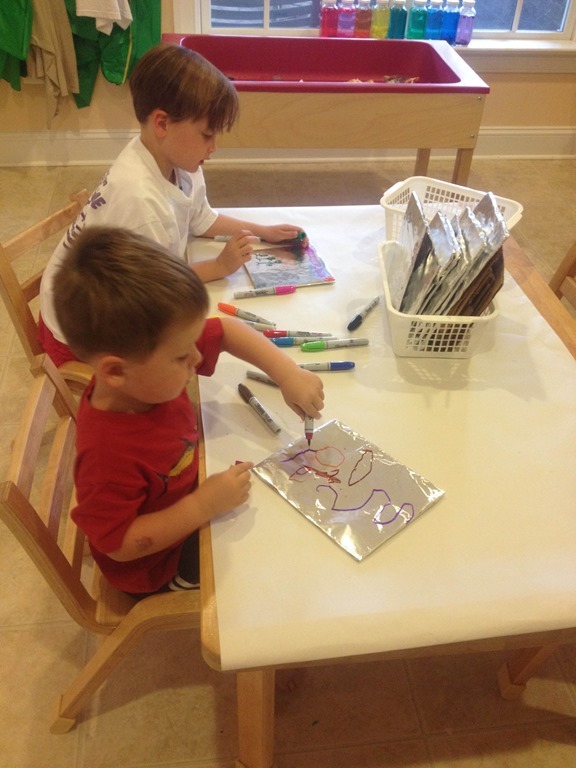 They offer a really neat drawing experience because of the texture and sheen, as well as the crunchy noises when you draw on the foil. 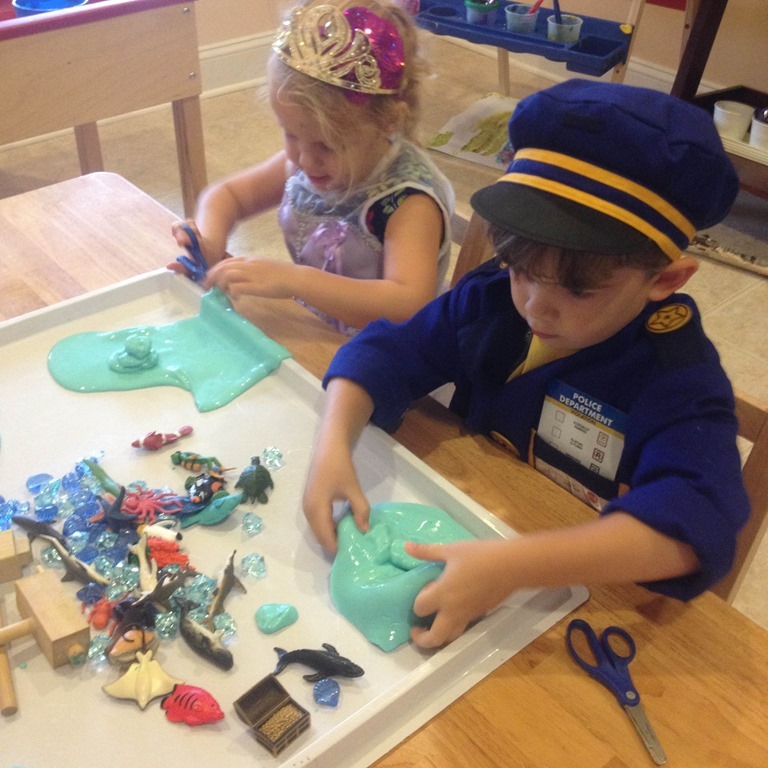 One child discovered the joy of cutting gak and it spread around the classroom. 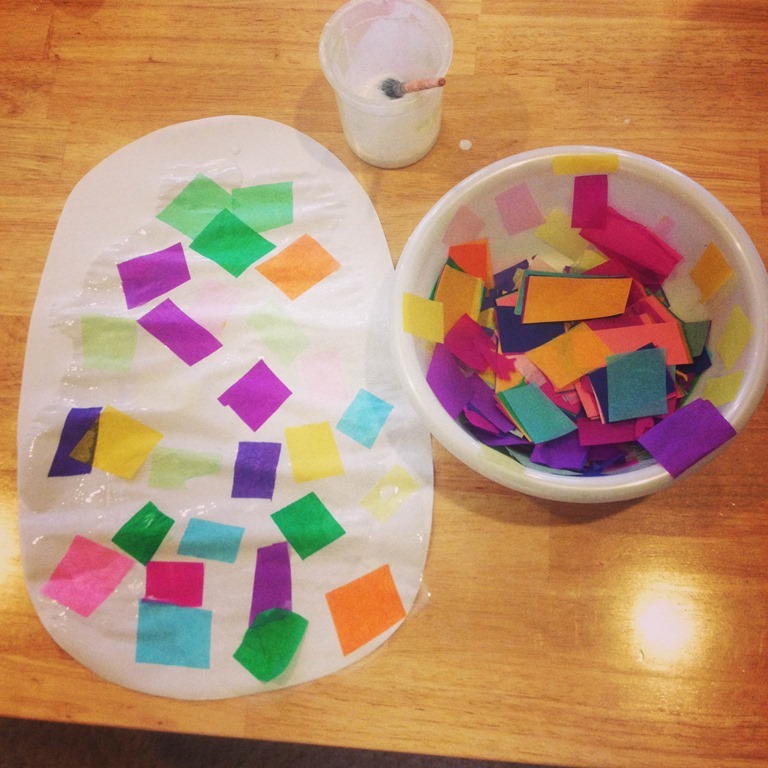 Everyone stopped by the gak table last week to try their hand at cutting gak. 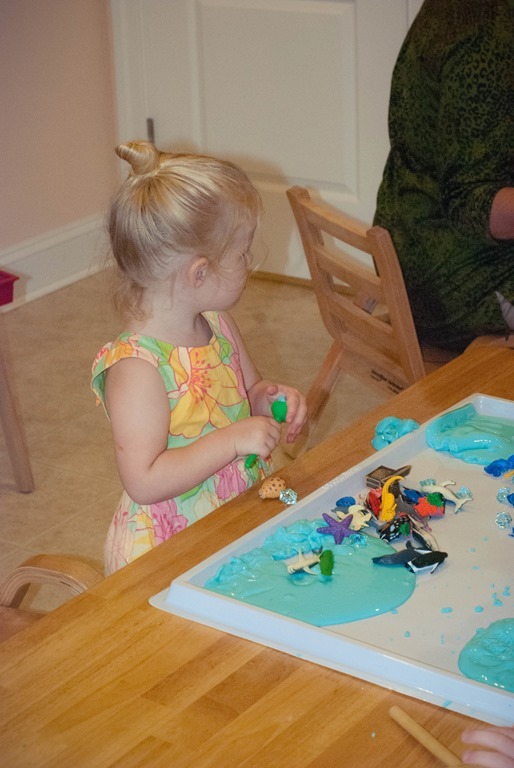 LP also figured out how to shred gak using the hammers to shred the gak up. 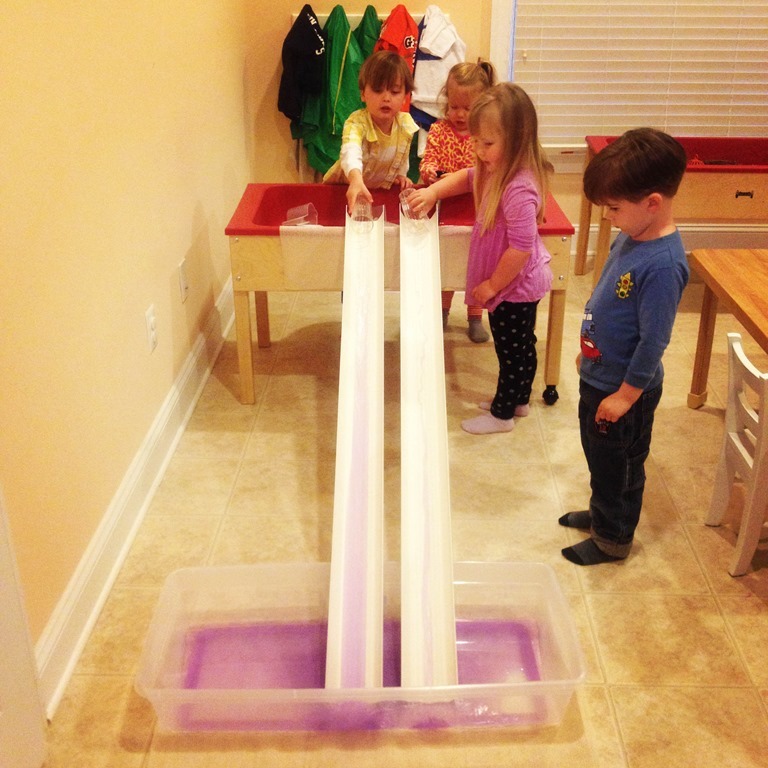 We really spent a lot of time exploring our ocean gak! 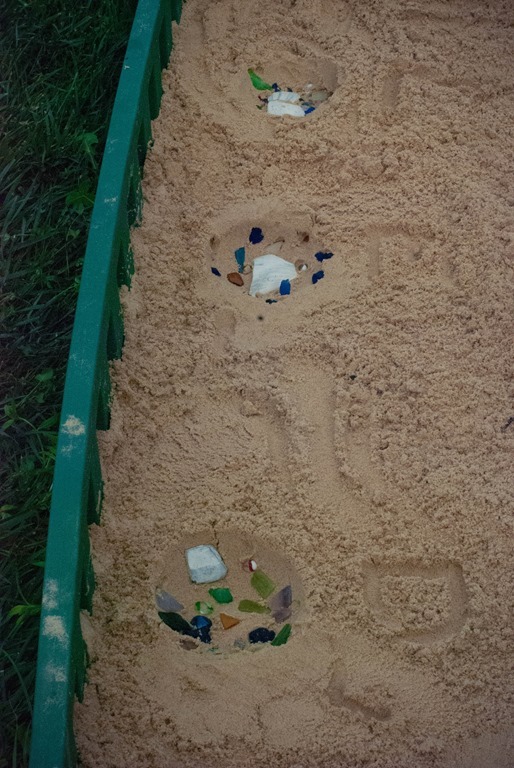 Last but not least, here are the pictures of our sand casting in the sand box. What a neat process and the results were stunning. I can’t wait to do this again! 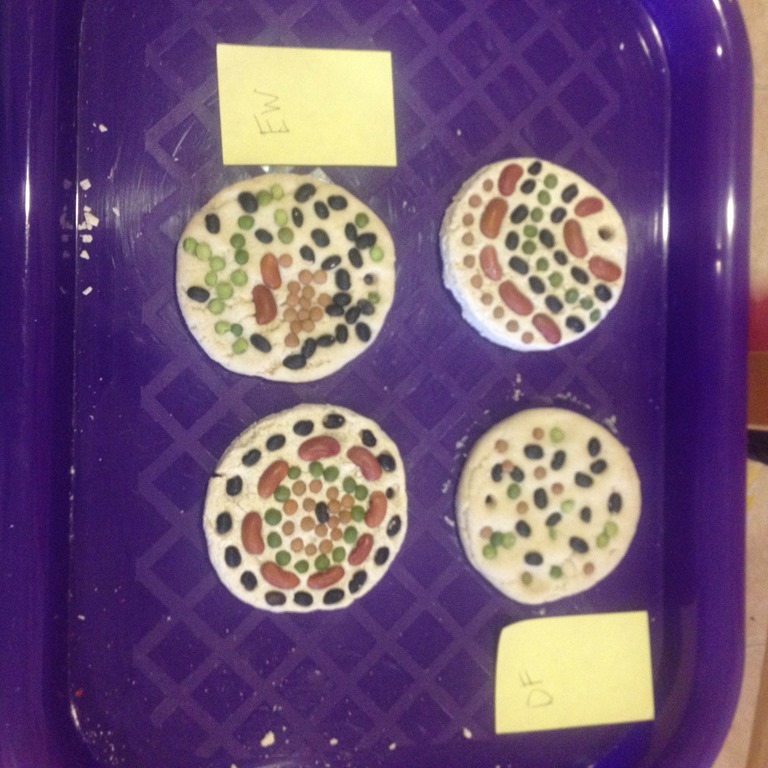 After the children added their stones to their hole in the sand, Ms. Lori and poured plaster of paris into the holes and allowed them to dry. 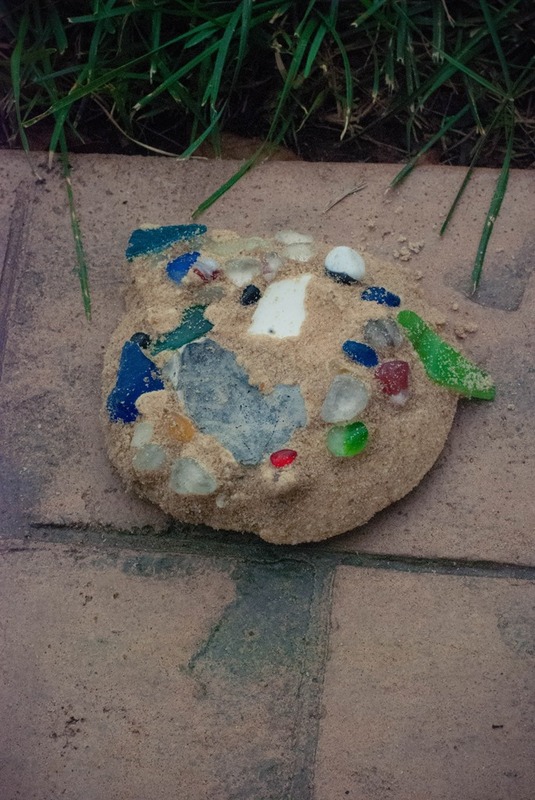 Then we lifted the plaster out of the sand to reveal their art. 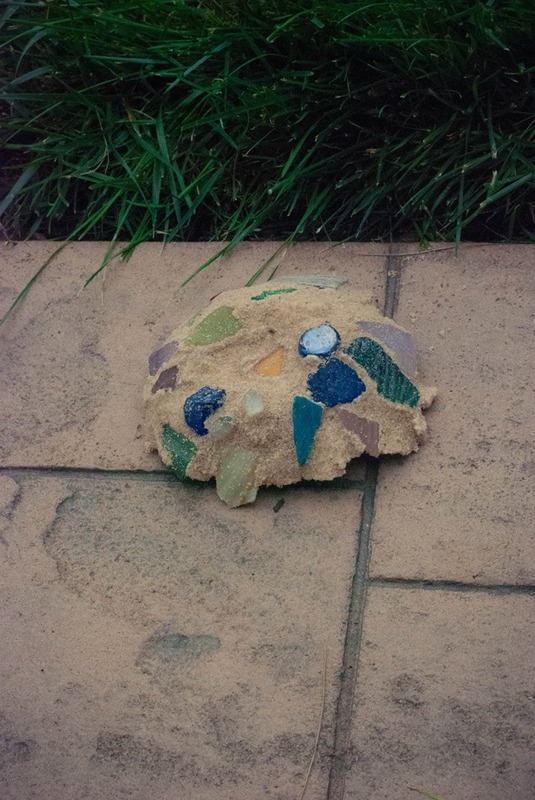 I love how different and unique each sandcast turned out! I know that was quite a post, but we have been so busy the past few weeks! Soon we will be sharing all of our weather activities! 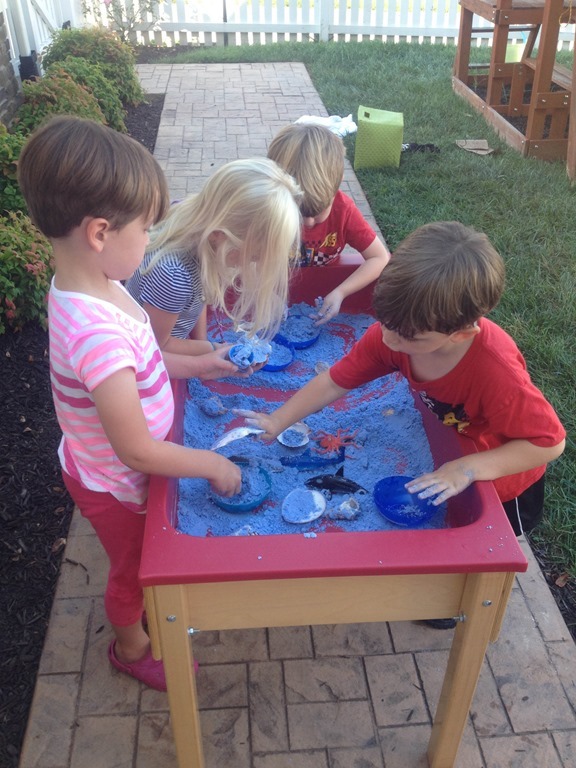 Categories: home based learning, home preschool, play based learning, process art, sensory play | Tags: learning trays, learnning through play, ocean themes, preschool art, preschool crafts, preschool math, preschool science, sensory bins, sensory play | Permalink. 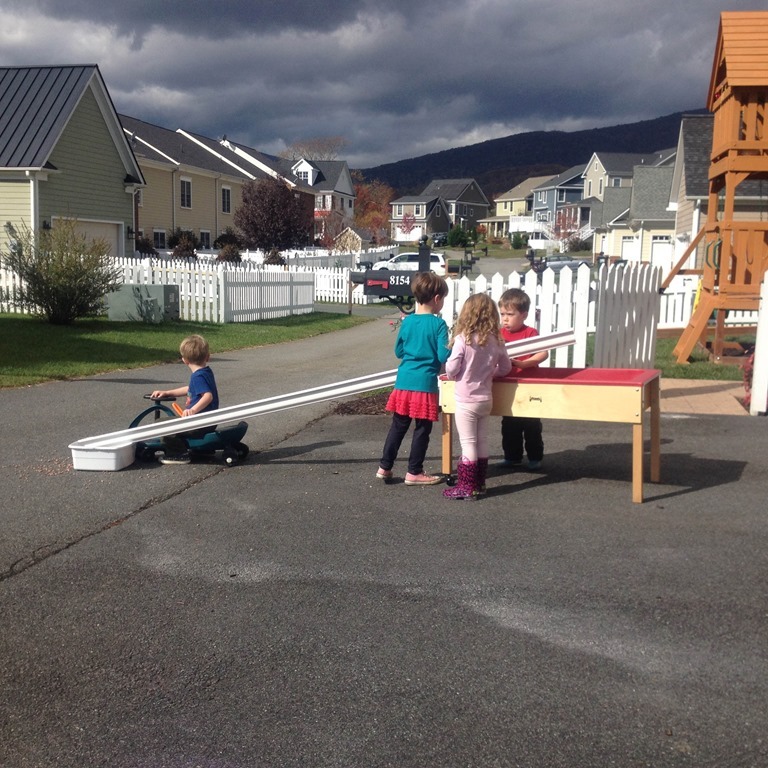 Over the cold winter months the class and I would take walks around the neighborhood to get some fresh air. 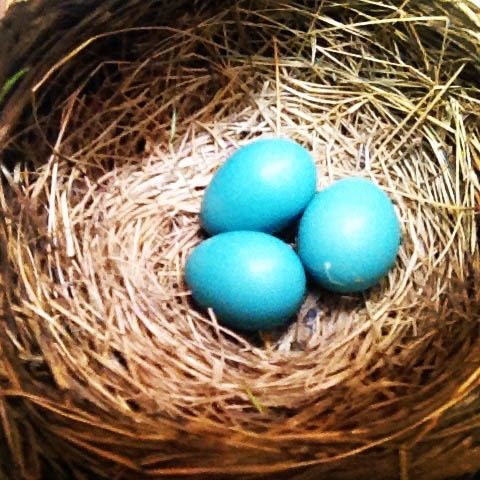 While we were on our walks the students started noticing the bird nests in the empty trees around the neighborhood. These nests brought a lot of discussions about birds, where they went during winter, and what happened in those nests we noticed in the trees. After a few days we headed back out with some sticks and plastic bags and we took down some of the old nests for inspection. 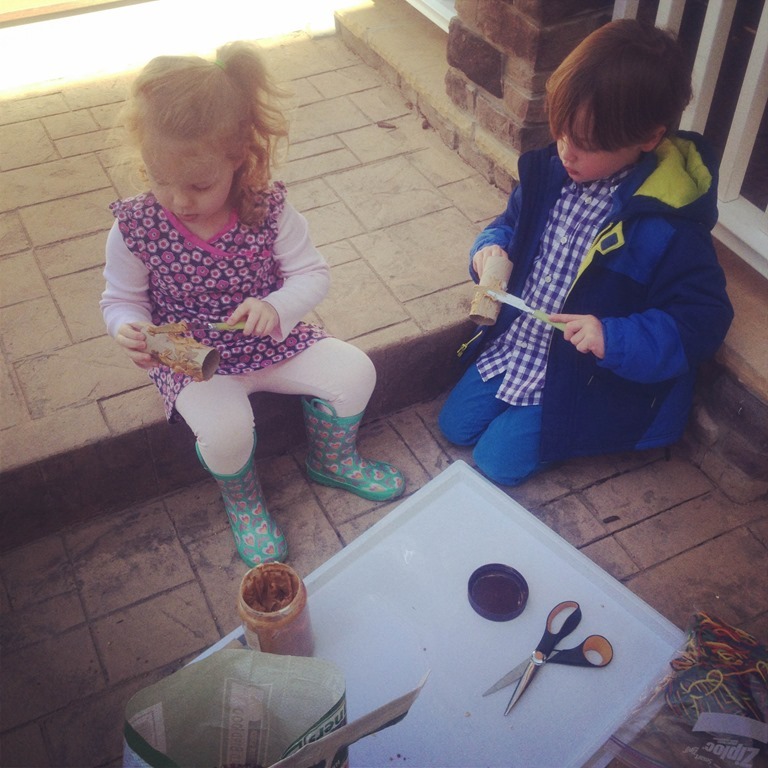 They were fascinated by how the nests were built and the materials the birds used for building. 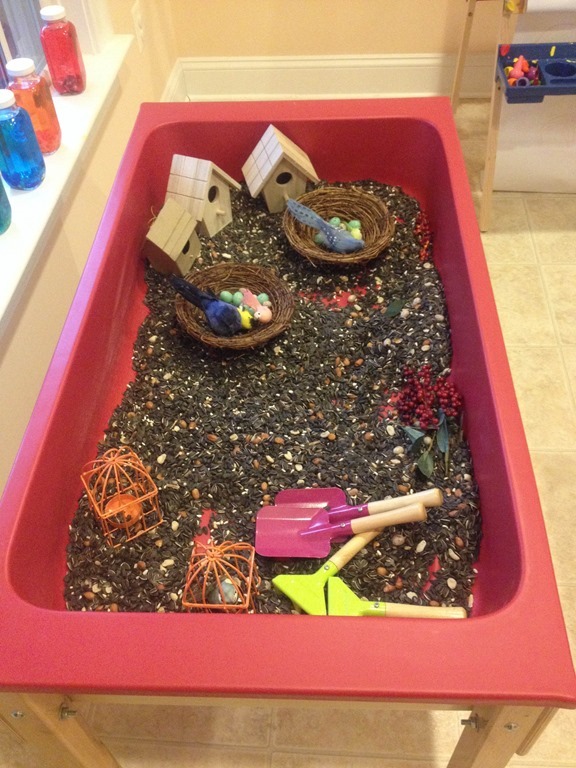 After all of this excitement about birds I set up a bird sensory bin for the students. 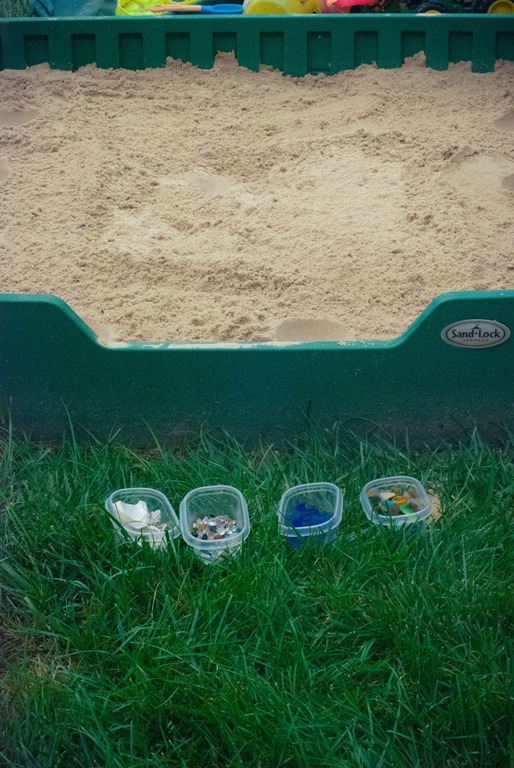 I filled it with bird seed, nests, felt birds, and little wooden bird houses. 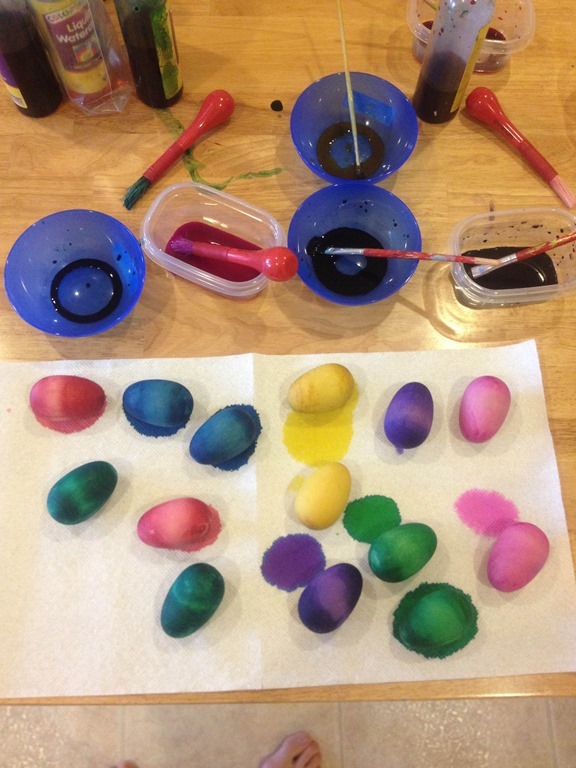 I also found some fake bird eggs at the craft store. 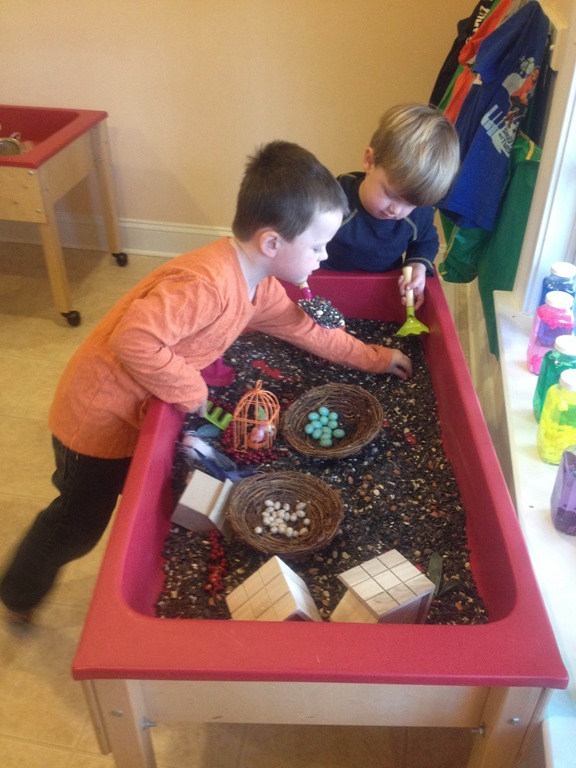 The sensory tub provided a new level of interest around birds, their life cycle, and their habitat. 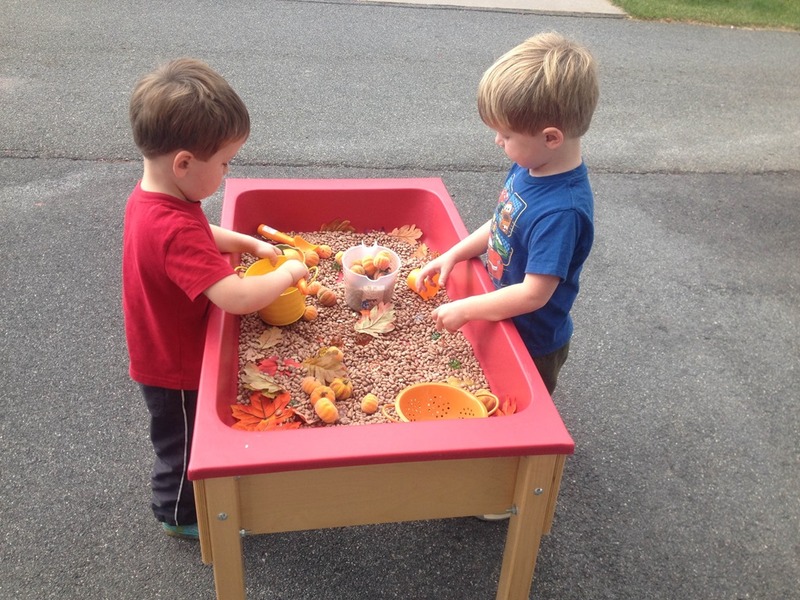 I noticed that many of the children were taking the birds out of the sensory bin and lining them up along the edges and making up stories about the birds. 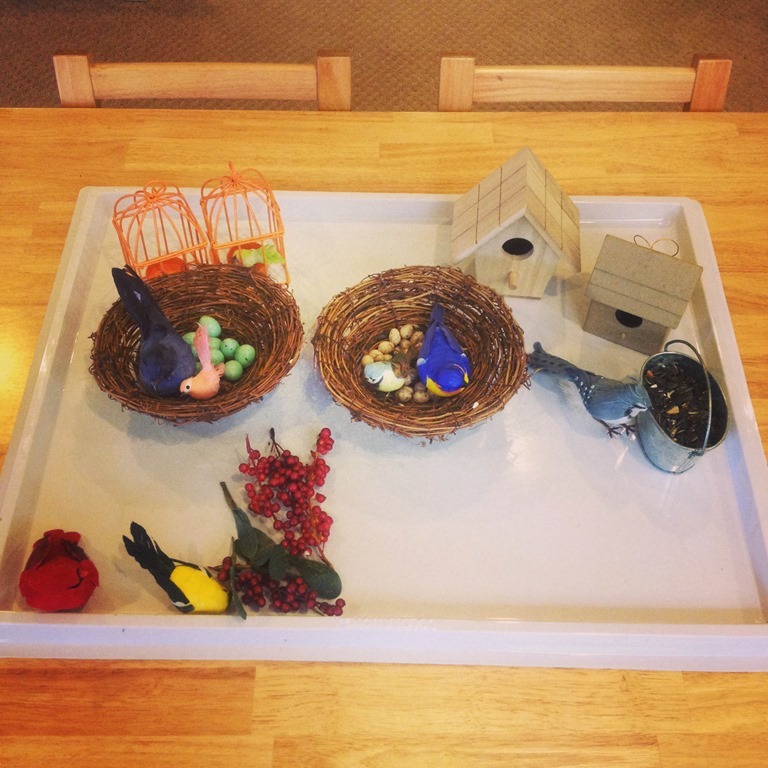 After two weeks I removed the birds from the sensory bin and put them out on the table for further pretend play. Through books we studied the life cycle of the bird. I offered another table invitation for baby chicks. 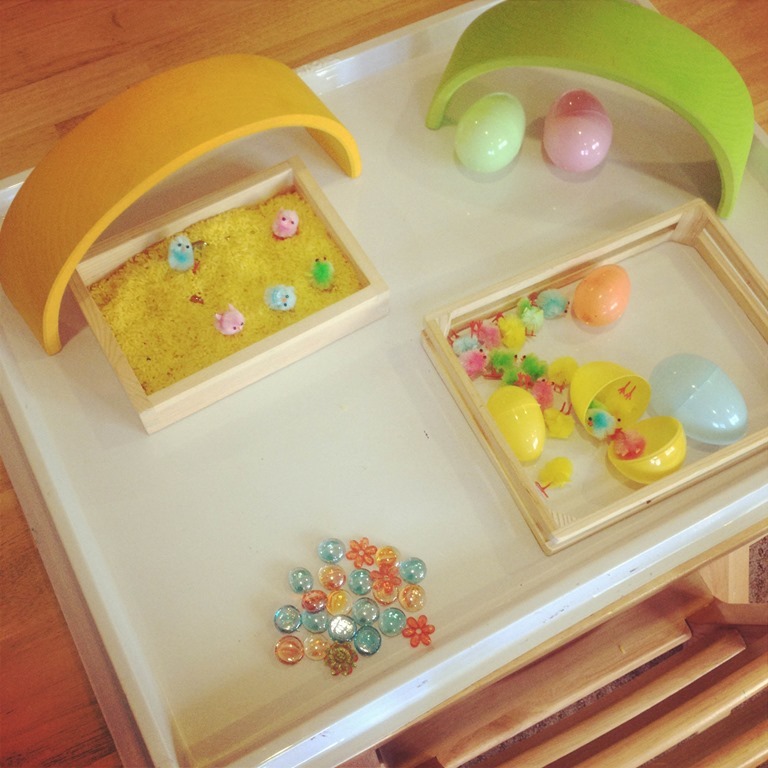 I provided rice, little chicks, gems, and plastic eggs for exploring. 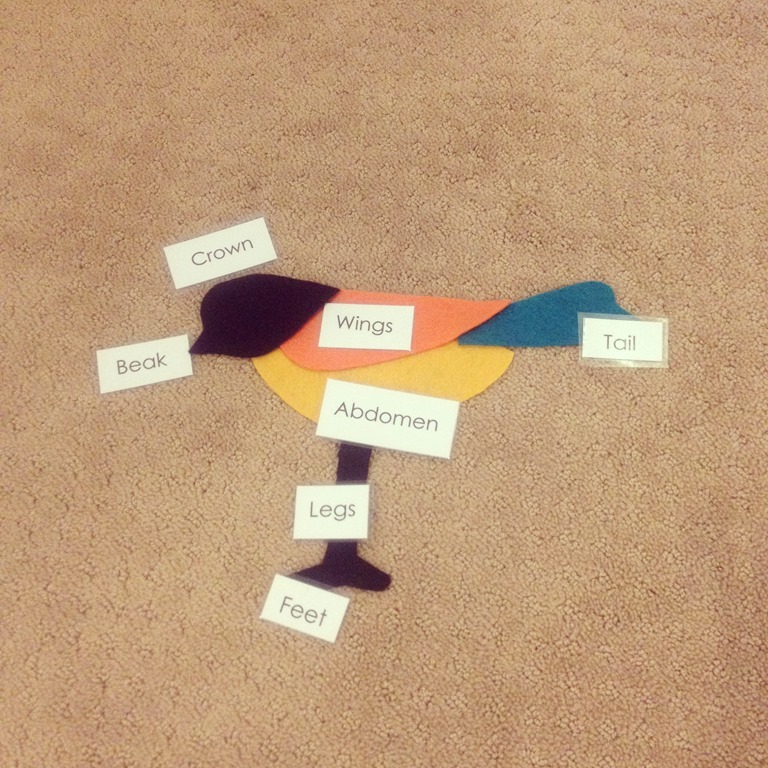 I created a bird puzzle from felt and then made labels for the bird puzzle. We worked on this puzzle as a whole group, and then I offered the puzzle as a table invitation for them to work on independently. 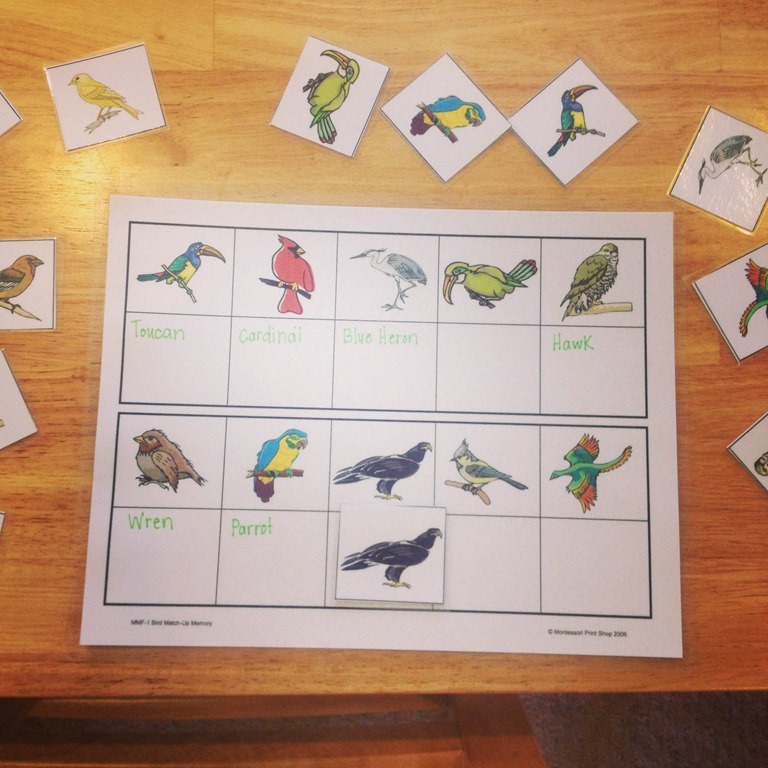 I also created this bird matching game. It was out on the tables for a few days, and then I put it in one of the learning trays for students to match up the types of birds. 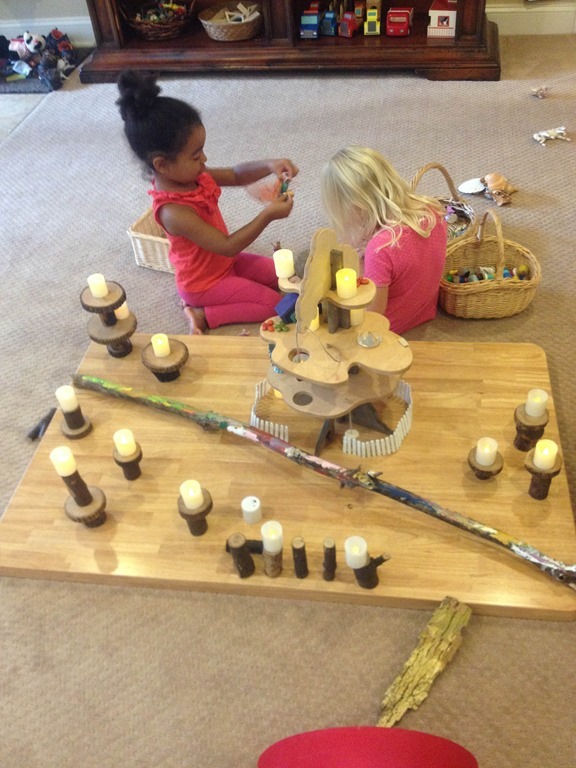 The children were pretending to be birds during choice time, so I created this large bird nest. 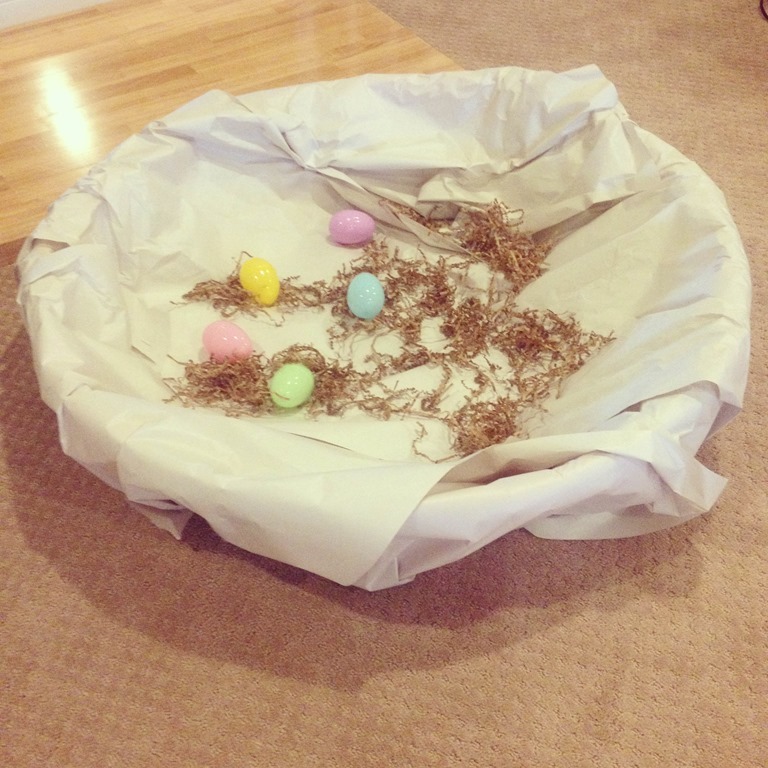 I used a kiddie pool, covered it with brown paper and filled it with shredded paper and large plastic eggs. I put this large nest up in the loft, just like a bird makes her nest up high and out of sight. 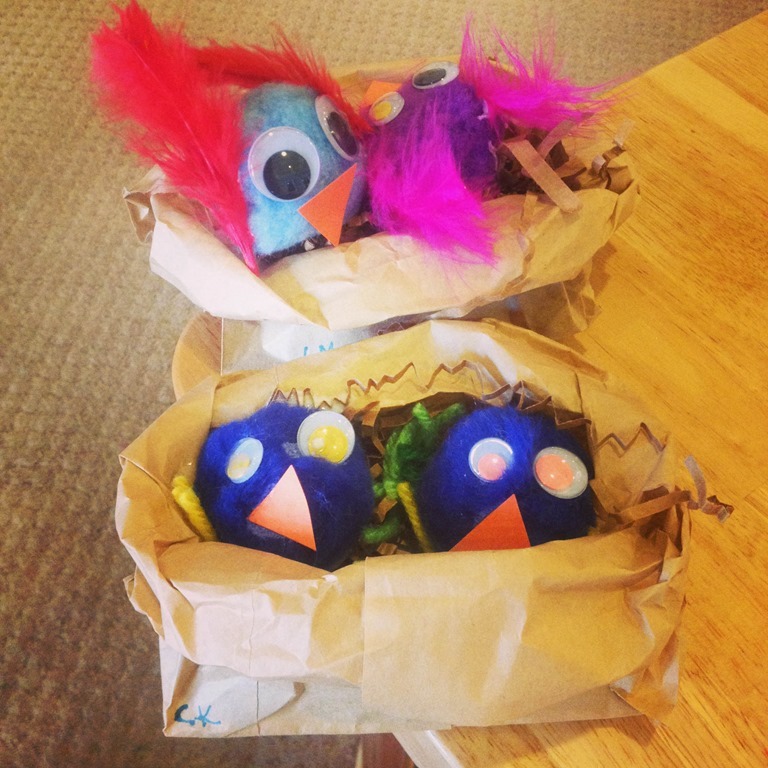 We created little paper bag birdies in their nests using brown paper bags and pom poms. 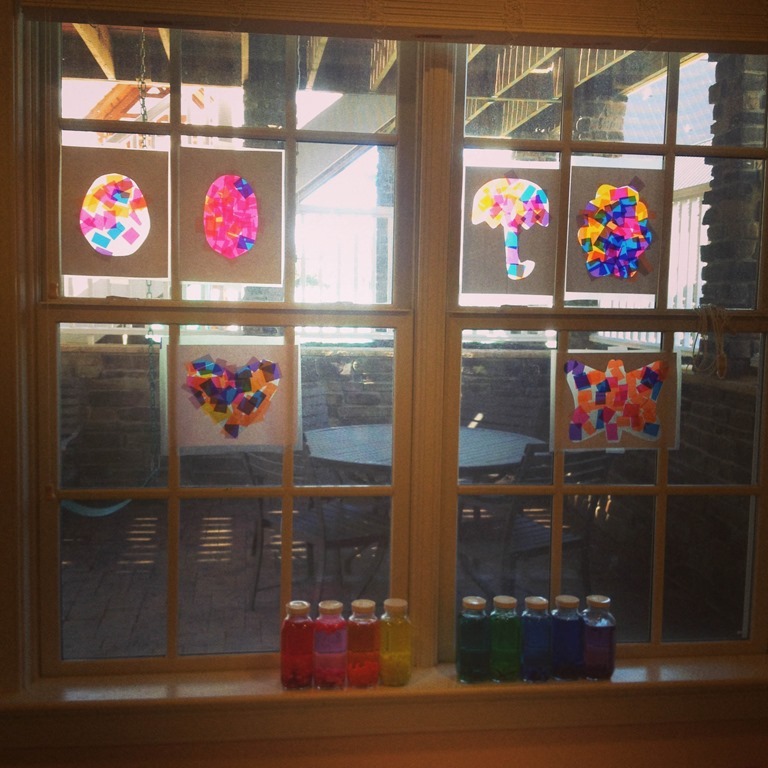 The children also made bird window art using tissue paper and contact paper. 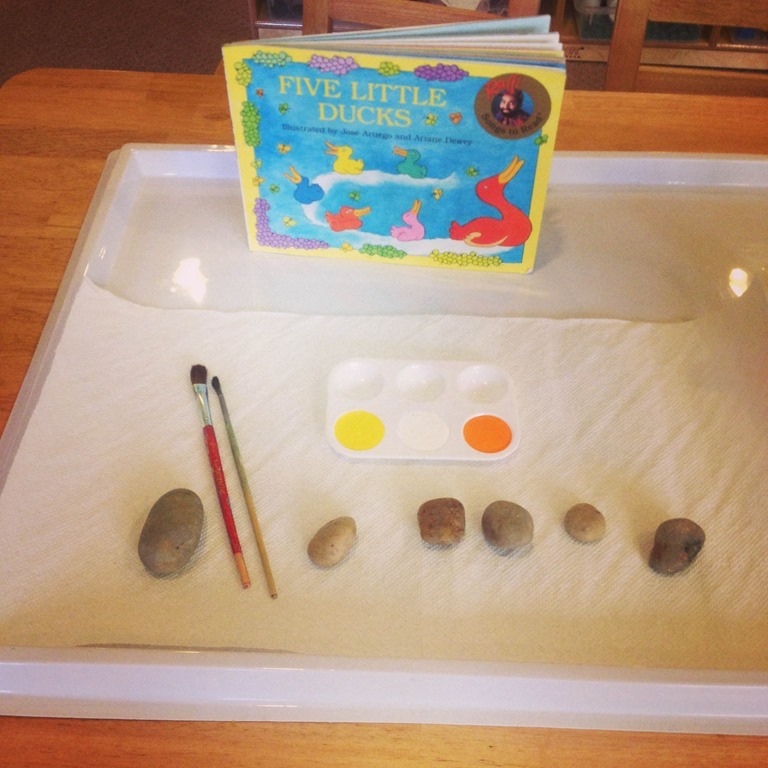 During this bird study we re-read “Five Little Ducks” a number of times. 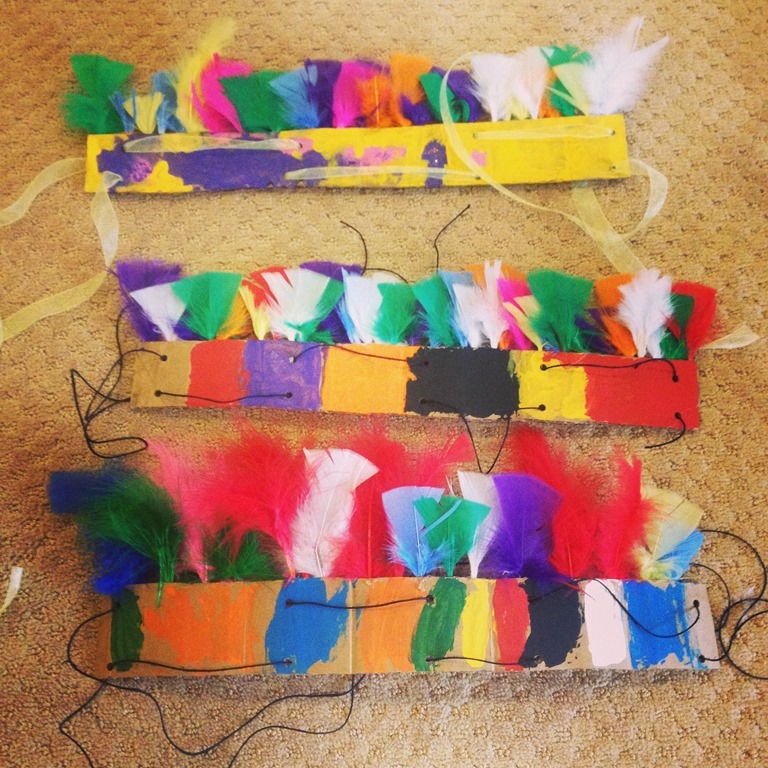 I also have the felt board pieces to match this story, and the children have heard it before. 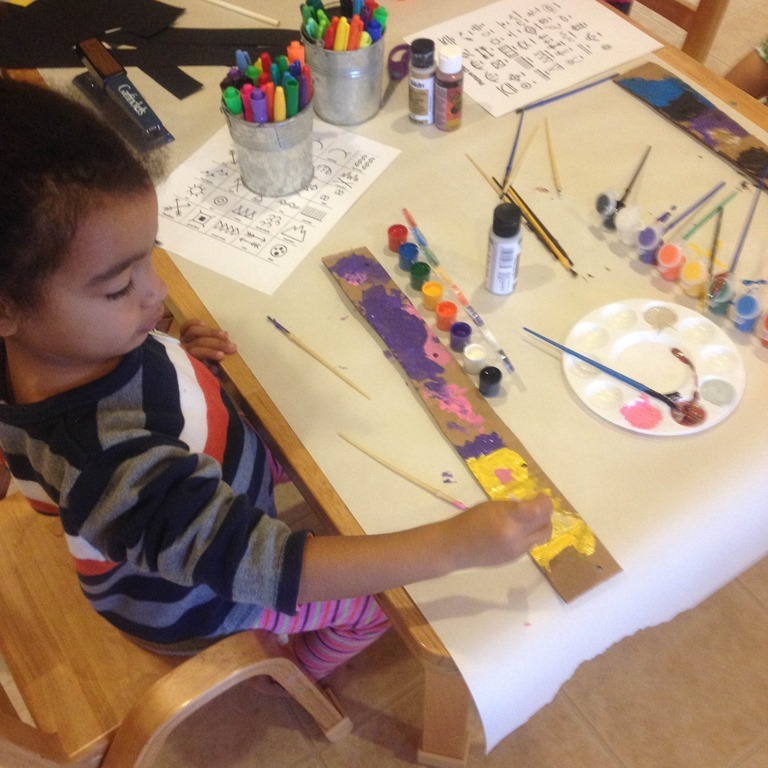 To give them a chance to practice the story at home I offered this painting invitation. 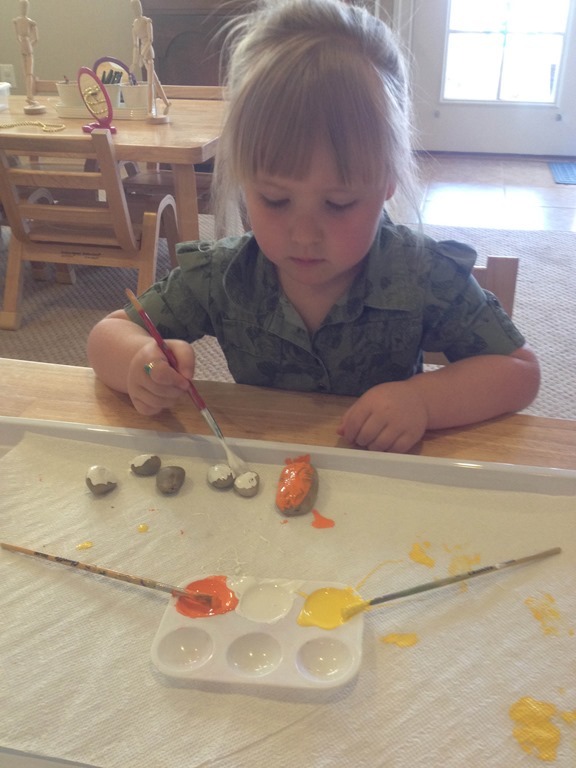 They painted their rocks different colors for the mommy and the five baby ducks. Then I added little eyes and a beak. 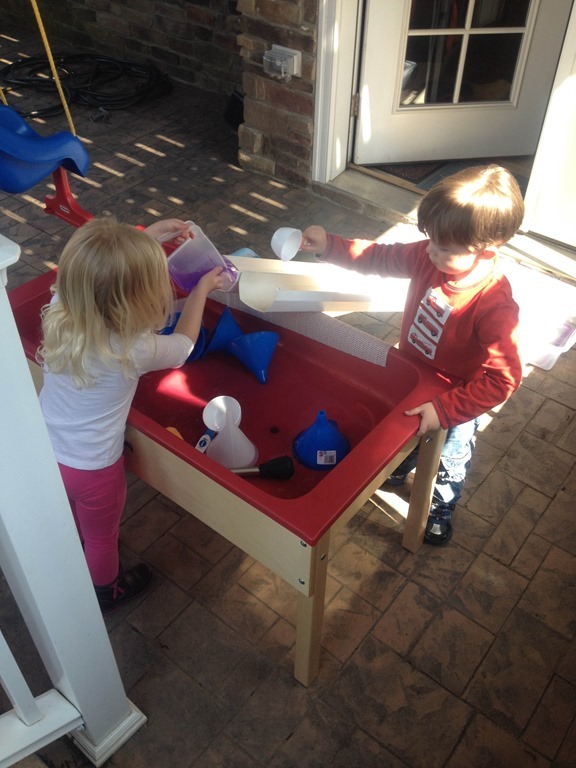 Each child got to take home their ducks to sing and practice the story at home. 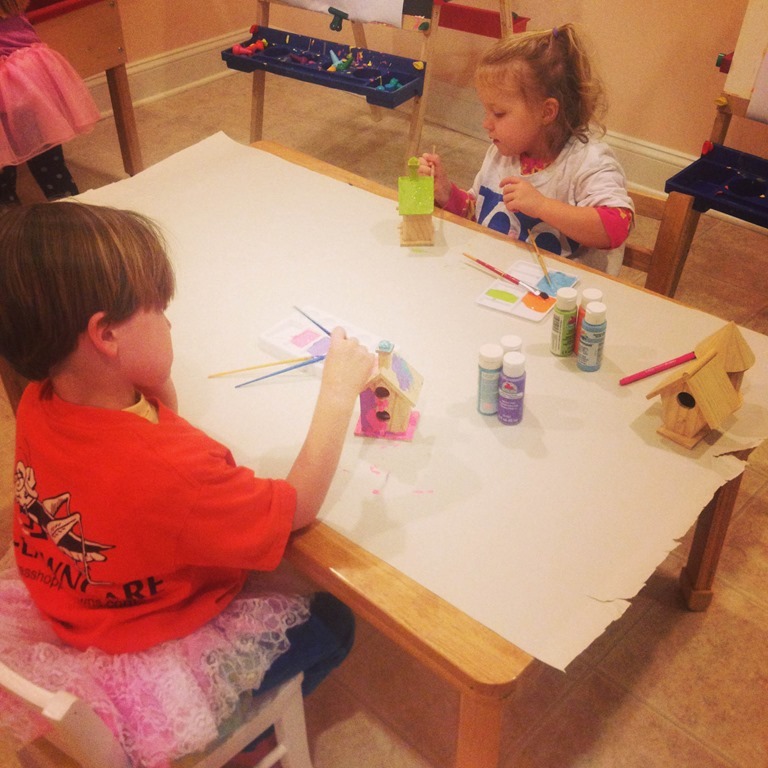 We also painted wooden bird houses with acrylic paints to take home too! 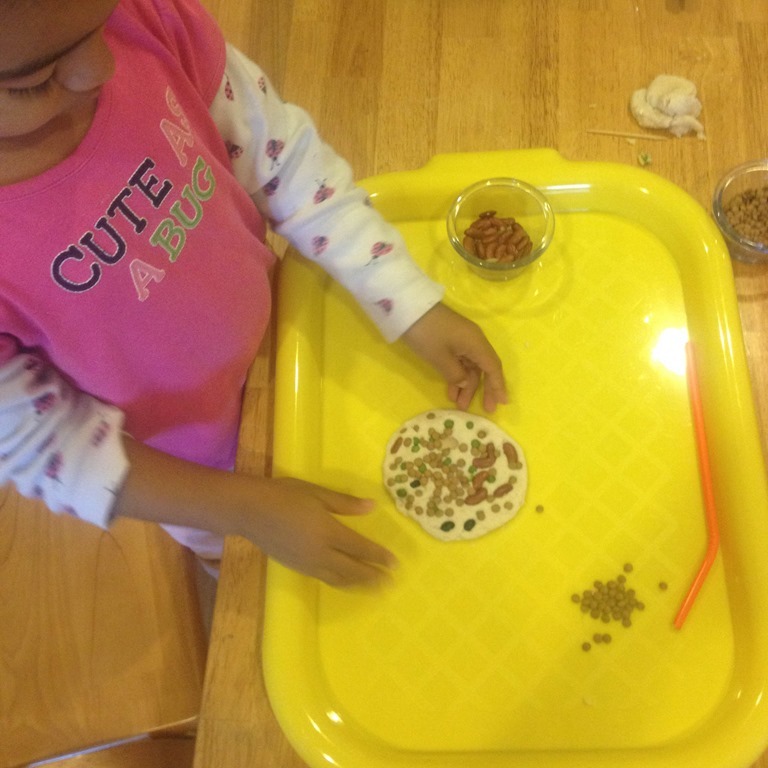 We created homemade bird feeders! 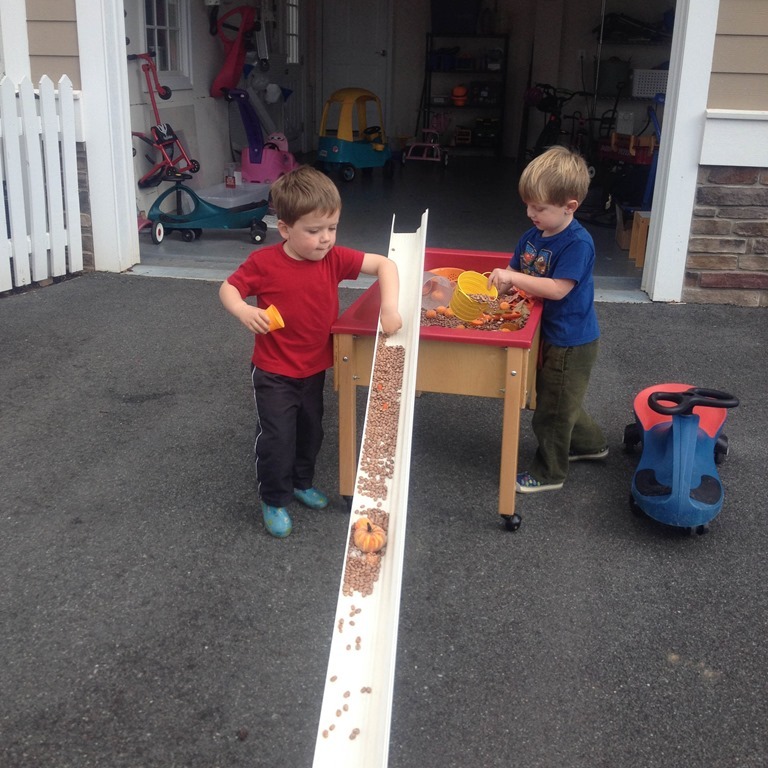 These are the easy, old fashioned feeders: toilet paper rolls, peanut butter, birdseed, and yarn. 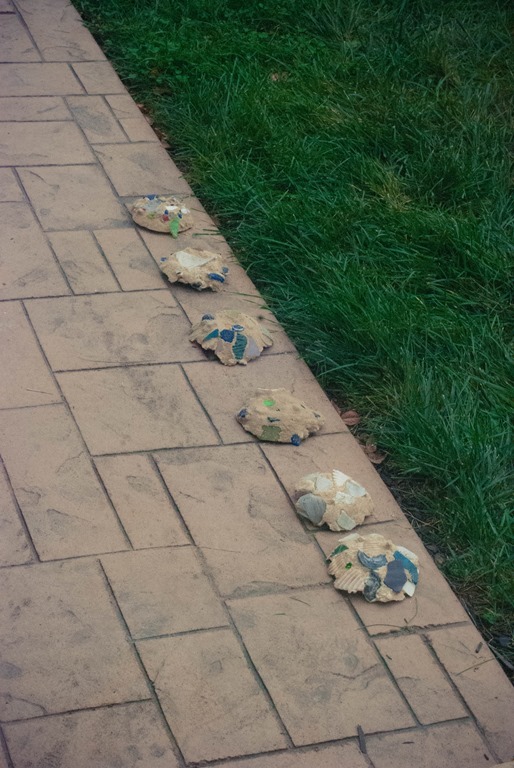 We hung some of them on the trees by school and some children also took their bird feeders home. It was almost as if the birds knew we were interested in them, because a robin made her nest right under the deck on top of the columns of the preschool. 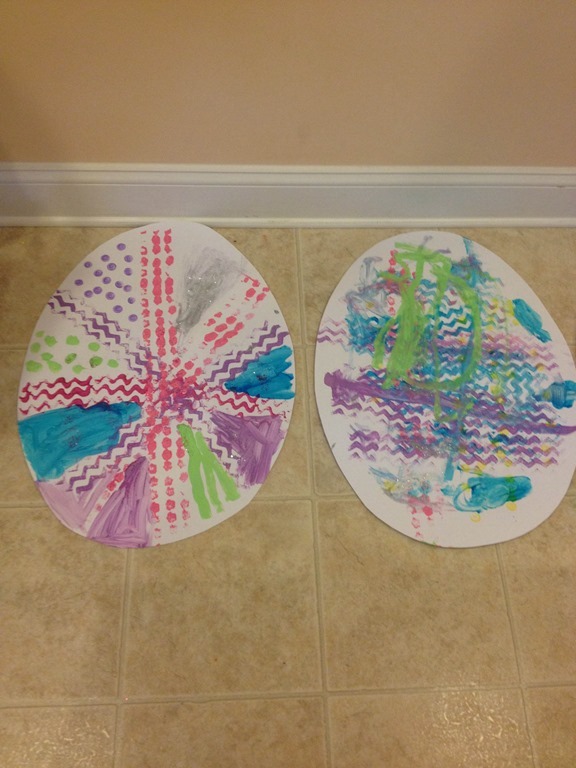 I was brave enough to take some pictures of her eggs for the kids. After the eggs hatched the children figured out if they stood on the chairs on the preschool patio they could see the chicks waiting for their mom to return with food. 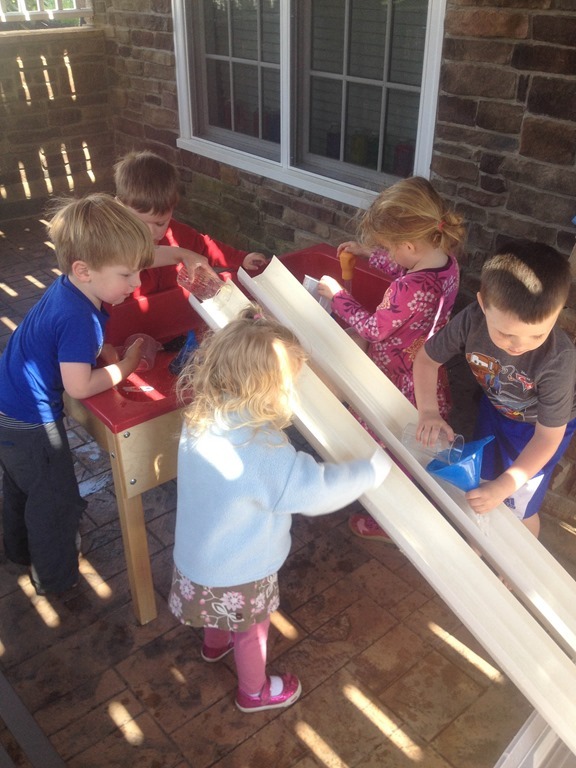 Just this week my T/TH group got to see the baby robins on the swing set, having just left their nest. They flew off and it was a hot topic for the group! At the end of our discussion on birds the children put the life cycle of the bird in the correct order in their learning journals. Then they drew lines to connect each part of the life cycle. 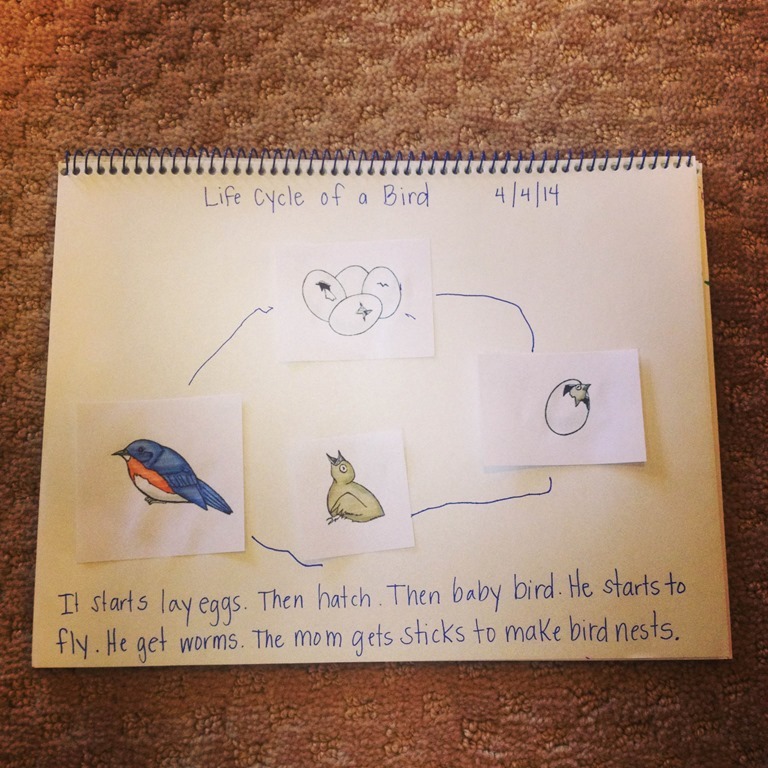 I dictated their understanding of the bird’s life cycle on the page for each child. 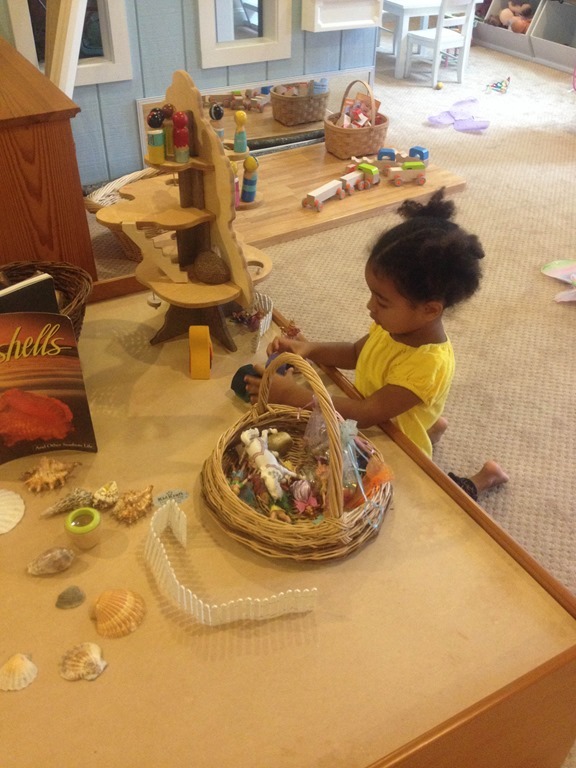 Categories: home based learning, home based preschool, home preschool, play based learning, preschool, reggio emilia inspired, sensory play | Tags: bird crafts, bird unit, birds, learning through nature, learnning through play, life cycle, preschool crafts, preschool science, pretend play, process art, sensory bins, sensory materials | Permalink. This post is full of March madness! 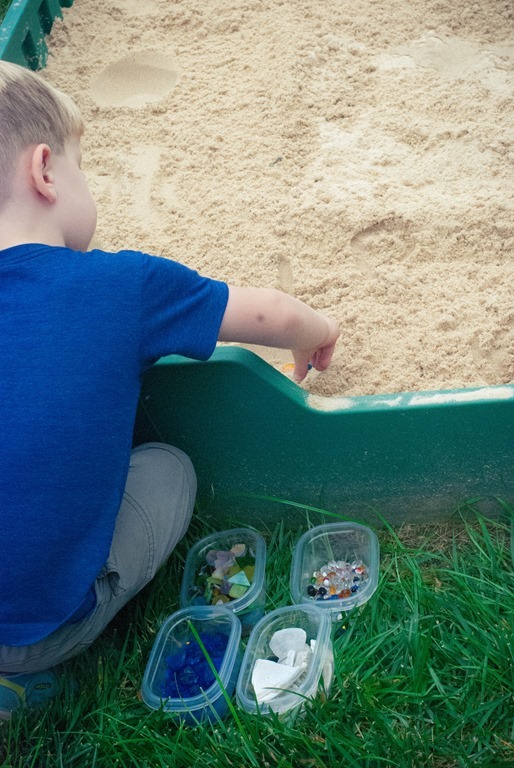 I am little behind on my blogging so you will have to stick with me while I show you all of the great fun we had last month exploring green and rainbows! For play dough this month I made a batch of green dough with gold sparkles. 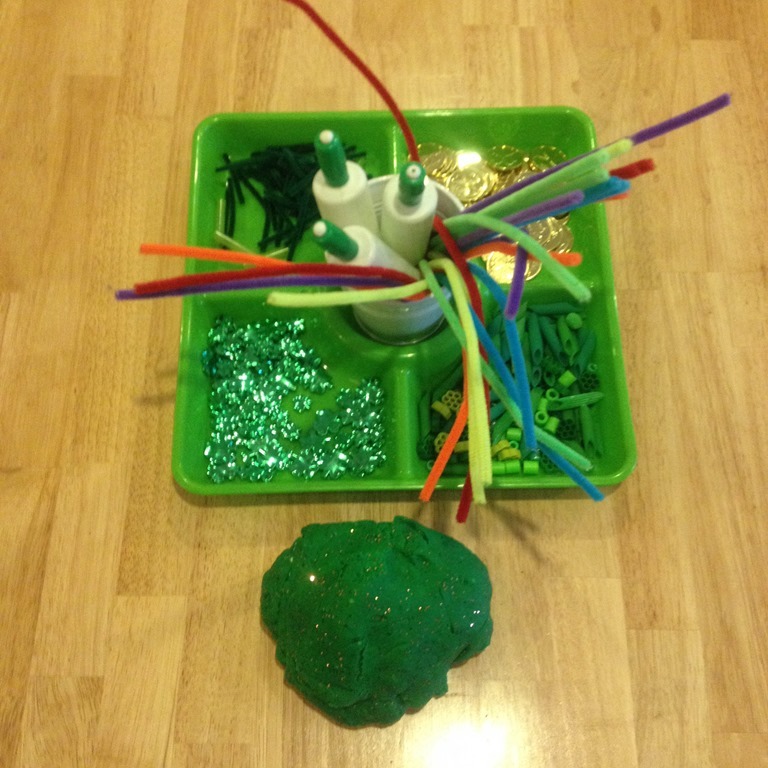 On the play dough tray I included shamrocks, gold coins, green straws and pipe cleaners and a collection of green dyed pasta. 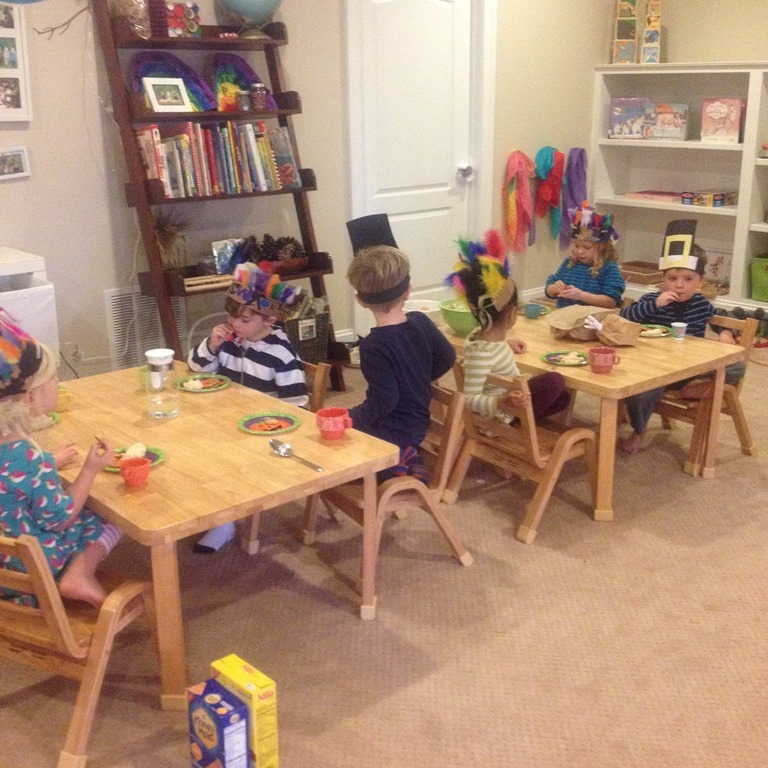 The rainbow pipe cleaners were very popular with the kids. They would form two balls and then create their very own rainbows! 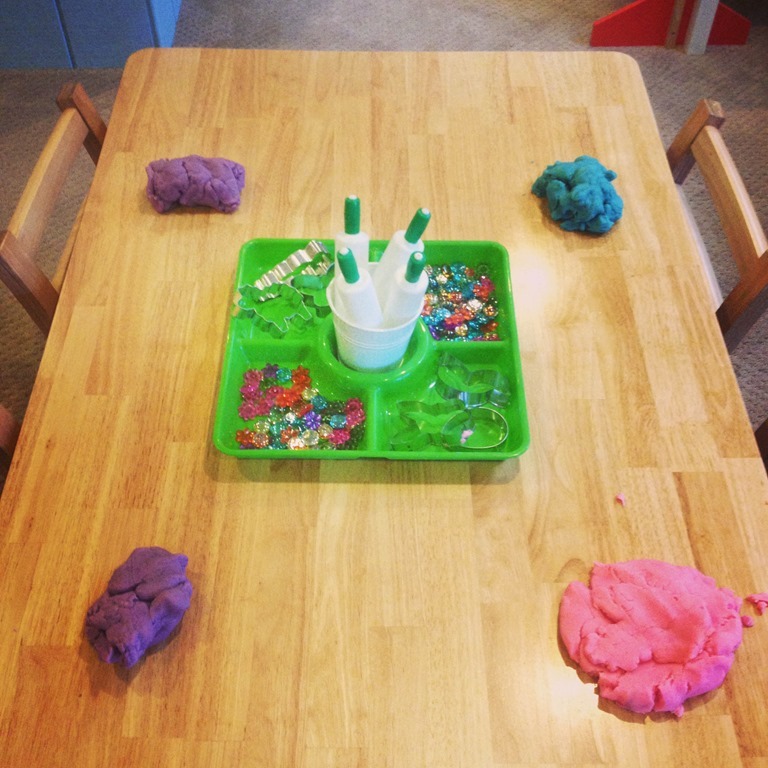 You can see from the pictures all of the variety of ways the children used the loose parts with the play dough. 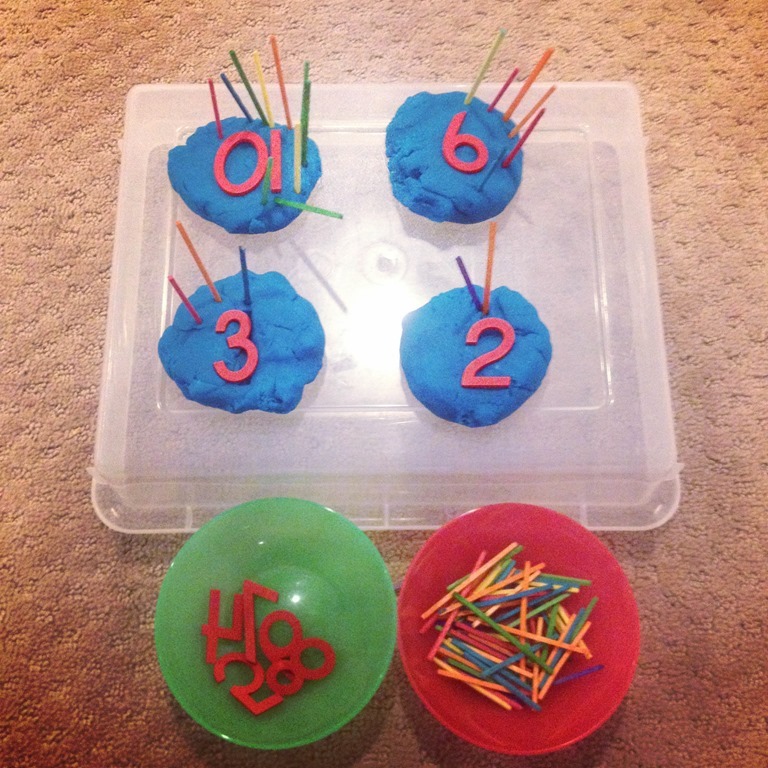 To incorporate counting, numbers, and gold coins I found the idea for a “Lucky Hunt” from the No Time for Flashcards blog. 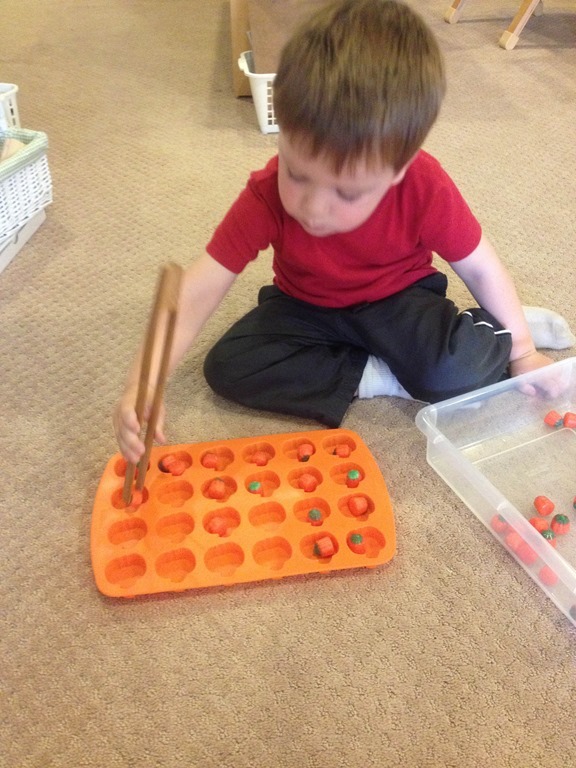 I know I have linked back to her blog before, but she really has some fantastic and simple ideas for playing and learning! 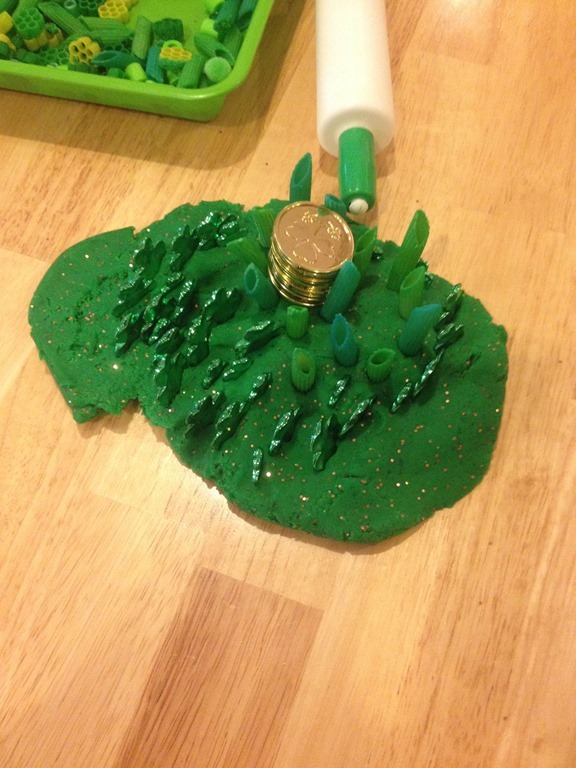 I simply used a piece of green construction paper and put seven circles on the paper to represent seven gold coins. To add on to her idea, on my lucky hunt paper I wrote down the numbers one through seven and sent the children out to hunt for gold coins around the classroom. 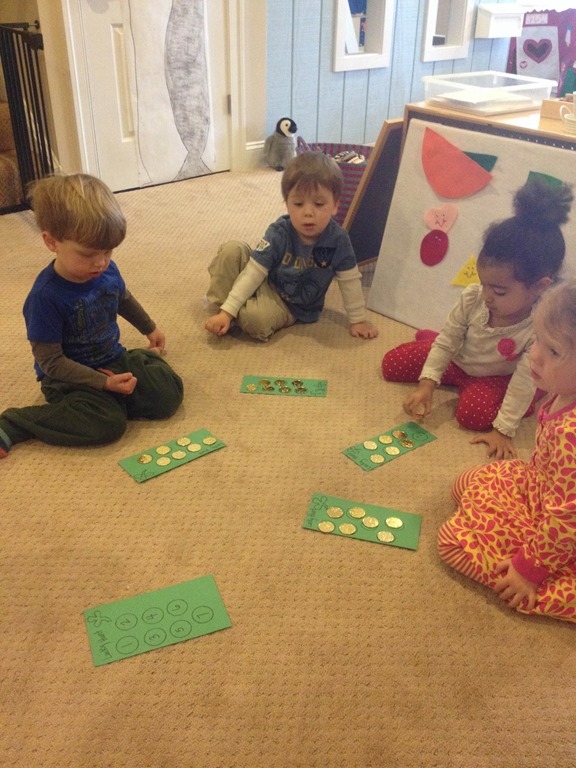 Once they found their coins we pointed and counted the coins slowly together as a group. 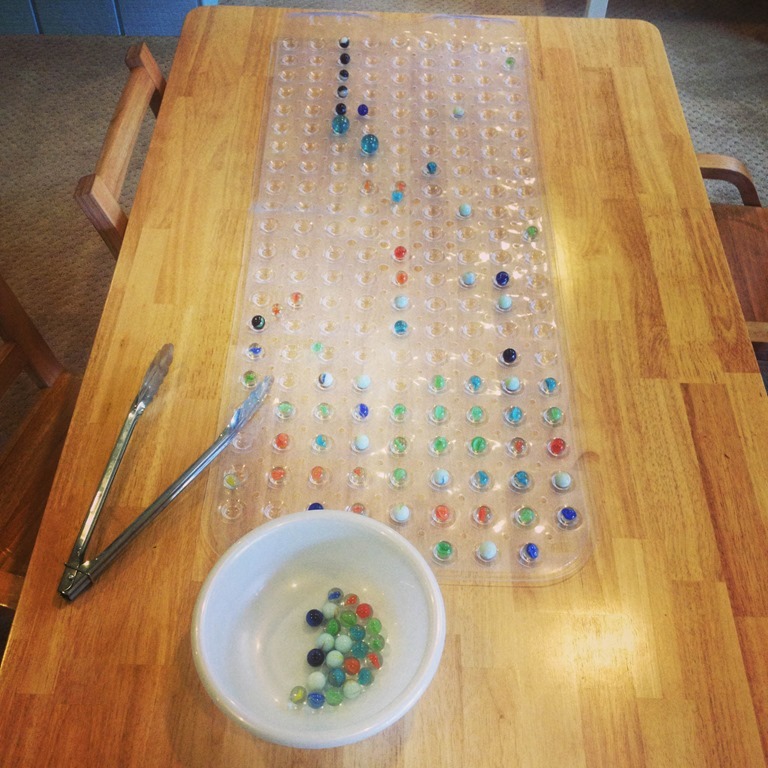 We repeated this game a few times throughout the week! 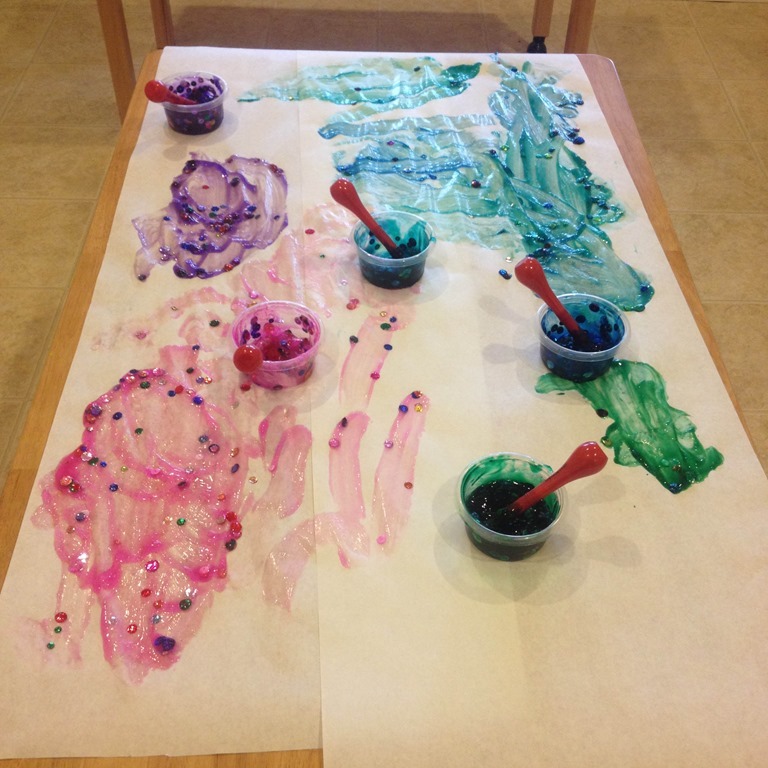 We did some wonderful process art over the month of March! 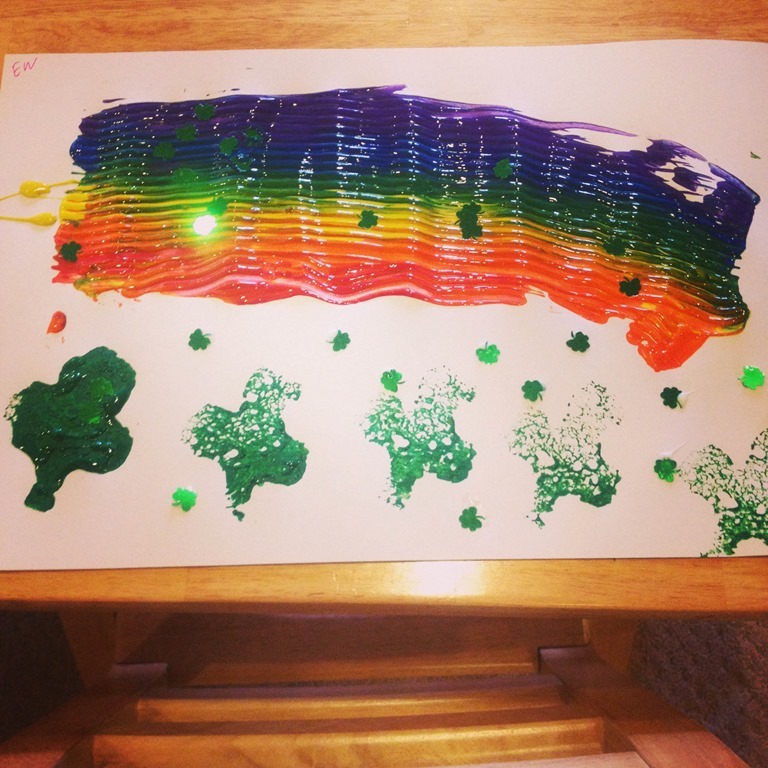 For this rainbow painting, the children helped me squirt the colors of the rainbow on the paper and then they used a large comb scrapper and scrapped the colors across the paper. I also cut out a shamrock from a sponge from the dollar store and they stamped shamrocks along the bottom of their rainbow. 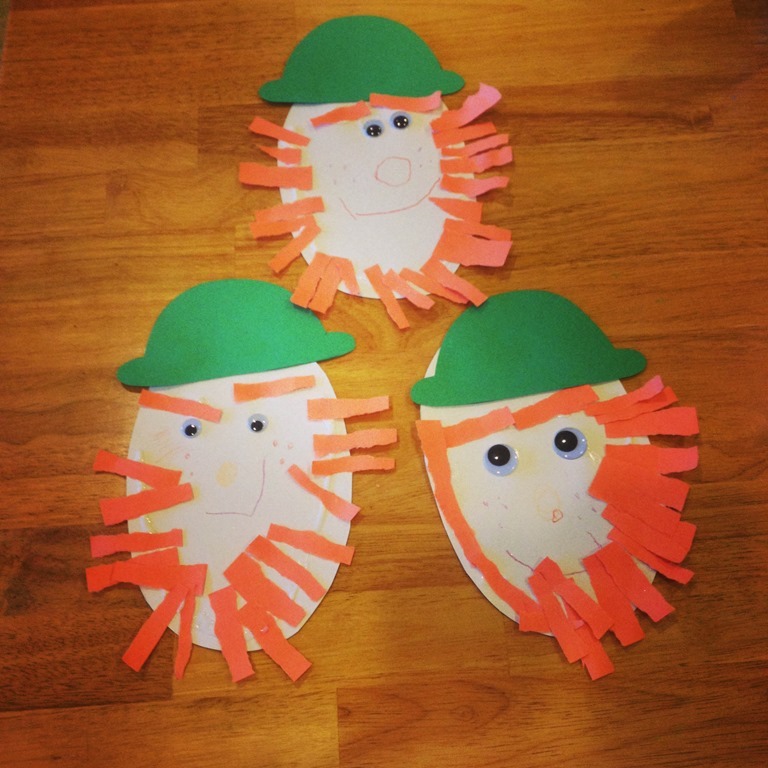 Above is a picture of a few of the Leprechauns the children made too! 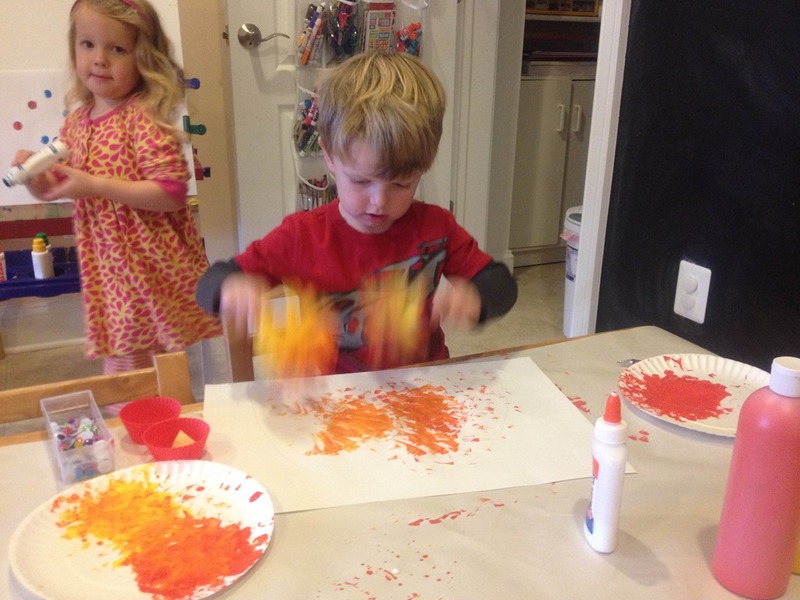 I gave them strips of orange paper and they had to use their fine motor skills to rip the paper into strips. 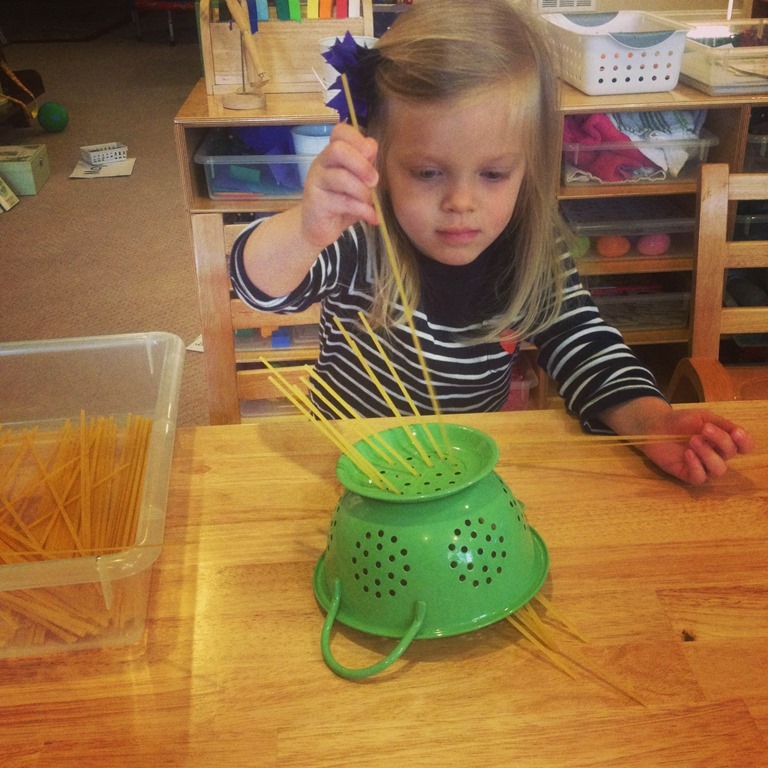 This is actually quite hard work for little hands! 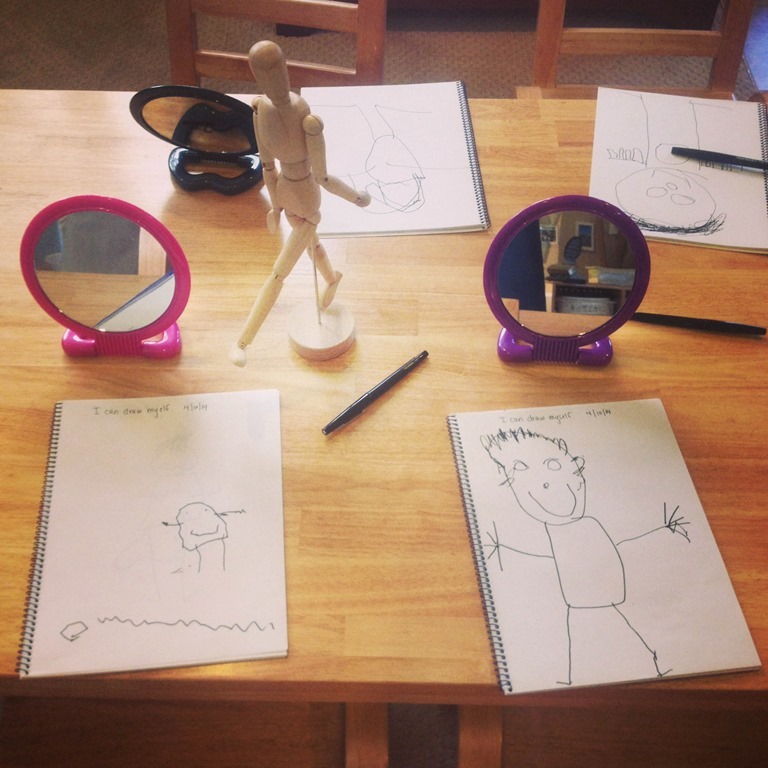 They we discussed the parts of the face, and they added eyes, drew the nose mouth and freckles. I love how different each of the leprechauns looked in the end! 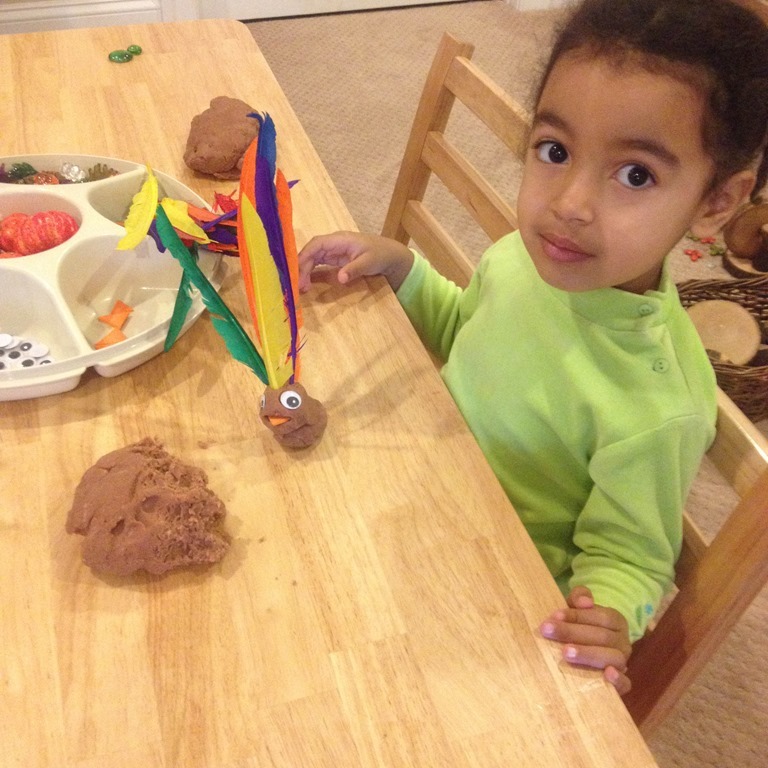 One of my favorite projects this month was our clay rainbows. 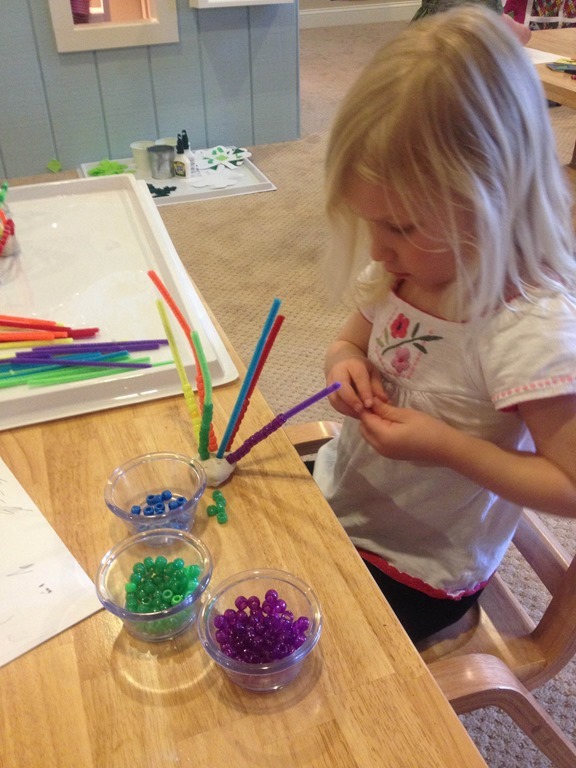 Above C is beading each of the pony beads onto the pipe cleaners of her rainbow. 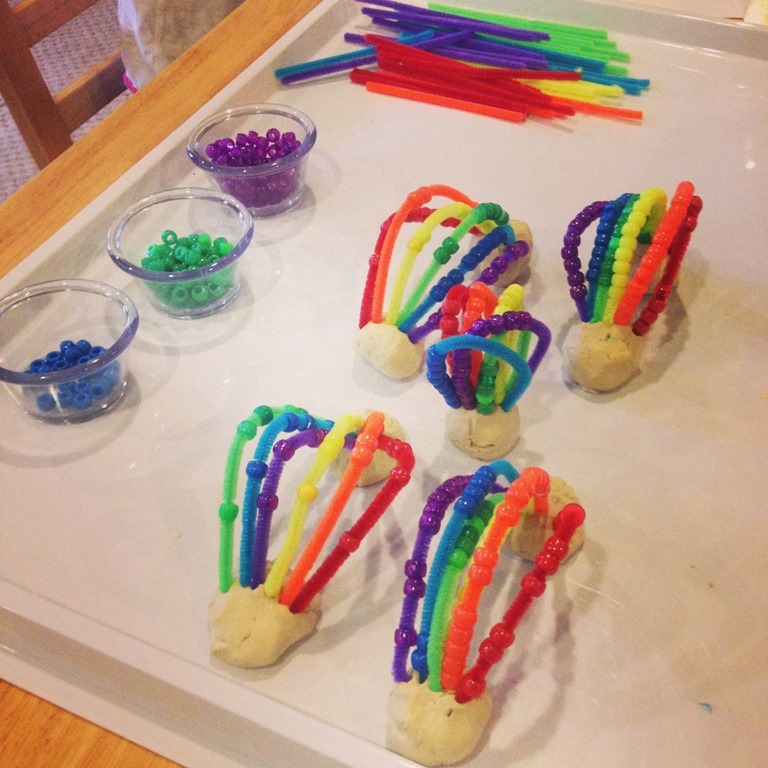 Once they were happy with the amount of beads they added to the pipe cleaners, we rolled a second ball out of clay for the other side of the rainbow. Isn’t the finished project amazing?! Again, I love how all of the rainbows are a little bit different (including Ls rainbow in the middle that just has one cloud)! 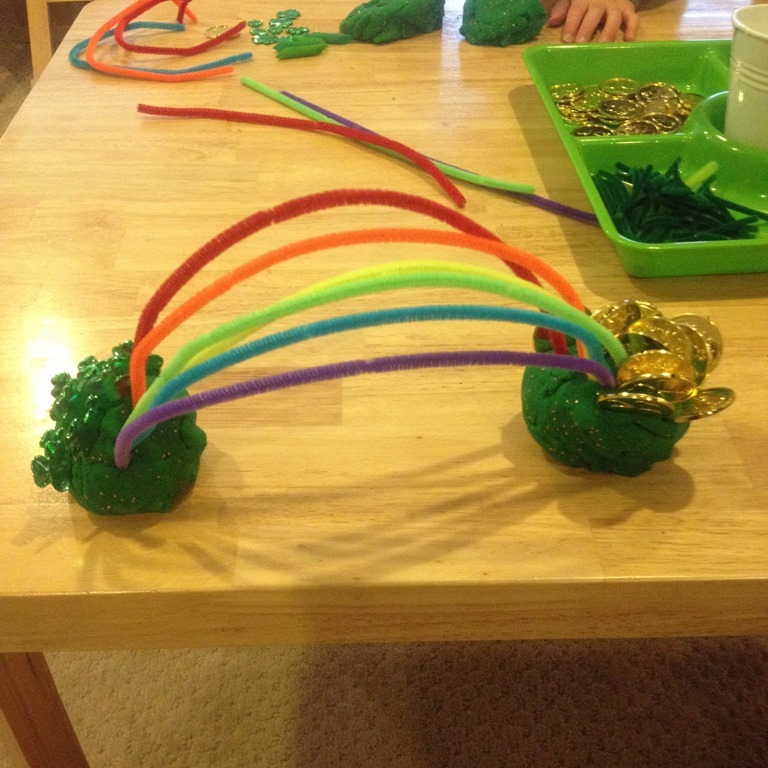 We also made shamrocks by rolling around marbles! 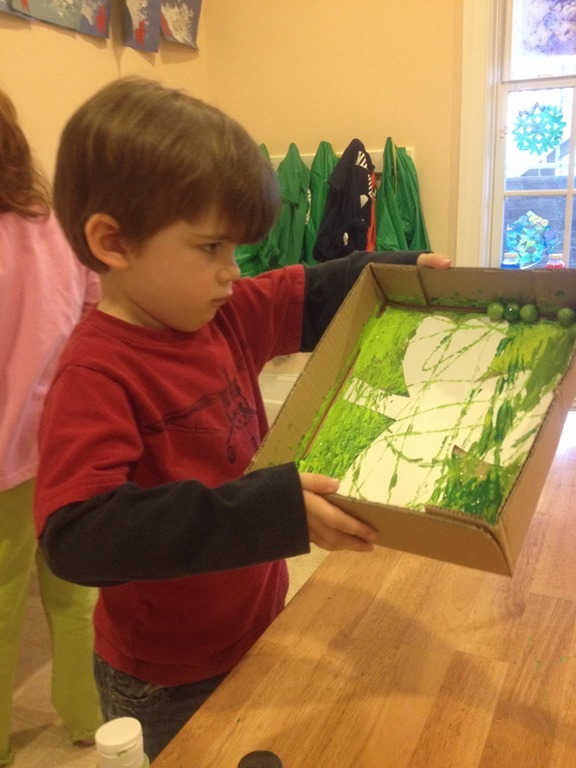 L is working on his shamrock above and you can see the amount of concentration he has on his project. 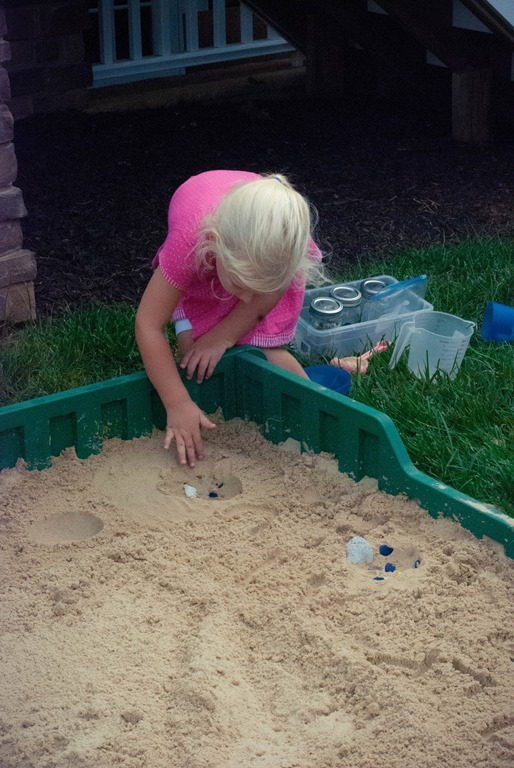 It takes a great deal of hand-eye coordination to get the marbles to roll the way they wanted them to in the box! 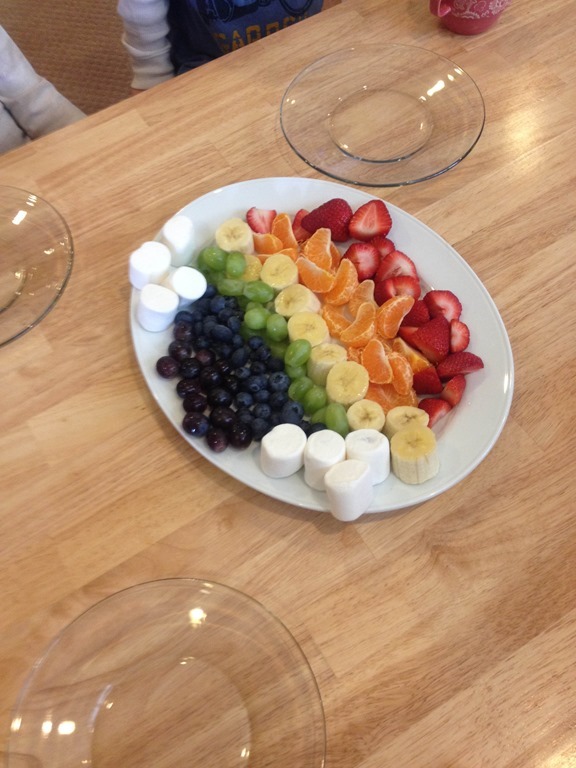 I asked each child to contribute one part of our rainbow snack activity (thank you Moms!!) 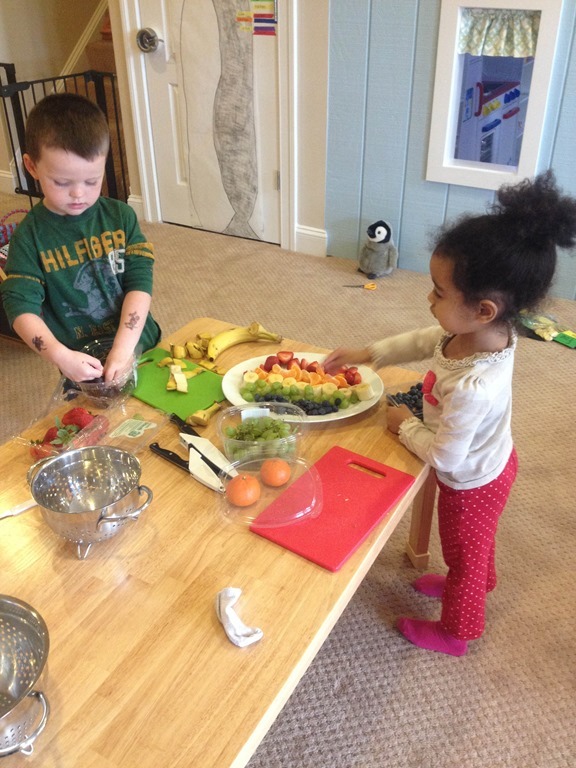 Everyone participated in helping to make our snack! After washing their hands each child got to peel, cut or place their fruit in the correct order of the rainbow. 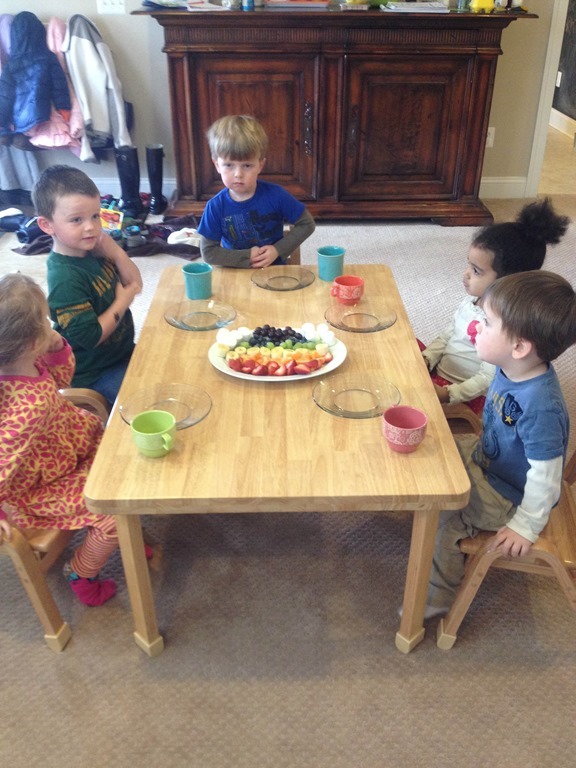 This was such a simple snack of all fruit, and was gobbled up by the children! Below is my attempt at a group shot! 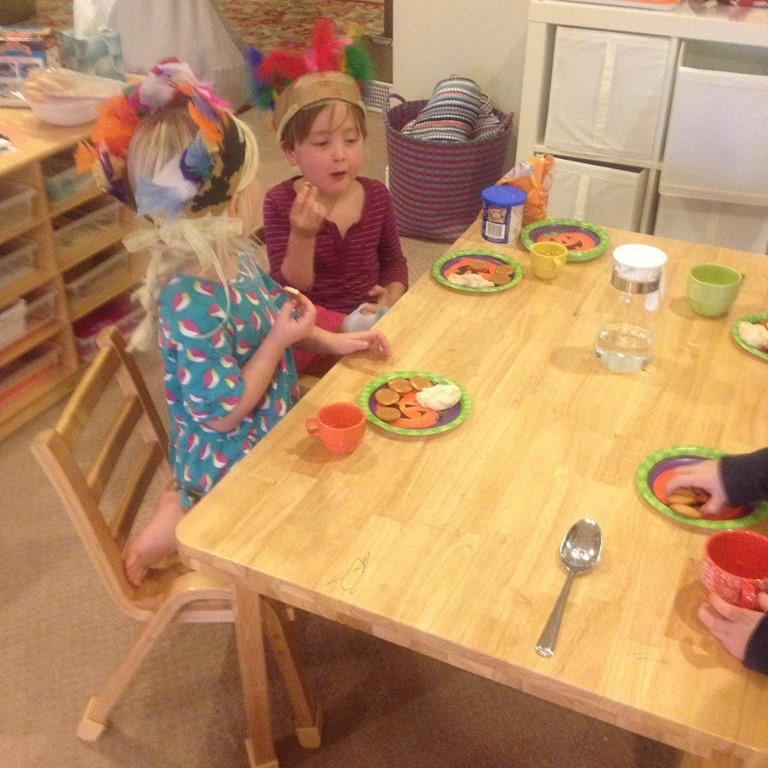 They really were excited about the rainbow snack, I promise! 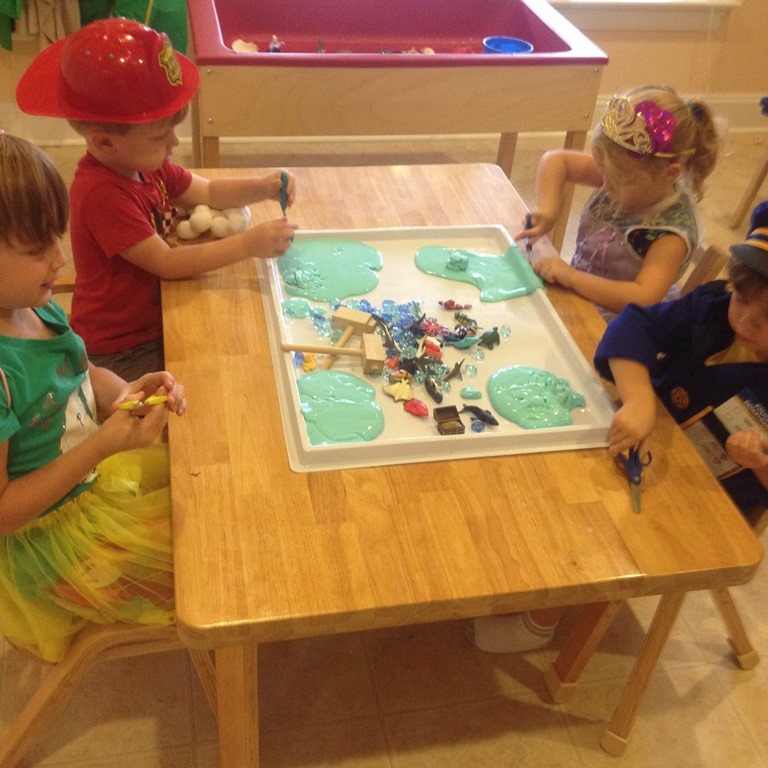 In my last blog post about Dr. Suess, I forgot to include my “Green Eggs and Ham” sensory table that we had up last month. 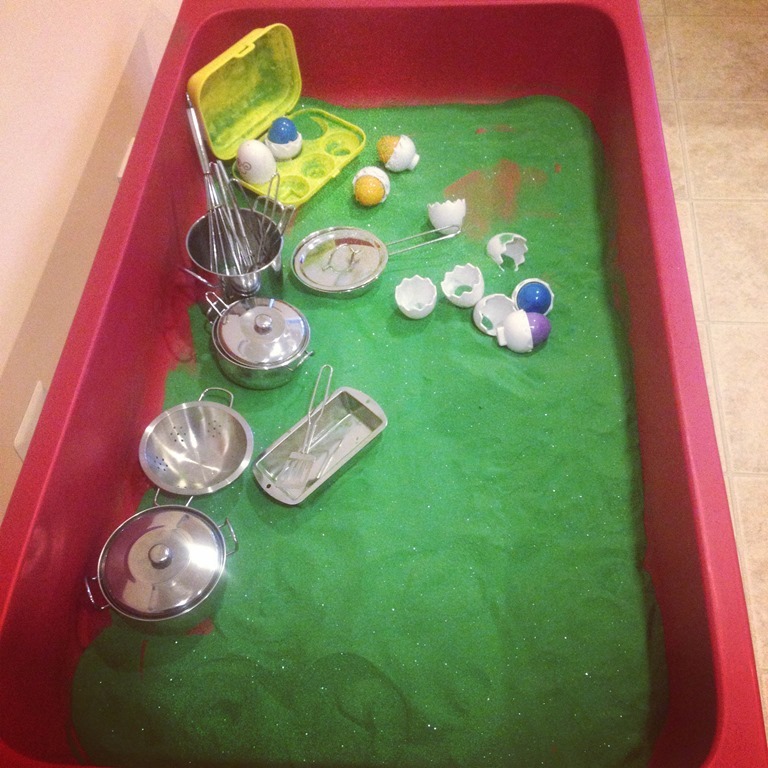 For this sensory table I lined the bottom of the tub with green colored sand, added the pots and pans from our kitchen, along with some of my youngest daughter’s egg toy. 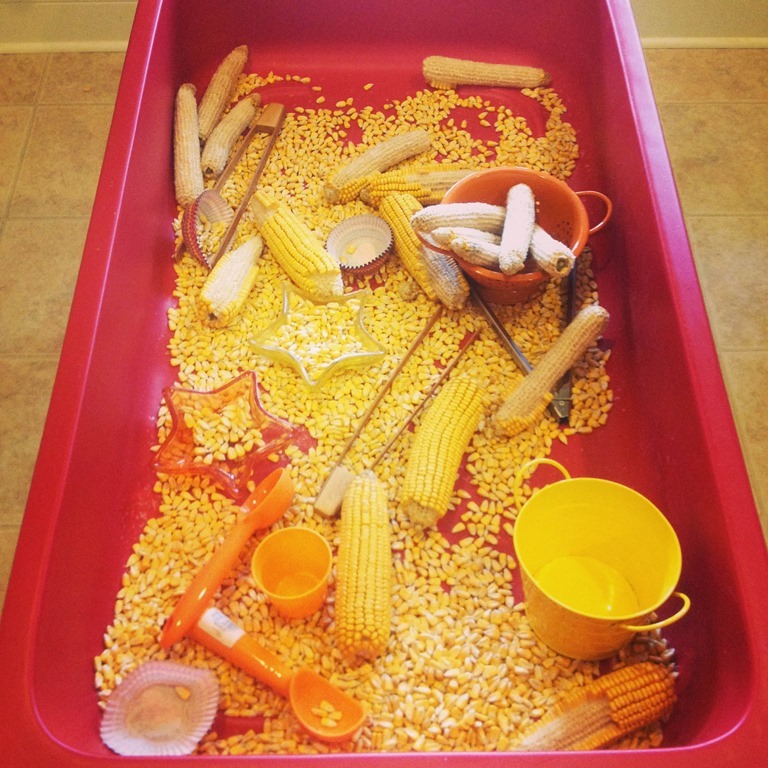 There was quite a bit of baking and imaginative play that took play in this tub! 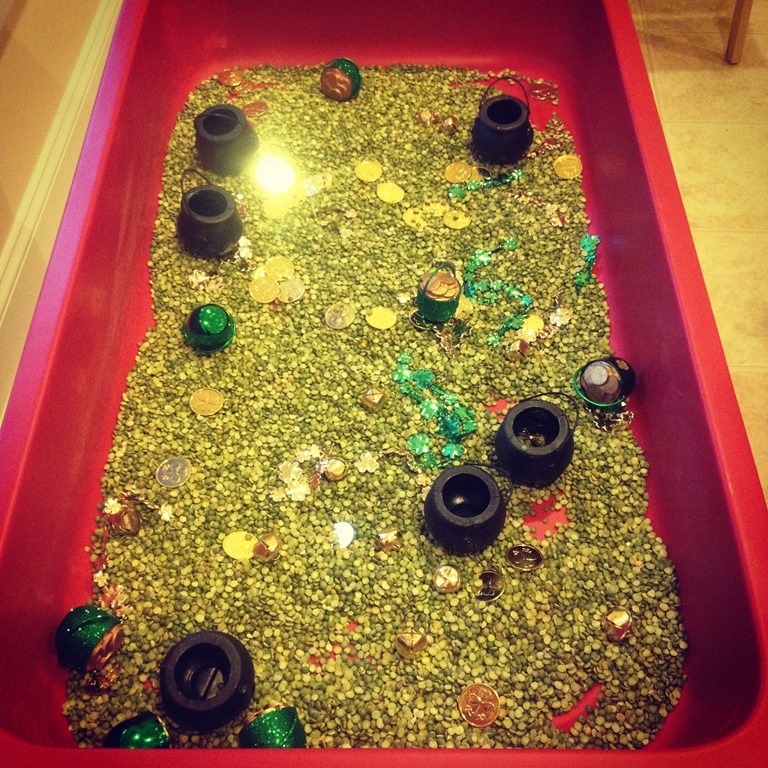 Our St. Patrick’s Day tub was filled to the brim with split peas, gold coins, pots of gold, and shamrock treasures. 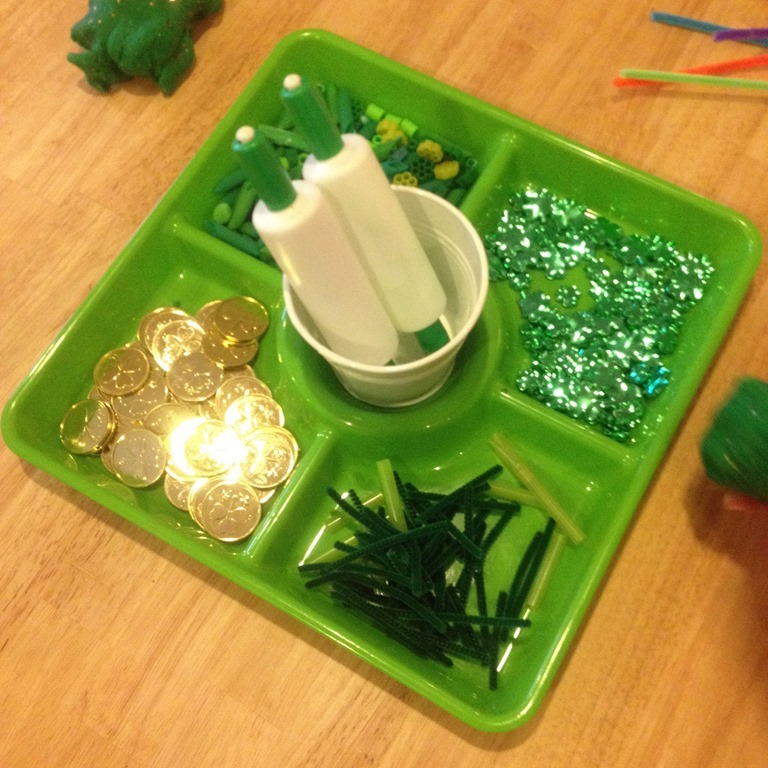 It was used again and again for pouring, scooping, hiding, counting, and talking about all things green! For the first time we explored Jell-O in school. I made a very large batch of green Jell-O. I cut the Jell-O into small squares and laid it on one of our large white trays. 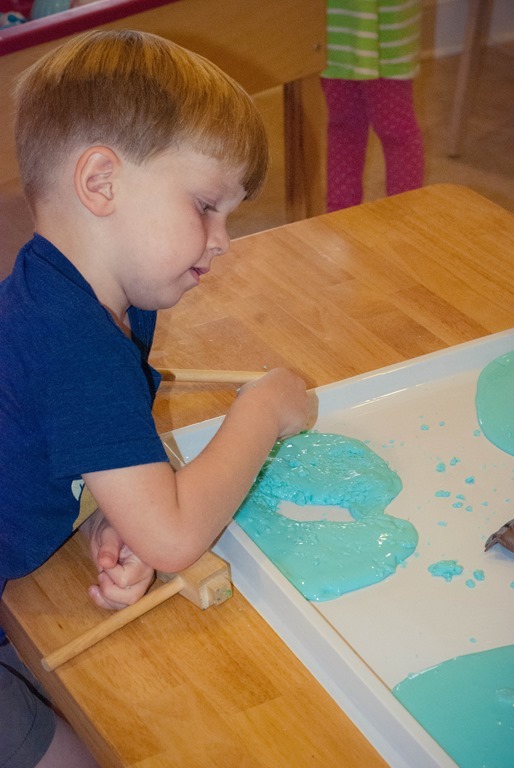 They children spent time exploring it, squishing it, and using their hands to investigate the different texture of Jell-O. 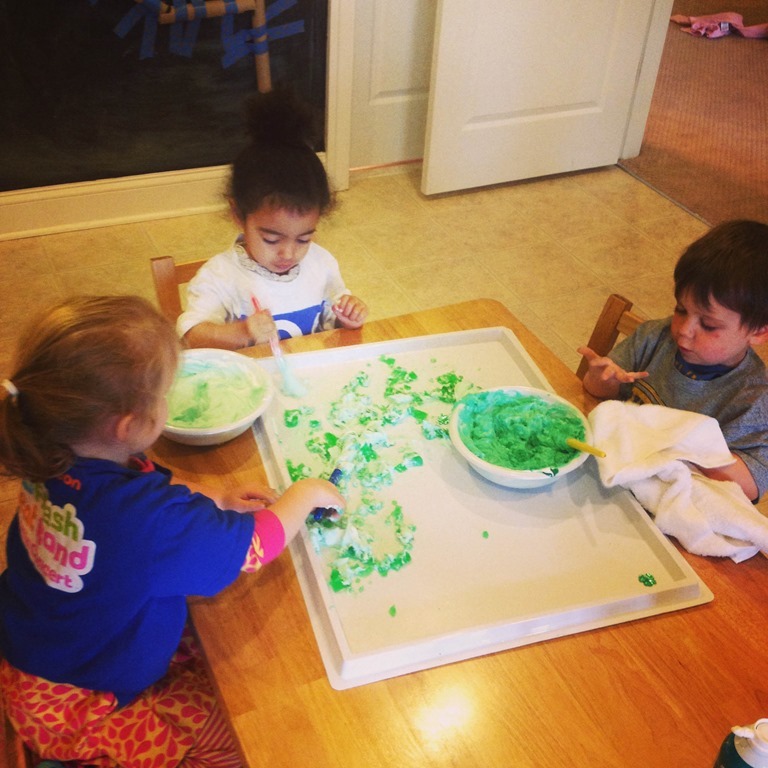 After they had explored the Jell-O, I added a bowl of green shaving cream and some paint brushes. I didn’t give them any directions for this portion of the exploration. 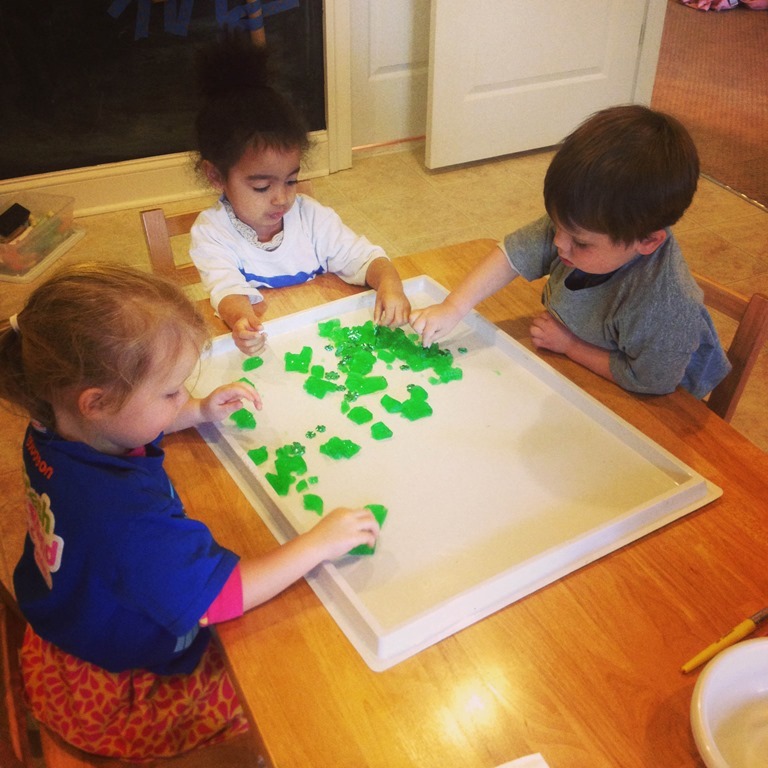 They enjoyed scooping the green cream onto the Jell-O tray and mixing it up. 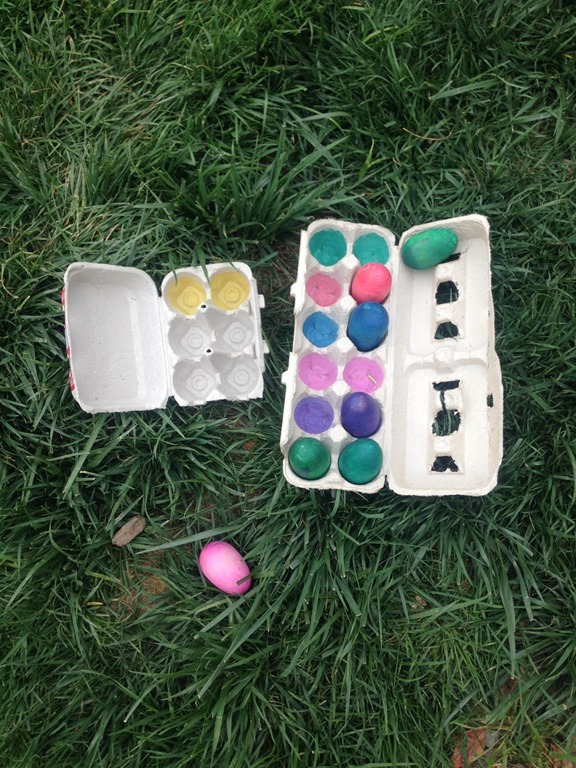 I made a batch of homemade paint last month too! I mixed clear hair gel (from the dollar store), liquid watercolors, and confetti. 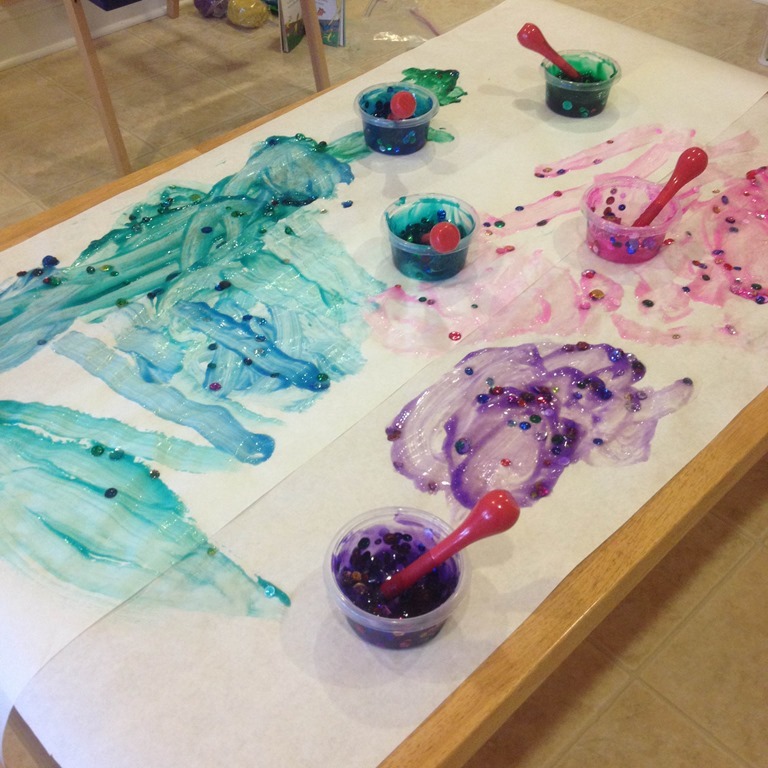 The gel give the paint a shiny texture and is sticky enough to pick up the confetti as you paint with it! This paint tends to bleed while it dries, so I simply rolled out large pieces of butcher paper to let them paint on. 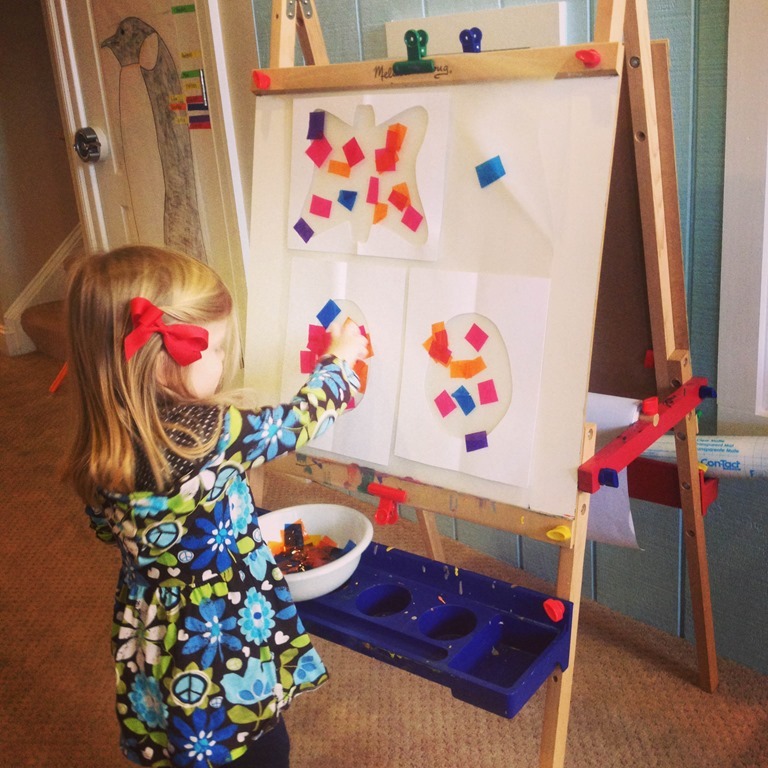 Another theme that I wove into March was a discussion on shapes! We read a few shape books, and we will be re-visiting shapes again in May. Both of these great art ideas below came from two websites I highly recommend. I actually get both of them sent directly to my email account when they post a new blog post. 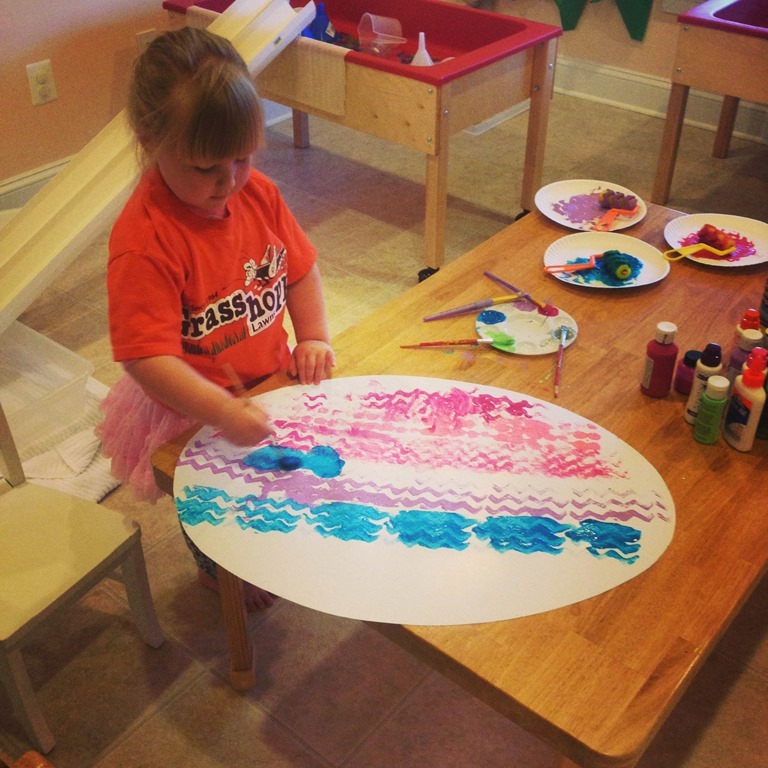 In the picture above I drew on large pieces of finger painting paper with a sharpie different shapes. 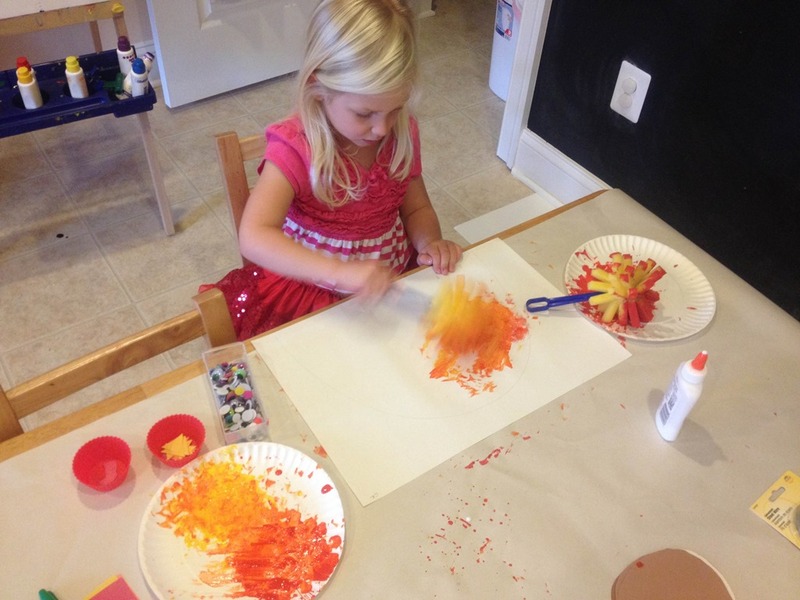 I ordered these wonderful confetti finger paints from Discount School Supply and they are really great. 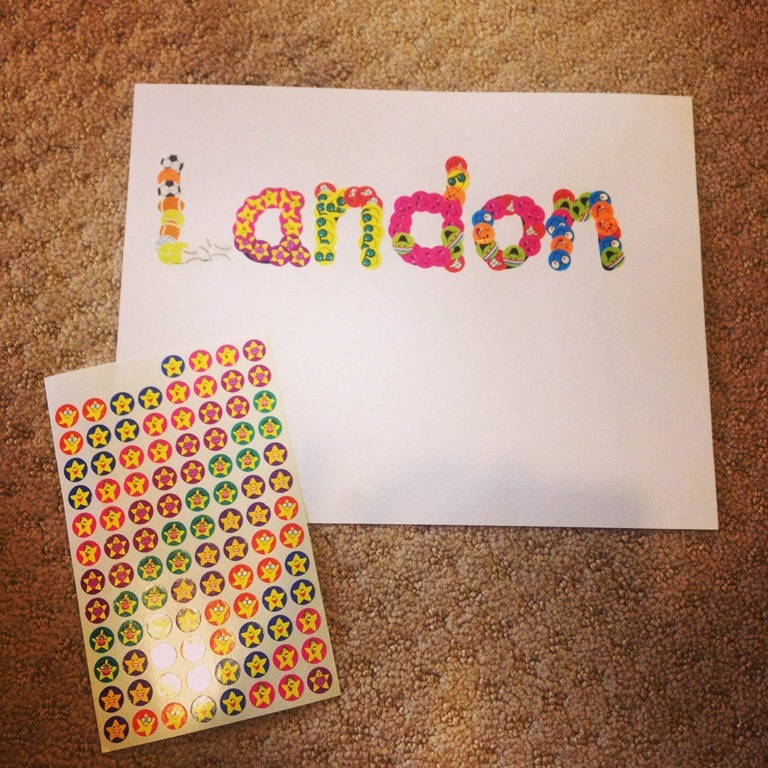 The colors are vibrant and each color has different little pieces of confetti in the paint. 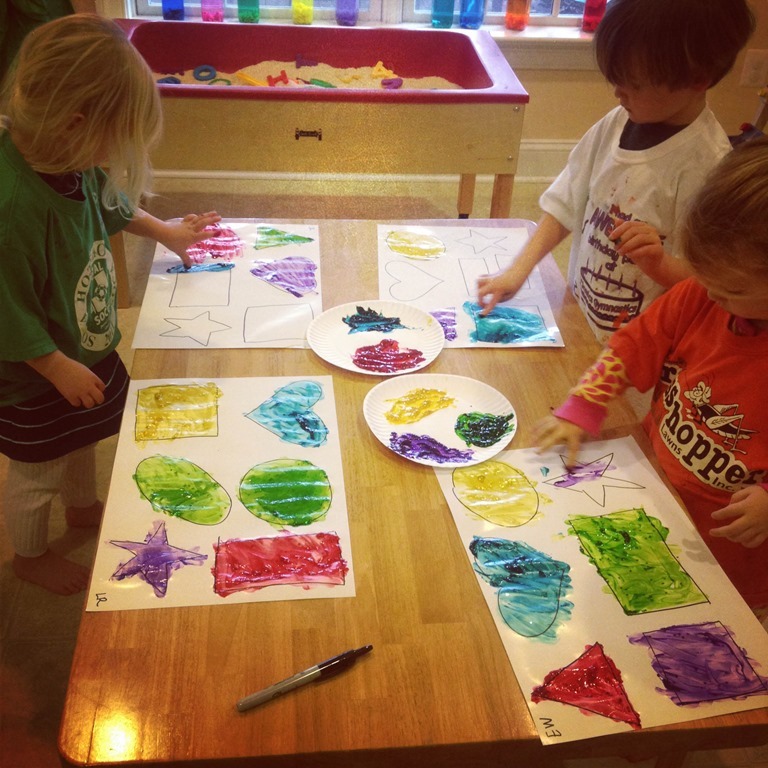 They had to use the finger paint to fill in the shapes on the paper. 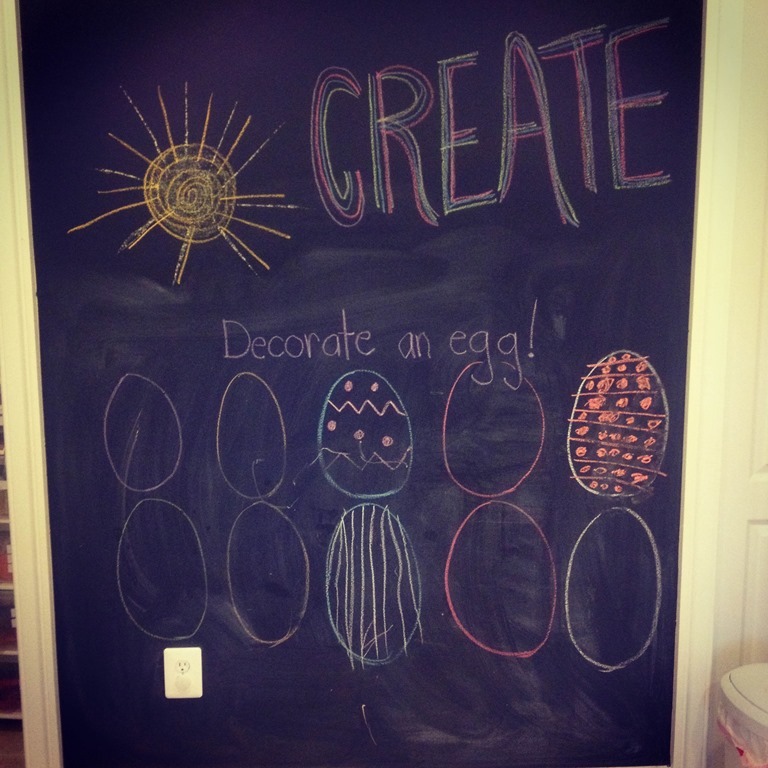 I saw this idea on Fun at Home With Kids! 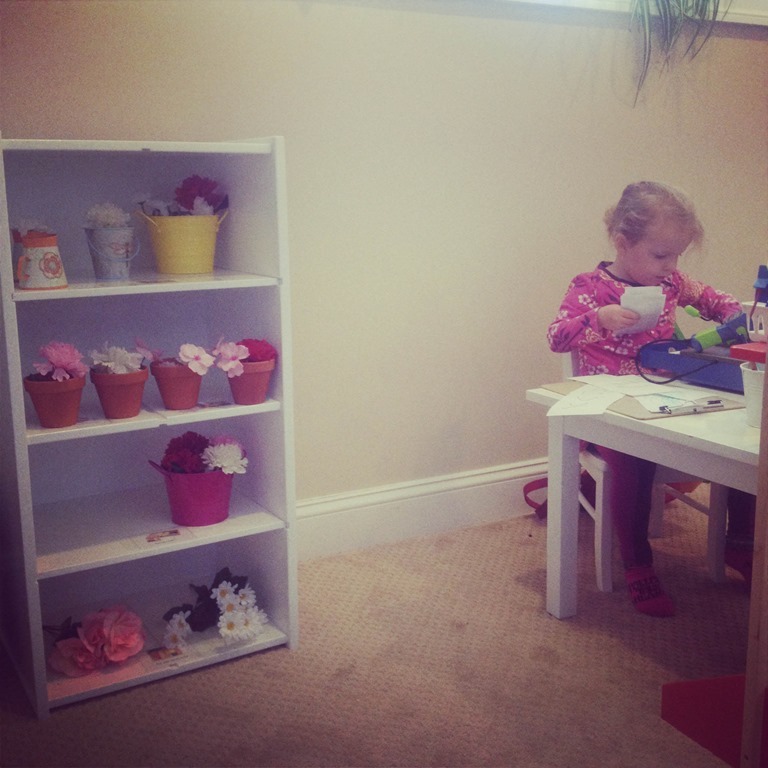 It is a wonderful blog, packed full of ideas! 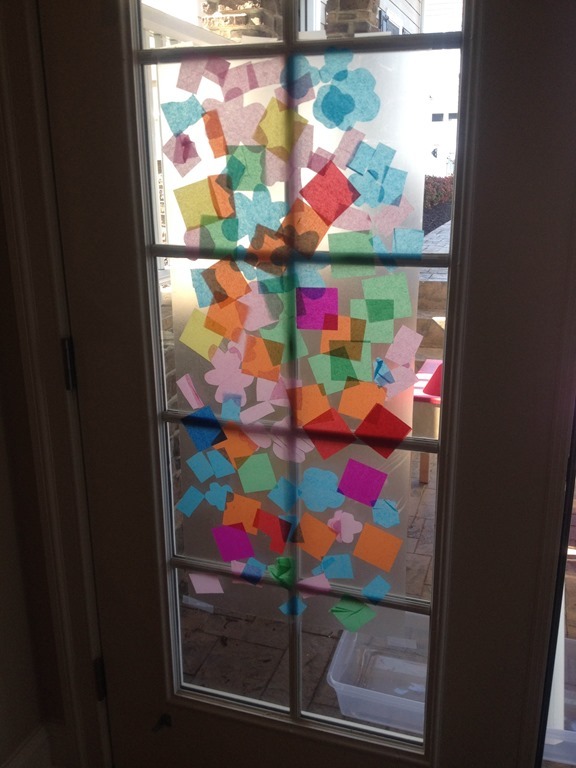 Another great shape project we did last month came from the Imagination Tree blog. 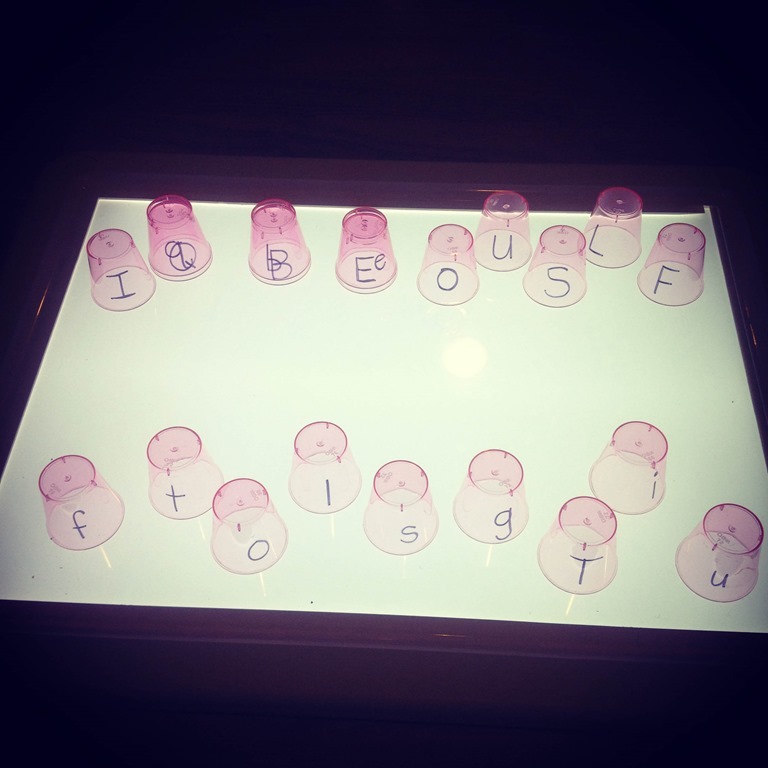 She posts about all sorts of things from sensory bins, art projects, and homemade light tables. 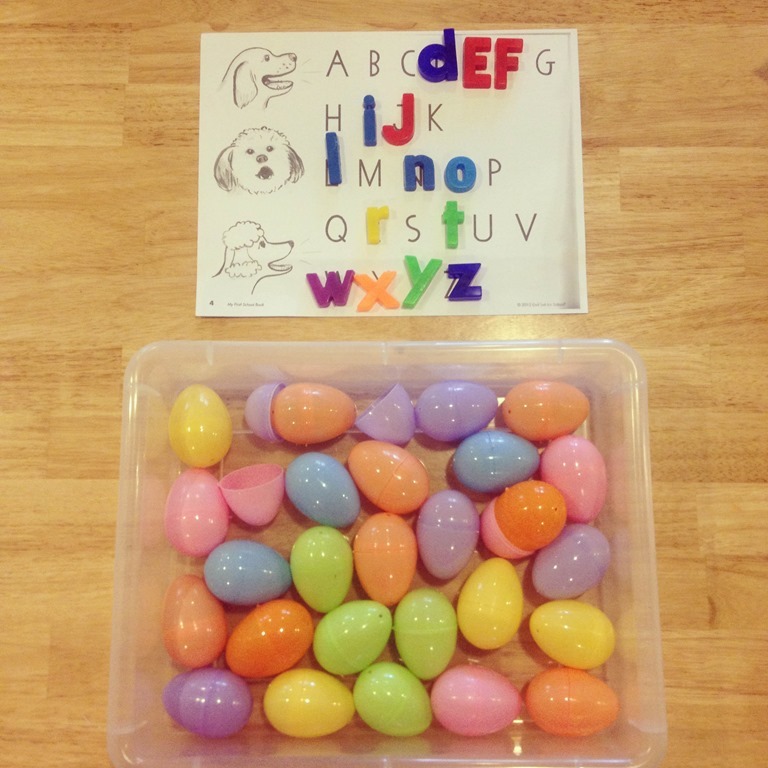 This activity was so simple and cheap too! 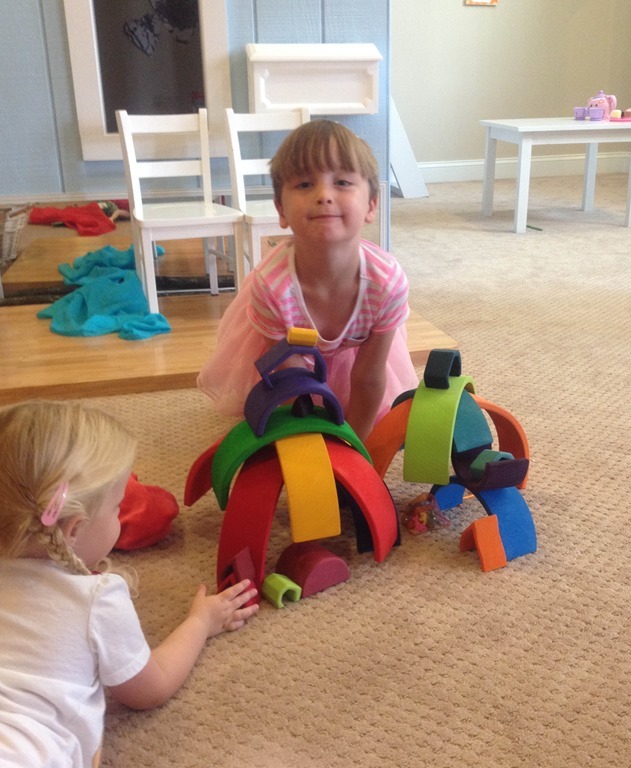 I took old cardboard tubes and bent them into different shapes. 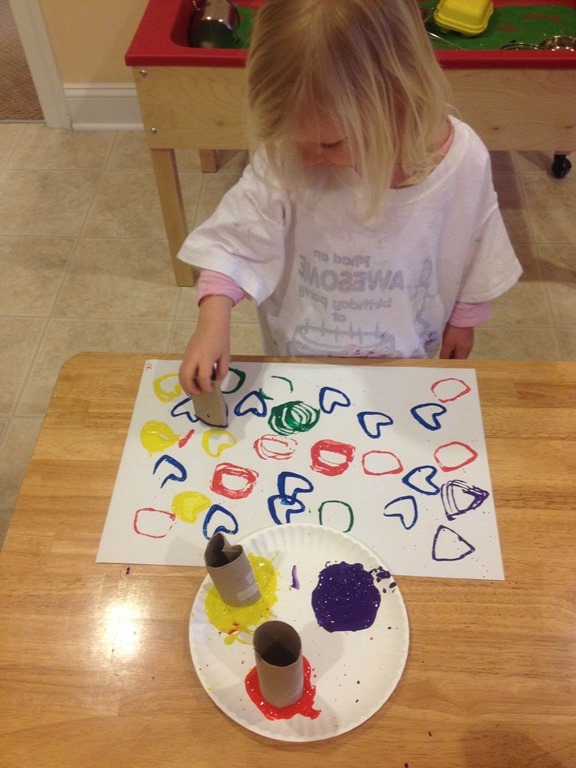 The kids used the tubes as stampers and put the tube in the paint and stamped it onto the paper. 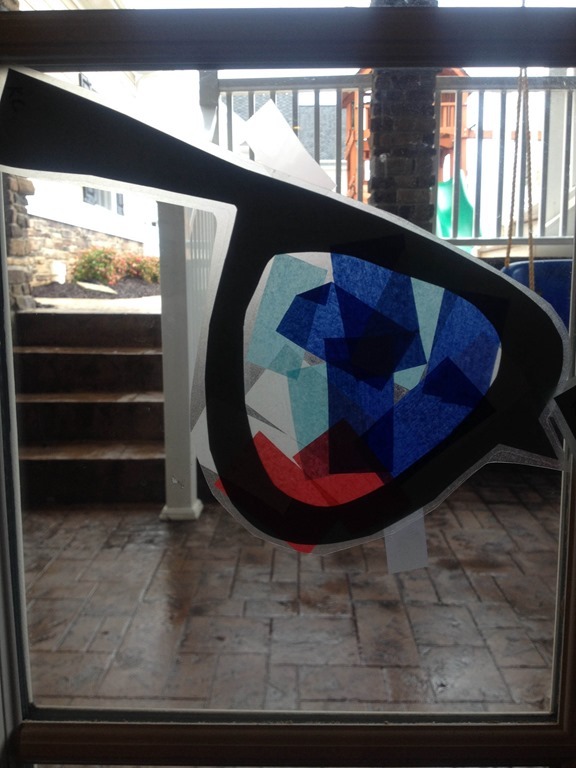 Great for shape recognition and color re-enforcement! I will stop here, but I still have more to share from last month’s adventures! Stay tuned! 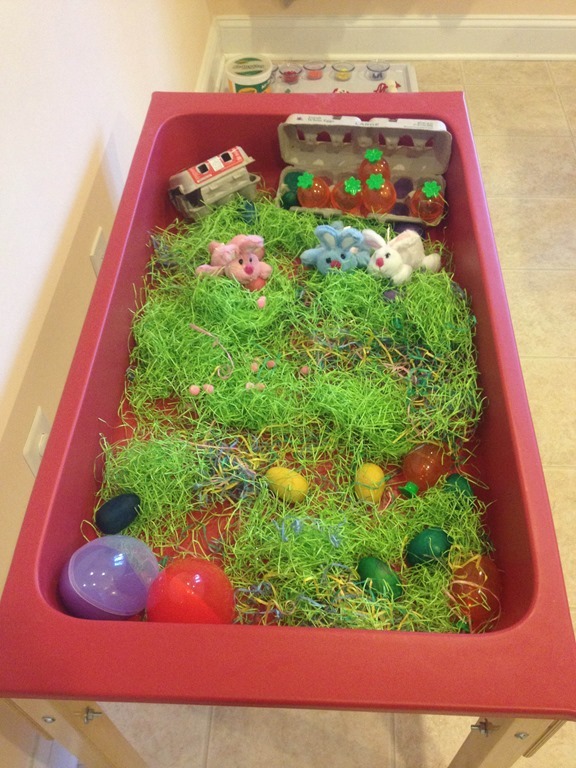 Categories: education, home preschool, play based learning, preschool, reggio emilia inspired, sensory play | Tags: blogs I love, holidays, play based learning, play dough, preschool art, preschool crafts, preschool math, process art, rainbows, sensory bins, sensory materials, sensory play, sensory tables, st. patrick's day | Permalink.